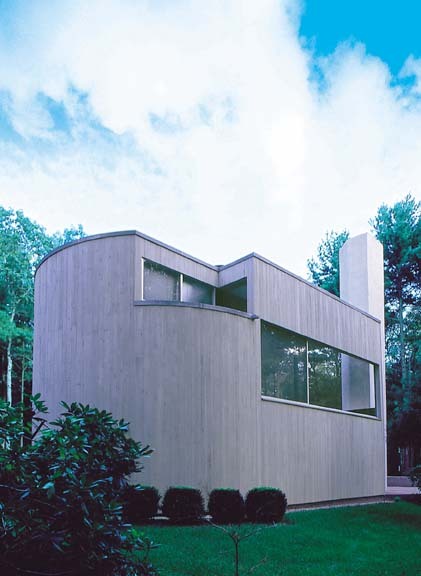 Gwathmey was a native of Charlotte NC. His mother was the sister of Walter Hook, a respected Charlotte architect whose work included Mercy Hospital, Carolinas Medical Center, Presbyterian Hospital in Charlotte, and the Veteran's Administration Hospital in Salisbury. 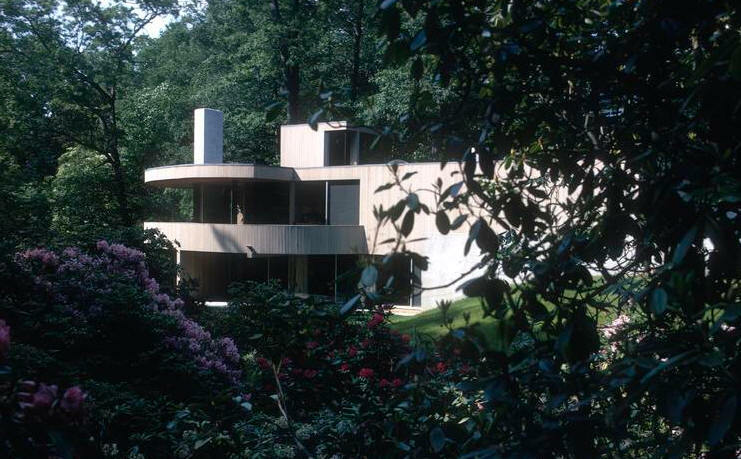 Gwathmey's grandfather was C. C. Hook who designed projects at Duke University over 30 years. After his family moved to New York City, he attended the Fiorello H. LaGuardia High School of Performing Arts, graduating in 1956. 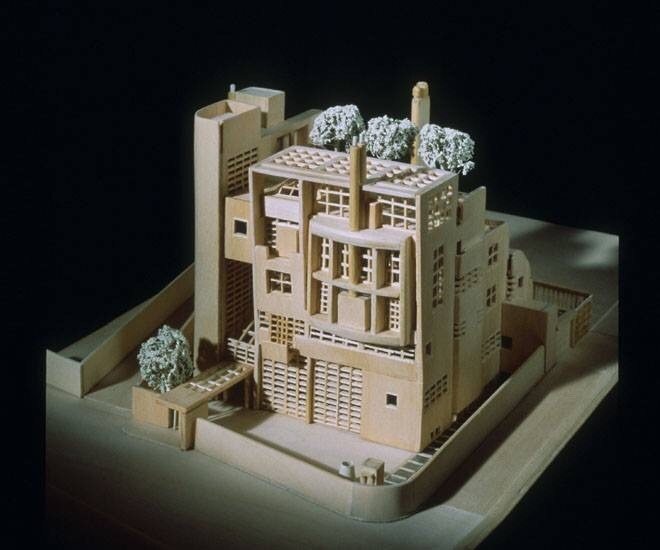 He studied architecture at the University of Pennsylvania and Yale University, receiving a Master of Architecture degree in 1962 at the latter. 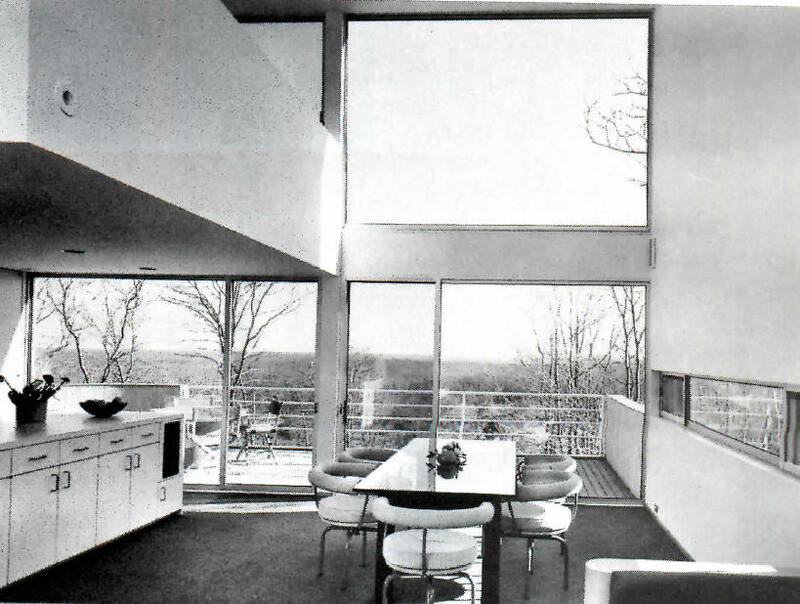 At Yale, he studied under Paul Rudolph and won both The William Wirt Winchester Travelling Fellowship and a Fulbright Grant. 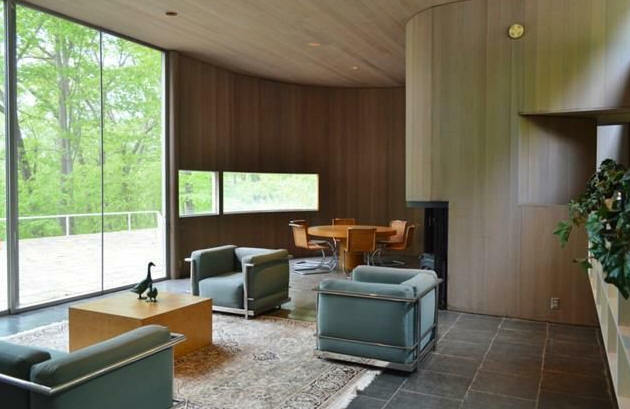 From 1962-1963 he worked for Candilis Josic Woods in Paris; from 1963-1964 at George Nemeny Architects in New York, and from 1964-1966 for Edward Larrabee Barnes in New York. 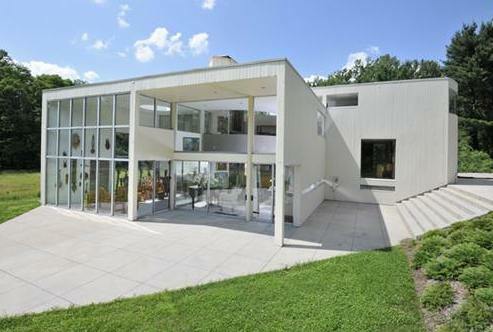 In 1966 he rose to fame for a house and studio for his parents in Amagansett NY. 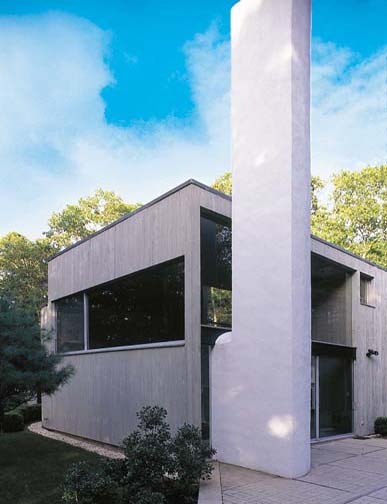 Gwathmey was not a licensed architect at the time. 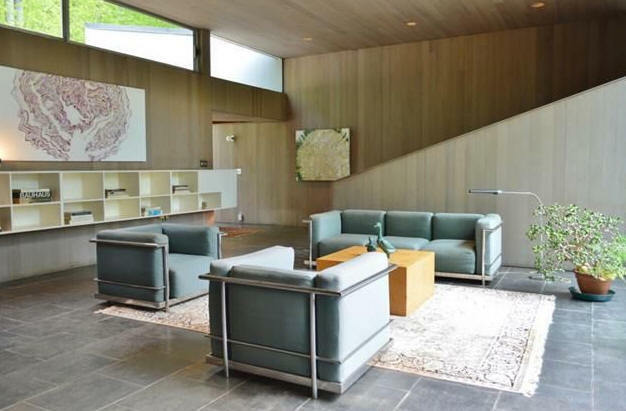 When he did take the professional licensing exam, he was surprised to see a multiple-choice question on the test that asked "Which of these is the organic house?" 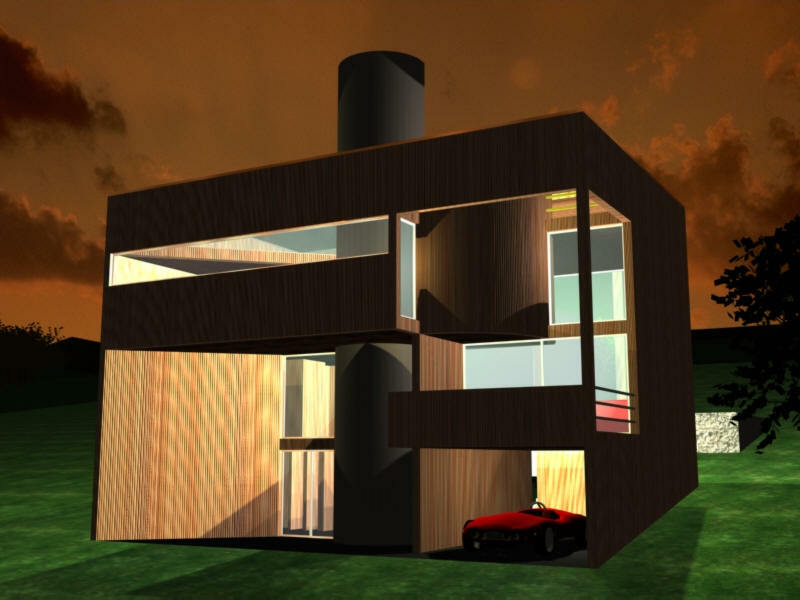 The choices included the house he designed for his parents. 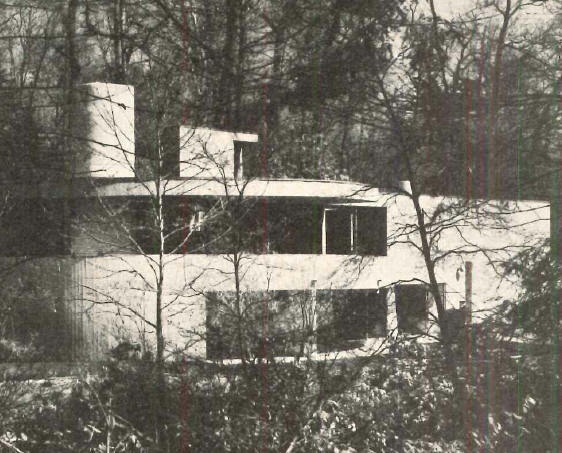 He wanted to answer that the organic house was his, but in order to pass the exam he chose Frank Lloyd Wright’s Fallingwater House. He knew that was the answer they wanted. He passed. 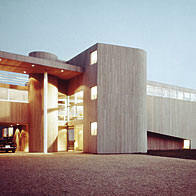 Gwathmey went into partnership with Richard Henderson to form Gwathmey and Henderson Architects. 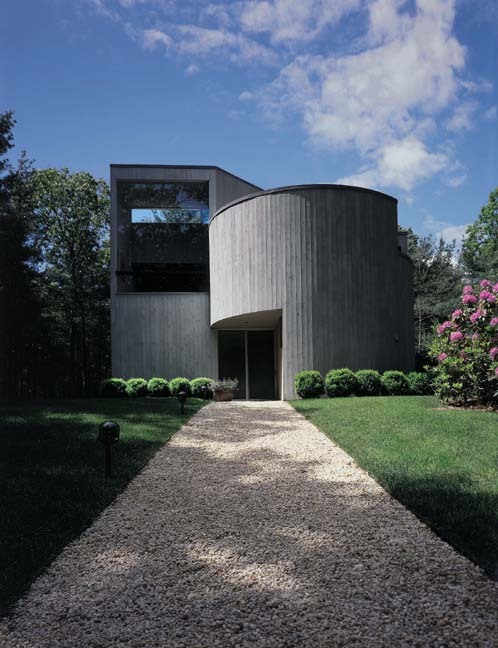 In 1968, the firm became Gwathmey Henderson and Siegel Architects. 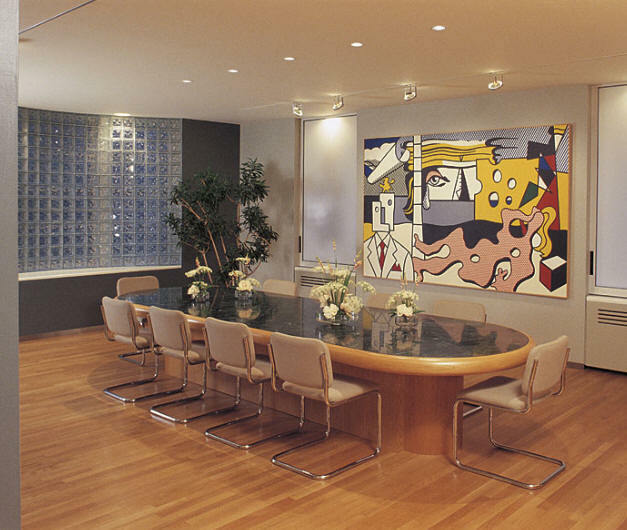 After Henderson's departure in 1970, Gwathmey Siegel & Associates was established. 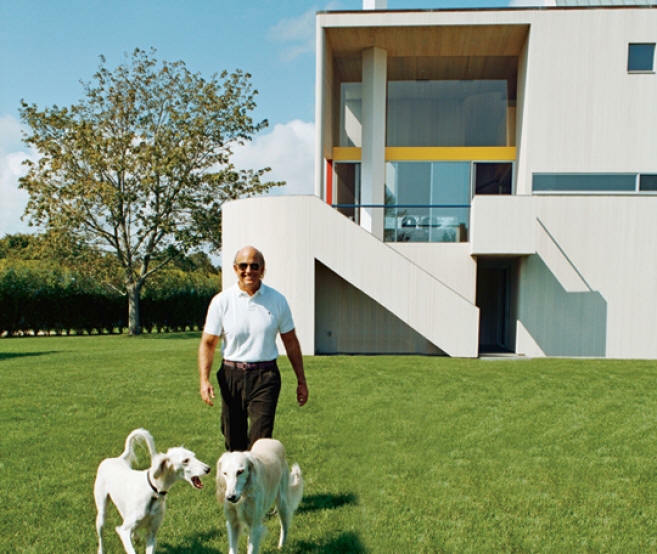 Gwathmey was one of the New York Five (plus Peter Eisenman, Michael Graves, John Hejduk and Richard Meier) who dominated avant-garde American architecture in the 1970's. They were the subject of a book published in 1972. 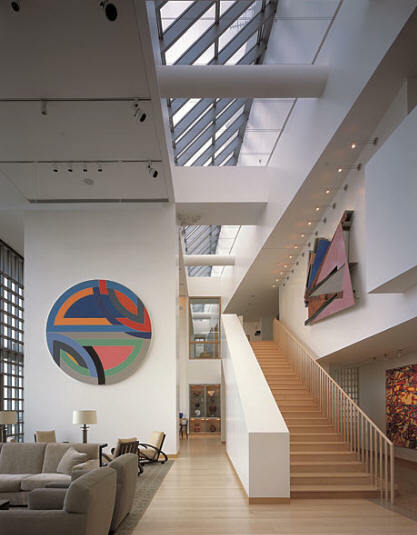 Gwathmey was honored with the Brunner Prize from the American Academy of Arts and Letters (1970) and elected to the Academy of Fellows (1976). In 1983, he won the Medal of Honor from the New York Chapter of the AIA. 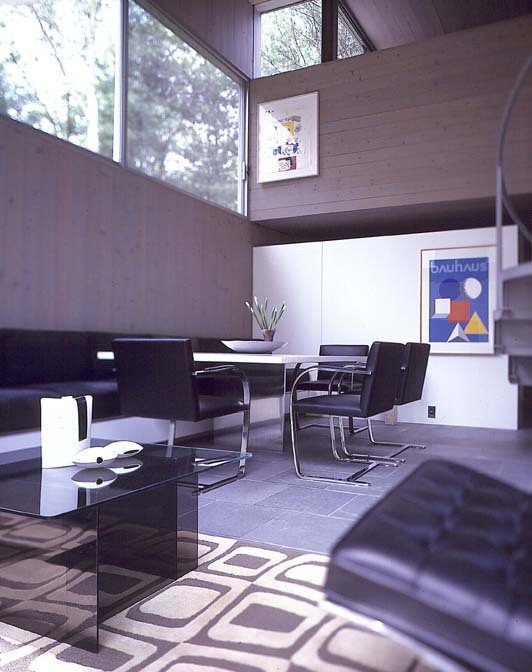 In 1985, he received the first Yale Alumni Arts Award from the Yale School of Architecture. 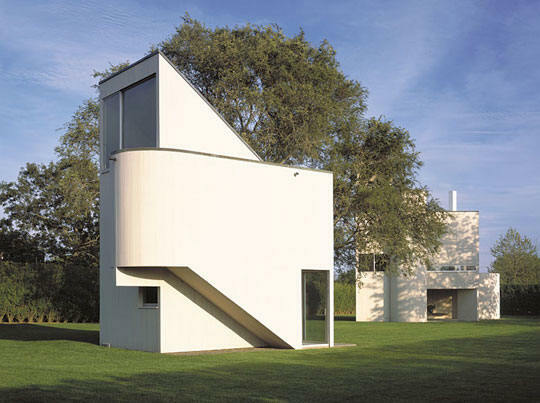 Three years later, the Guild Hall Academy of Arts awarded Gwathmey its Lifetime Achievement Medal in Visual Arts. 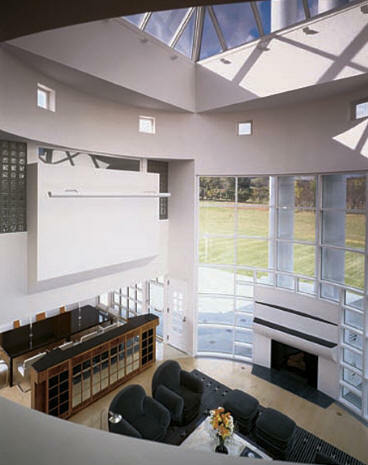 In 1990 he received a Lifetime Achievement Award from the New York State Society of Architects. 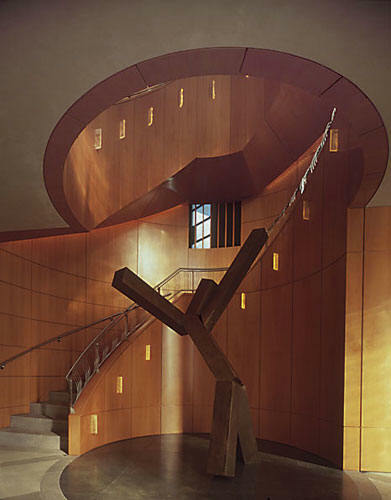 From 1965 through 1991, Gwathmey taught at Pratt Institute, Cooper Union for the Advancement of Science and Art, Princeton University, Columbia University, the University of Texas, and UCLA. He was Davenport Professor and Bishop Professor at Yale, and the Eliot Noyes Visiting Professor at Harvard University. 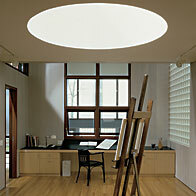 In 2005, he served as the William A. Bernoudy Resident in Architecture at the American Academy in Rome. 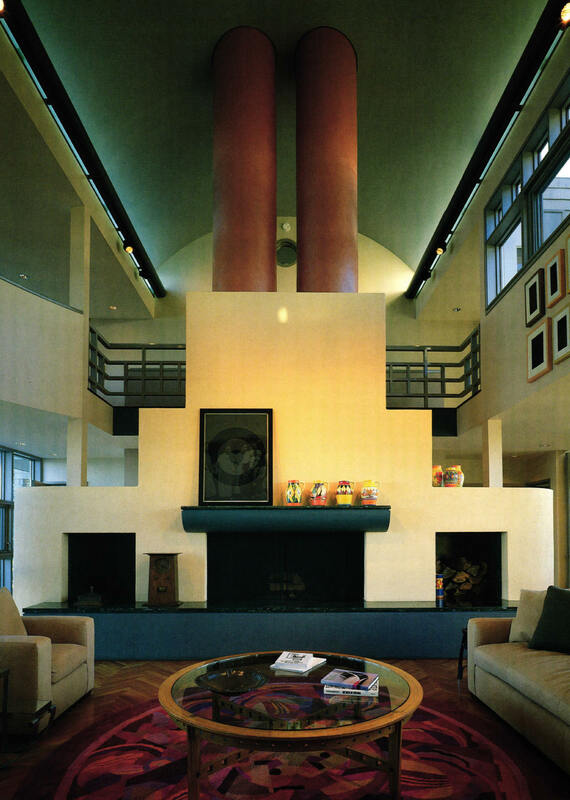 Gwathmey’s first marriage, to Emily Gwathmey, ended in divorce; they had one daughter, Annie Gwathmey. He married Bette-Ann Damson in 1974. She donated his archives to Yale University in 2010. 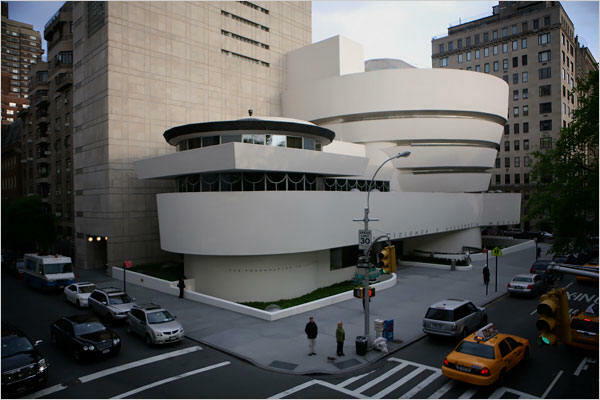 One of his most famous designs is the 1992 renovation/addition of Frank Lloyd Wright’s Guggenheim Museum in New York. 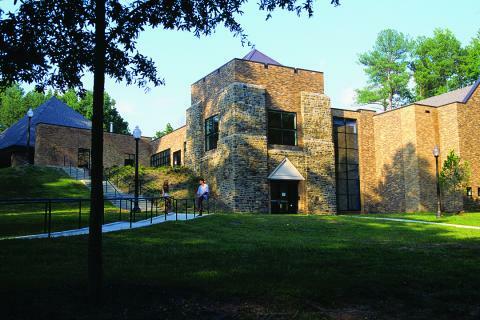 The 1994 Rubenstein-Silvers Hillel Center at Duke University in Durham. 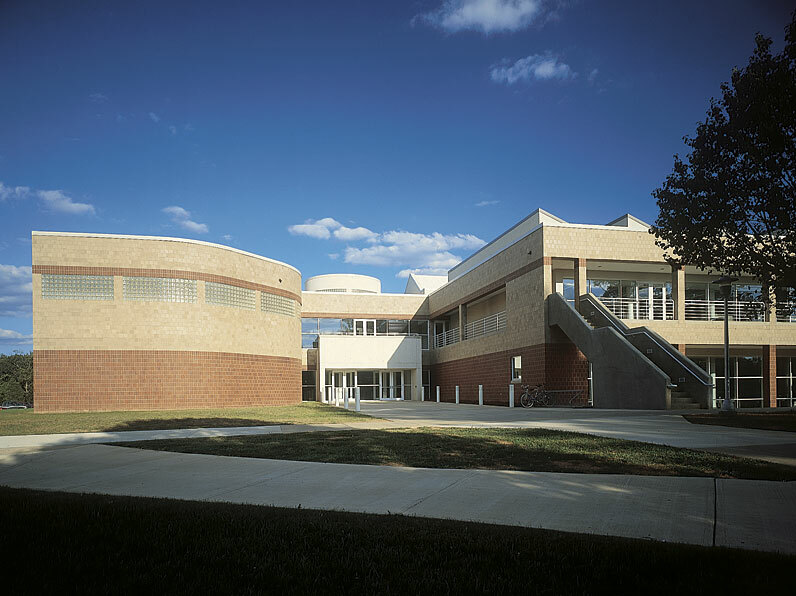 The UNC-Charlotte School of Architecture (designed with Ferebee Walters) in Charlotte. 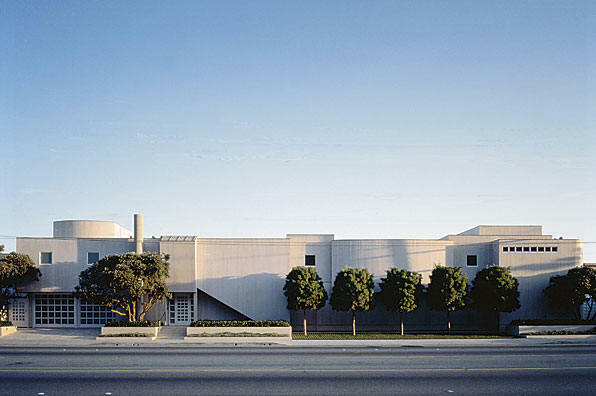 The 2002 Louise Cameron Wells Museum of Art in Wilmington. 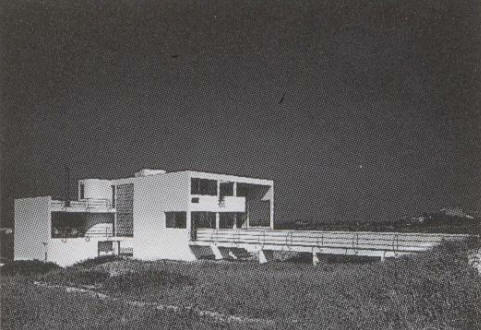 1964 - The Gerald Miller Residence, Fair Harbor area of Fire Island NY. There was no address; mail was delivered to the local post office. 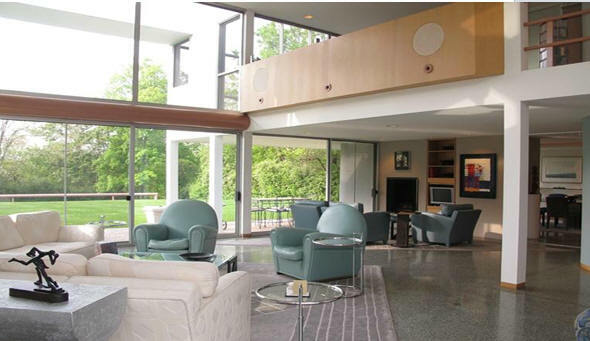 Sold around 1989, according to Miller, by an architect who worked for Barnes and Noble. Sold to a neighbor, who destroyed it for expansion of his house. 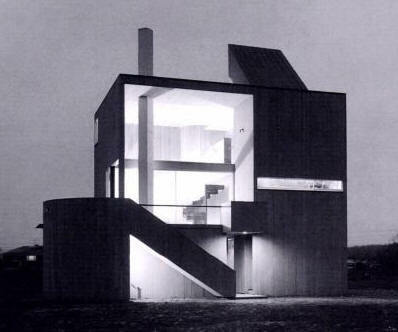 1966 - The Robert and Rosalie Gwathmey Residence and Studio, 122 Bluff Road, Amagansett NY on Long Island. 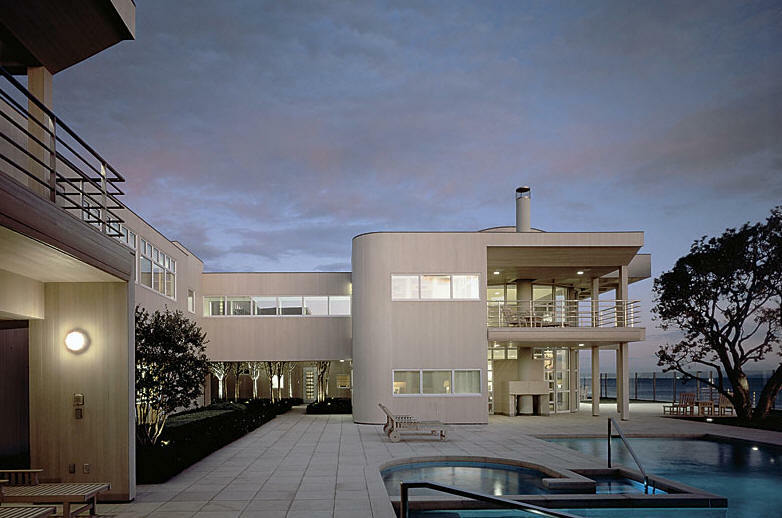 Gwathmey became famous designing these buildings for his parents. 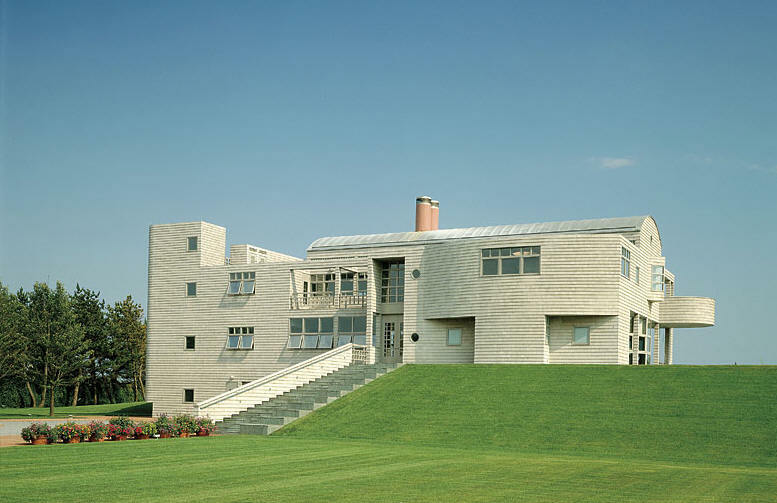 Costing $35,000, the Gwathmey houses attracted throngs of visitors and was consistently named one of the most influential buildings of the modern era. Built by John Caramagna. 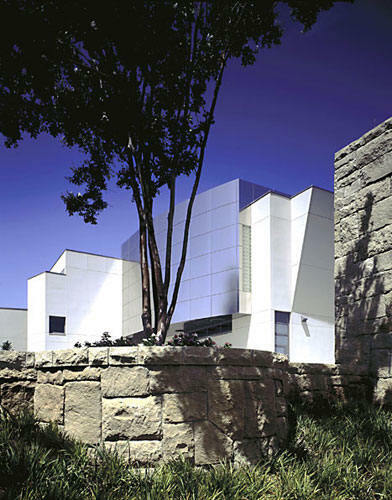 In 2001, Gwathmey inherited the house from his mother and moved in. 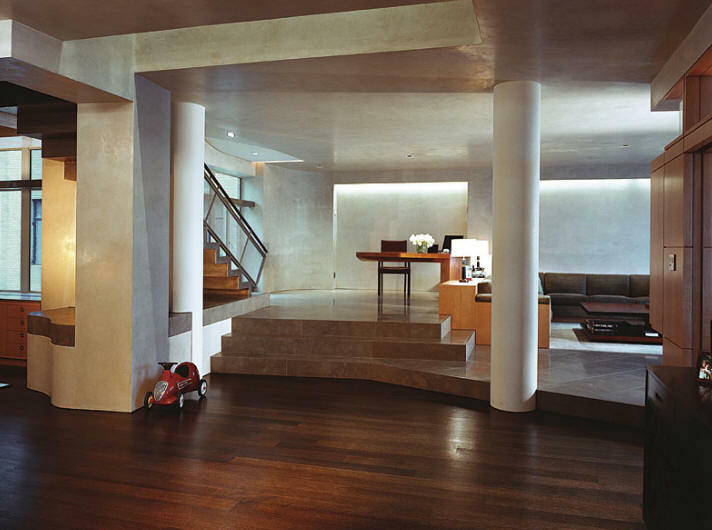 He began a renovation that included covering the original concrete floor with marble. 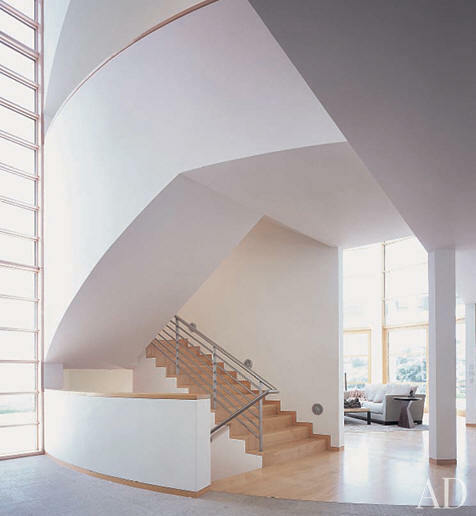 Stairs and dining room photos by Scott Francis/Esto. 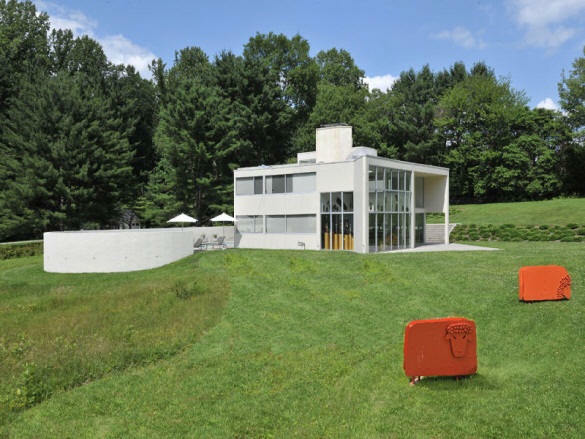 Deeded to the Gwathmey Trust. 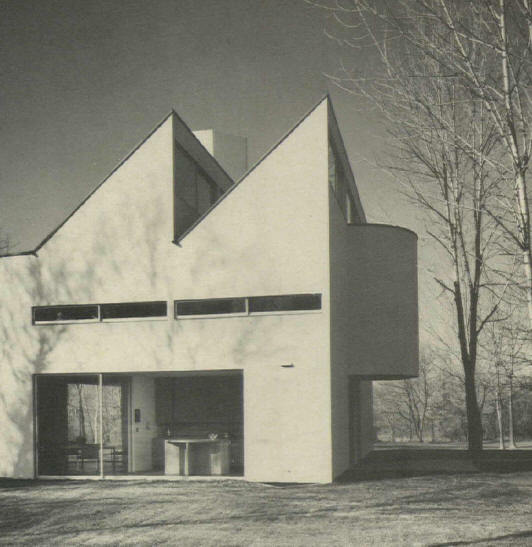 1968 - The Joseph (Joe) Sedacca Residence, 19 Northwest Landing Road, Northwest Harbor NY. 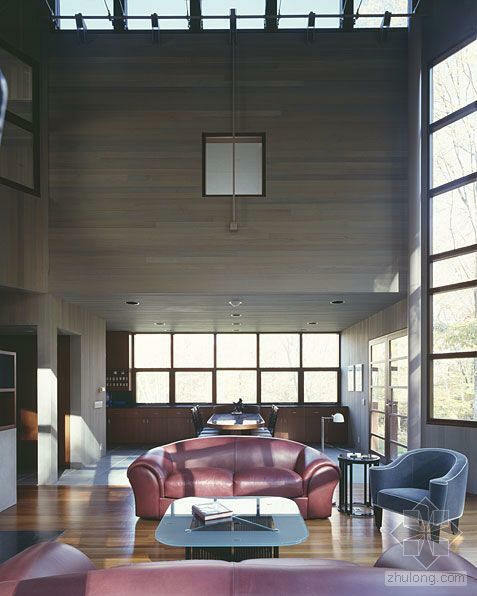 1100 square feet on three acres. Built by John Caramagna. 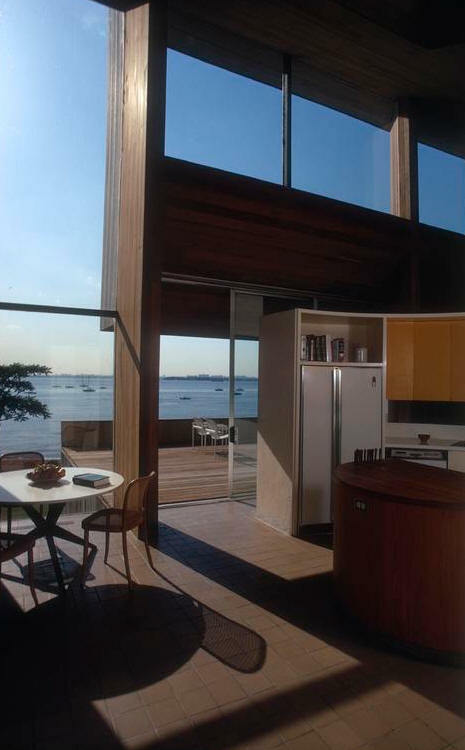 Won a 1968 AIA NY Honor Award. Sold to Paul A. Amador in 1993. Sold in 2016 to Amanda and Justin Wilkes, who added a pool and made it a rental. For sale in 2018. 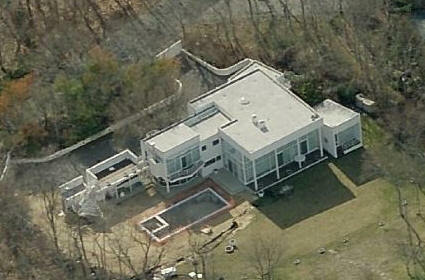 1968 - The Roger and Nina Straus III Residence, 5 Stone Bridge Road, renamed from 3558 Purchase Street, Purchase NY. 6566 sf. Designed with Richard Henderson. 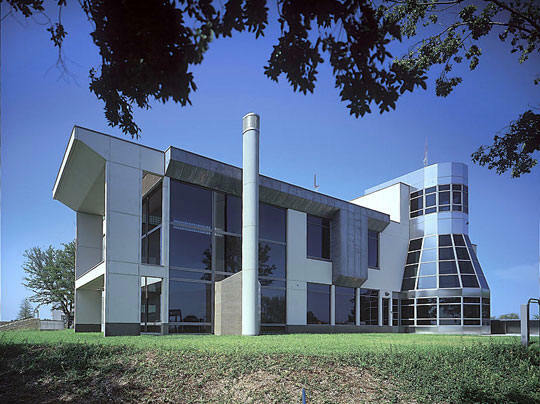 Won a 1968 AIA National Honor Award. 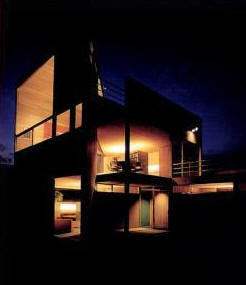 Featured as an Architectural Record House of 1968. Deeded to Nina Straus. 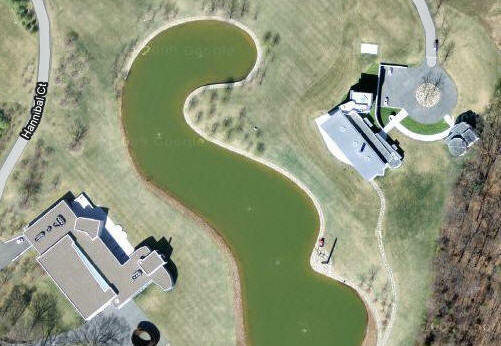 Sold in 2007 to Sarosca Farm Estates LLC who divided the land for luxury homes. The house was destroyed in 2014. 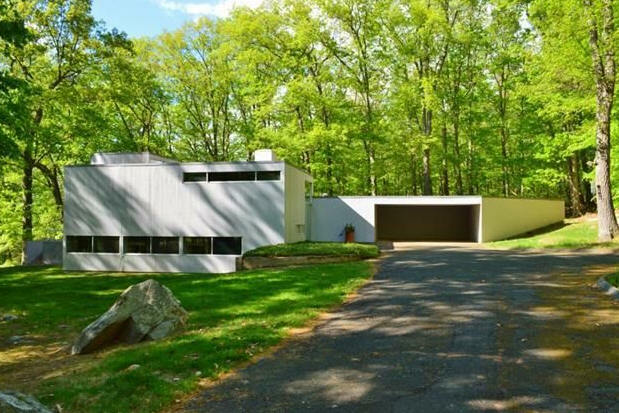 1969 - The Jack D. and Barbara Weiss Goldberg Residence, 119 Wyneding Hill Road, Manchester CT. 2367 sf. 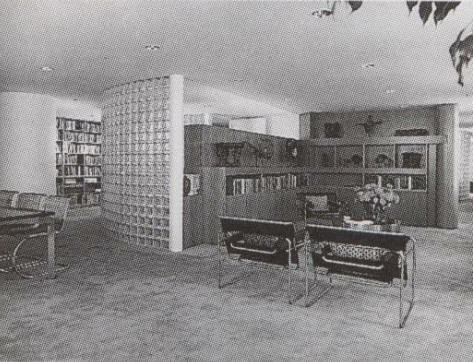 Was an Architectural Record House in 1969. Featured in the New York Times in 1969. Barbara Goldberg remarried; she passed away in 2010. Transferred to her husband, Robert P. Tucker. 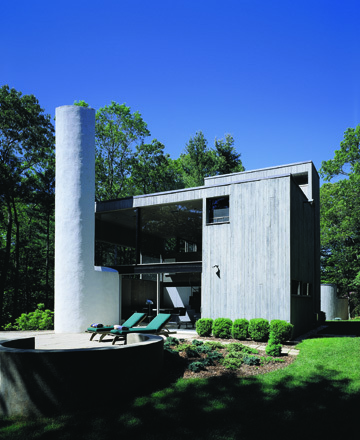 Deeded to Susan Goldberg. Sold in 2015 to Joshua Pearson and Darko Tresjnak. 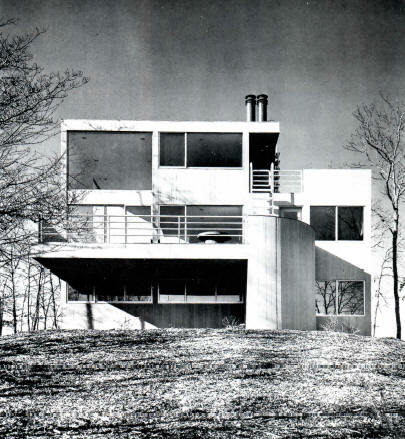 1969 - The Kenneth Cooper House, 35 Bufflehead Lane, Orleans MA. Designed with Richard Henderson and Robert Siegel. Top left photo by Bill Maris. 1263 sf. Commissioned 1968. Built by Anderson and Murray. 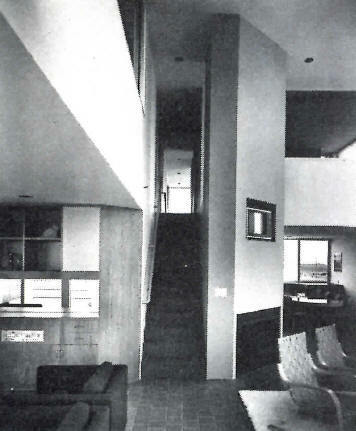 Featured in Architectural Record Houses of 1970. 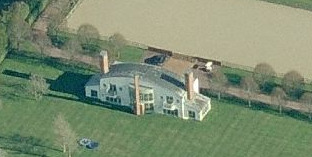 Sold in 2003 to Williams and Dorothy Carr. 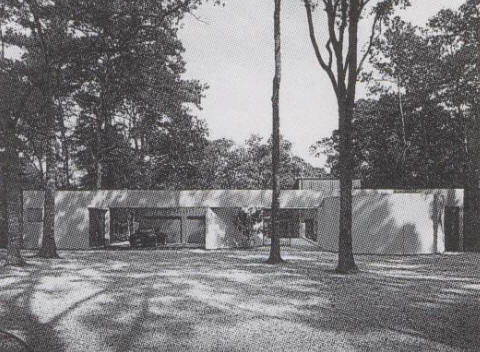 Around 1970 - The Richard Lawrence House, possibly 1 Bayport Lane North, Great Neck NY. On Kings Point in the Village of Saddle Rock. Designed with Richard Henderson and Robert Siegel. 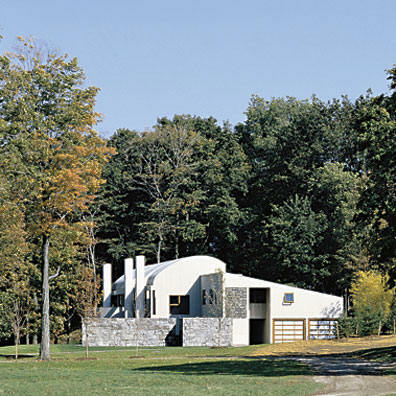 The house appears on a 1971 Gwathmey and Siegel resume. Henderson took this project credit when the partnership split. 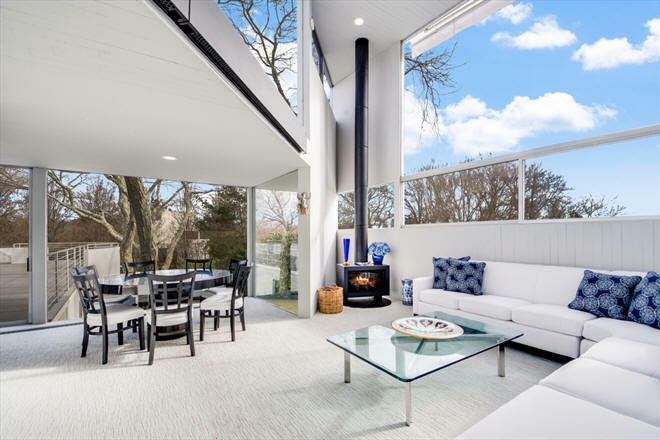 Sold in 1993 to Rhonda and Dan Levy, still owners as of 2018, who doubled it in 1996 in a similar Modernist style. Needs verification. 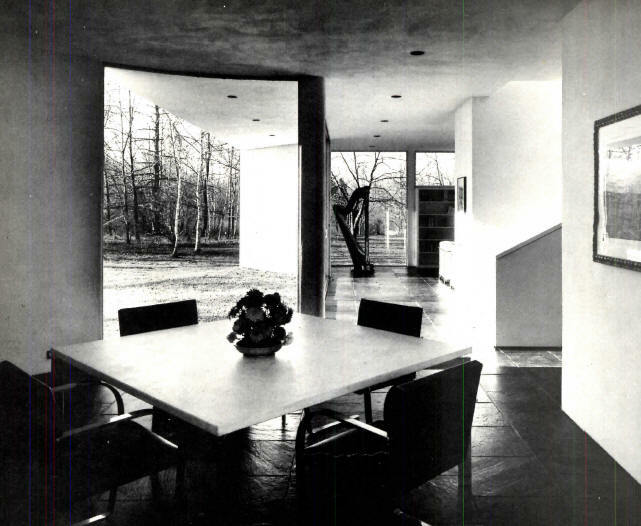 1970 - The Loring Mandel House, 117 Bay Avenue, Huntington Bay NY. Commissioned 1969. Designed with Richard Henderson. 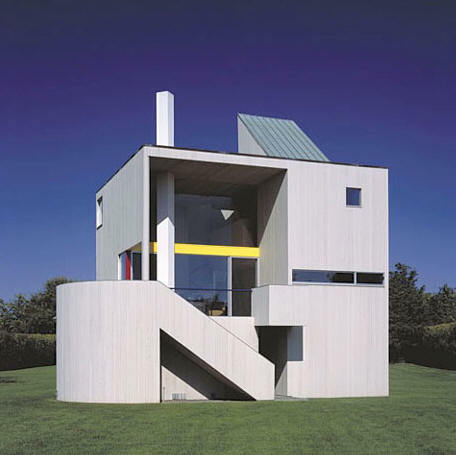 Does not appear in Gwathmey lists. 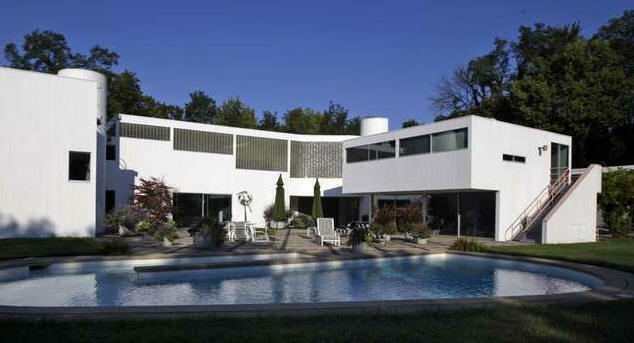 Featured as a 1972 Architectural Record House with credit going only to Henderson. 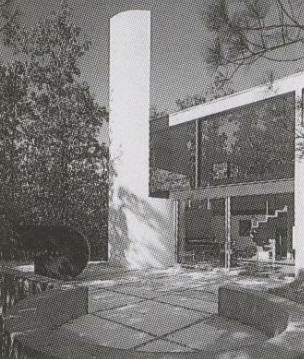 When Henderson left the partnership in 1970, it was agreed this house would be "his." 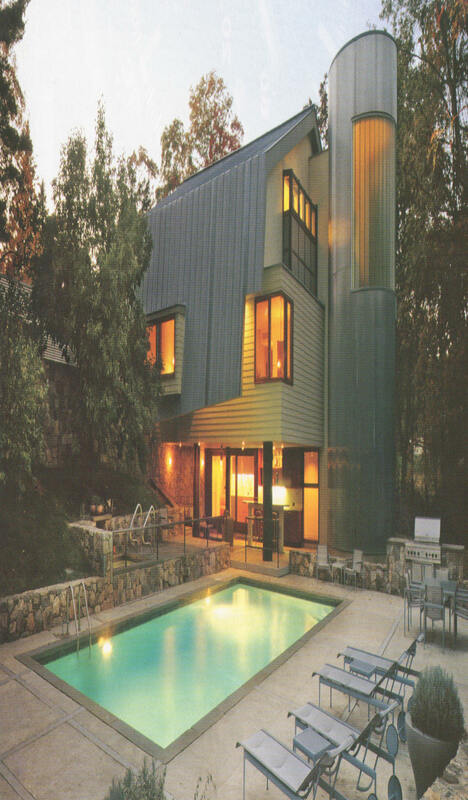 Sold in 2001 to Alyson Richman and Stephen Gordon. 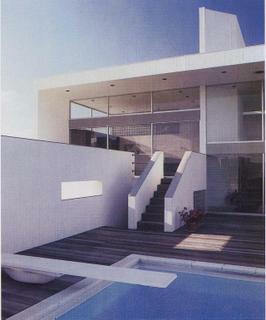 Sold in 2007 to Agustin Ruiz De Arcaute Diaz De Entre-Sotos. 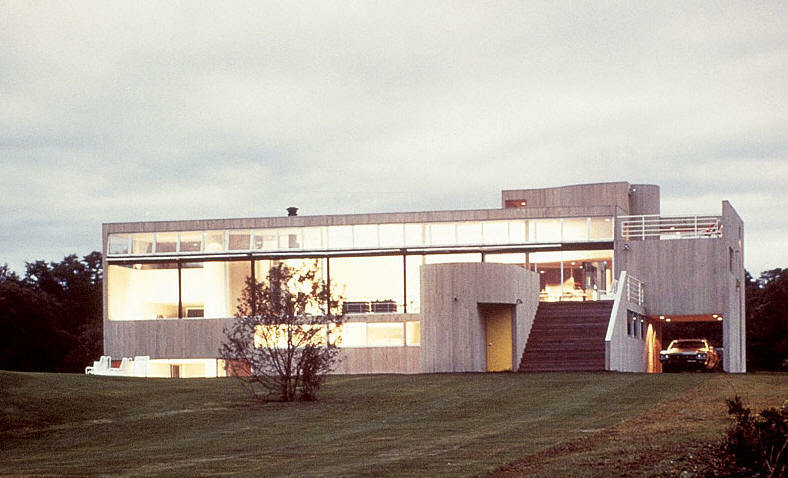 1971 - The John Steel Residence, aka Steel Residence I, Surfside Drive, Bridgehampton NY. House on the left, above. Commissioned 1968. 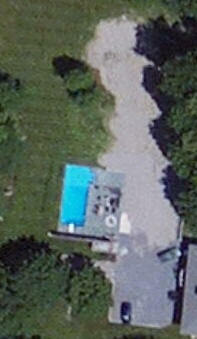 Was enlarged (addition on right near pool) and a beach footbridge and swimming pool also added. Destroyed. 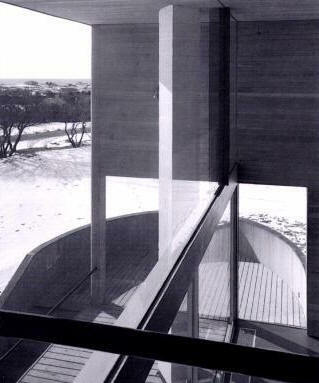 1971 - The Arthur/Ruth Steel Residence, aka Steel Residence II, Surfside Drive, Bridgehampton NY. House on the right, above. Commissioned 1969. 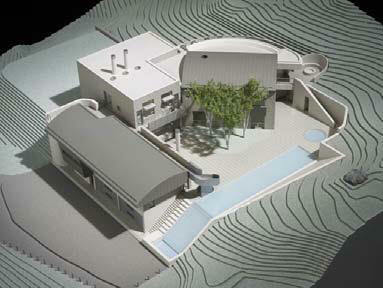 Added on considerably (left section of house) plus a pool. 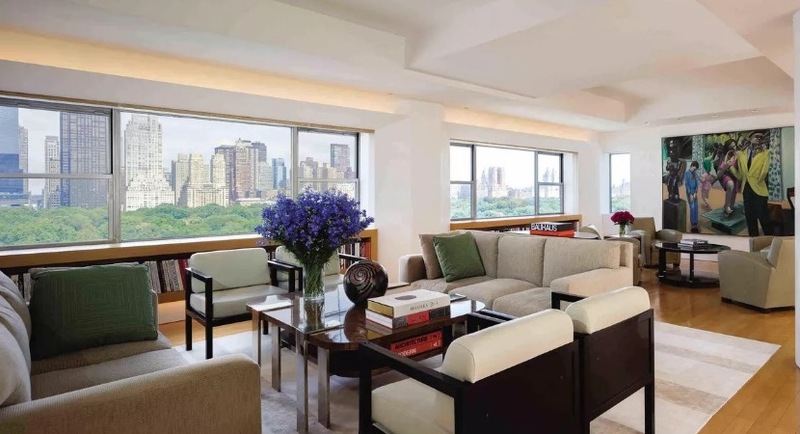 1970 - The Faye Dunaway Apartment, Eldorado Building 20th floor, 300 Central Park West, New York NY. 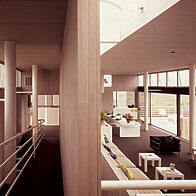 Interior photos by Ezra Stoller/Esto. 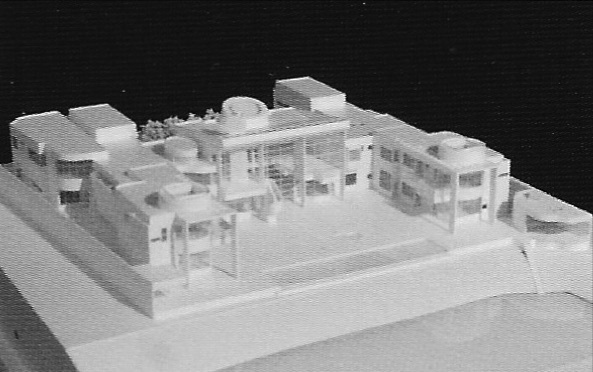 1970 - The Eskilson Residence, Roxbury CT (unbuilt). 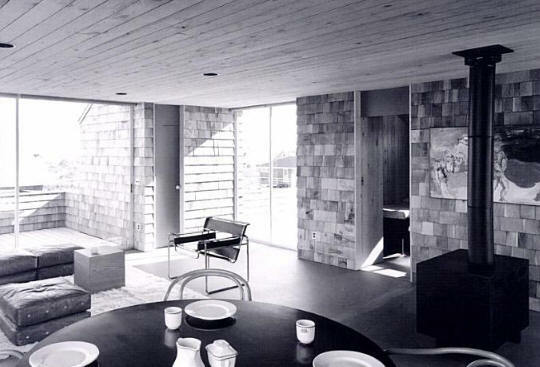 1970 - The Tolan Residence, 130 Bluff Road, Amagansett NY. 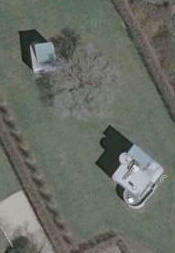 Next door to the house for Gwathmey's parents. 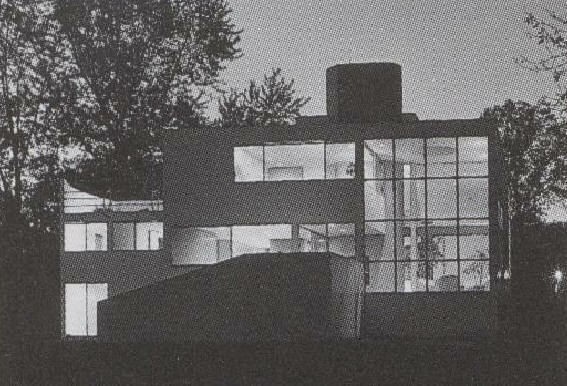 Commissioned 1965. Right photo by Wayne Eastep. Sold to the Kurzner family. For sale 2017-2018. 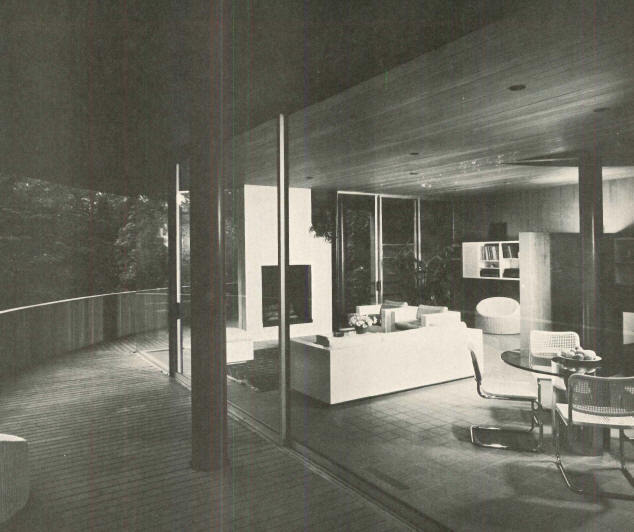 1972 - The Marshall and Maureen Cogan Residence, five acres at 34 Terbell Lane, Hook Pond, East Hampton NY. 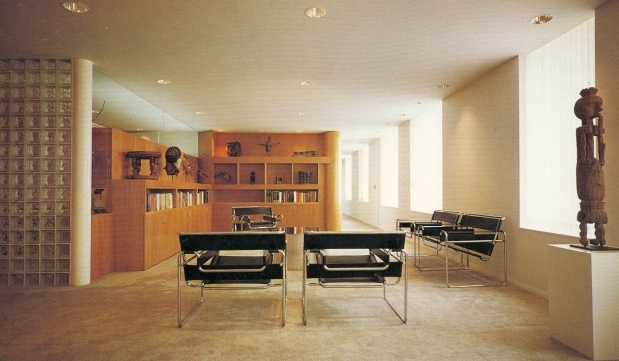 Commissioned 1971. 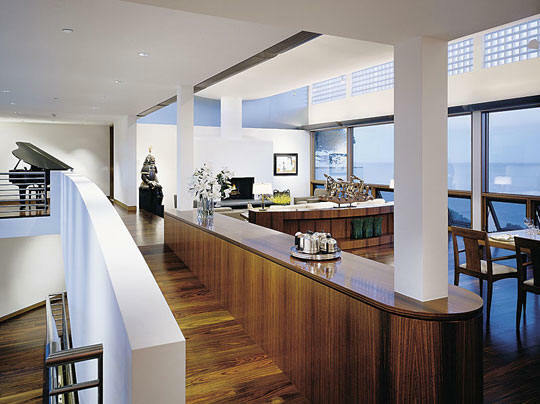 A rectangular pavilion intersected three ramps and a living area overlooking the Atlantic Ocean. 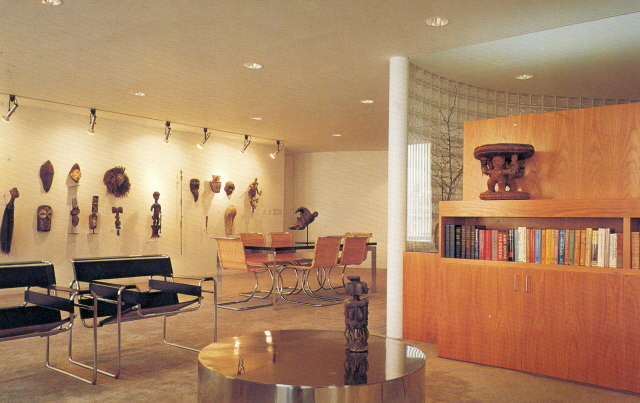 Marshall Cogan was the former owner of Knoll. 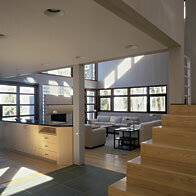 Won an national AIA Award and a AIANY Award. 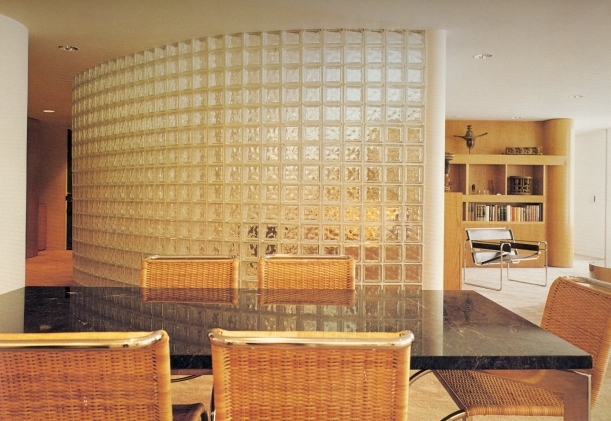 Was a 1973 Architectural Record House. 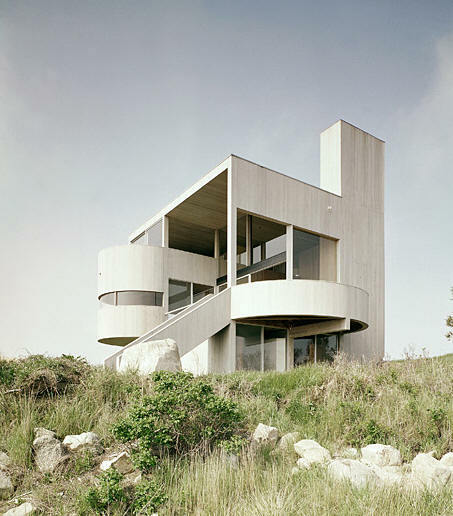 Photos by Ezra Stoller/Esto. 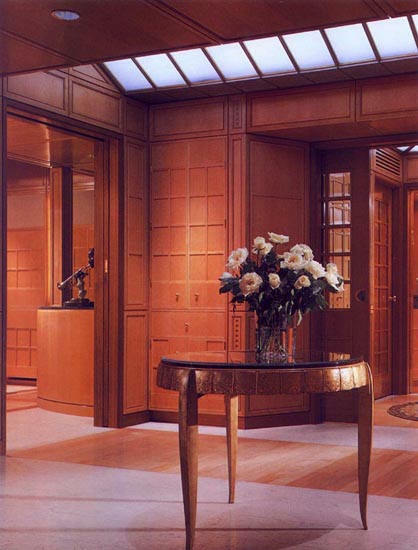 Sold to Joan and Joseph Cullman, who was the head of Philip Morris. Sold to Gary Fuhrman, who had it destroyed and a new house built. 1972 - The Whitney Road Public Housing Project, aka Pines of Perinton, 1 Locust Lane, Perinton NY. 560 units. 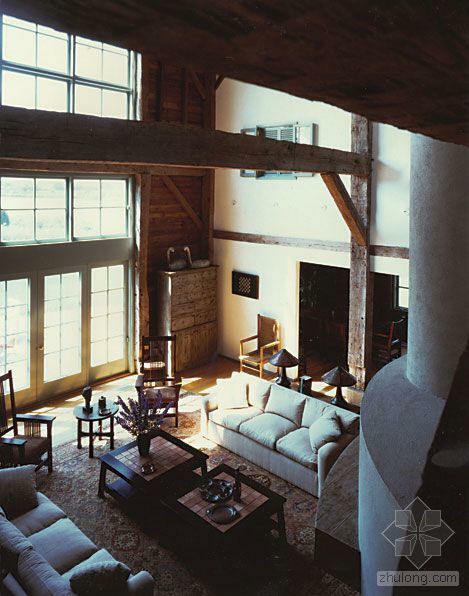 1973 - The Charles Gwathmey Barn, aka the Friday Barn Renovation, 490 North Street, Greenwich CT. Gwathmey's renovations are in B/W. 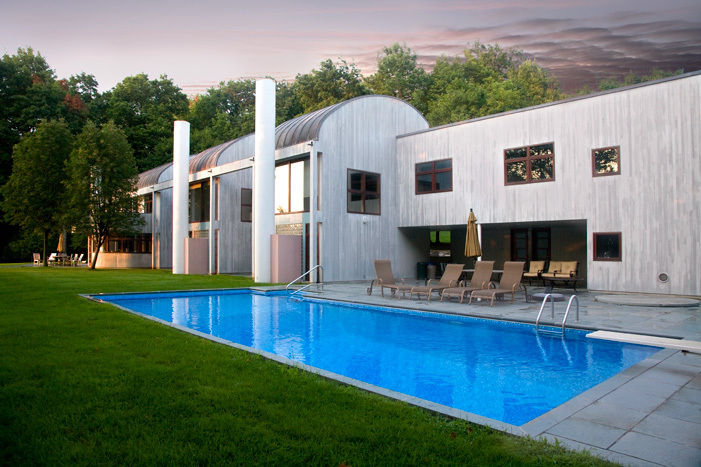 Sold in 1995 to Paul and Dana Caan who upon Gwathmey's recommendation, hired Stamberg/Aferiat for substantial additions and renovations, color photos. 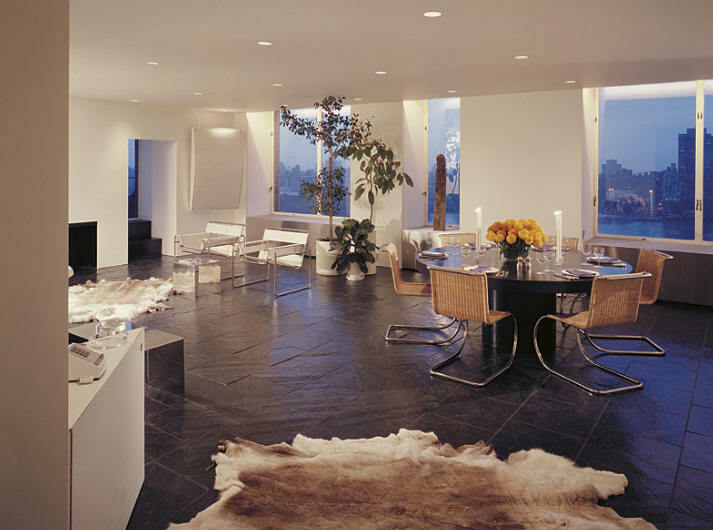 1973 - The Paul and Kay Breslow Apartment, aka the New York Apartment, 1016 5th Avenue #14A, New York NY. Designed for a writer and his wife. 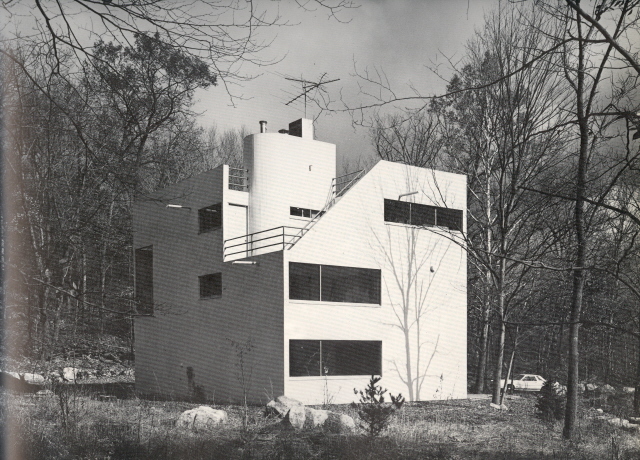 They later co-authored a book, Charles Gwathmey & Robert Siegel: Residential Works. Bottom photo by Tom Yee. 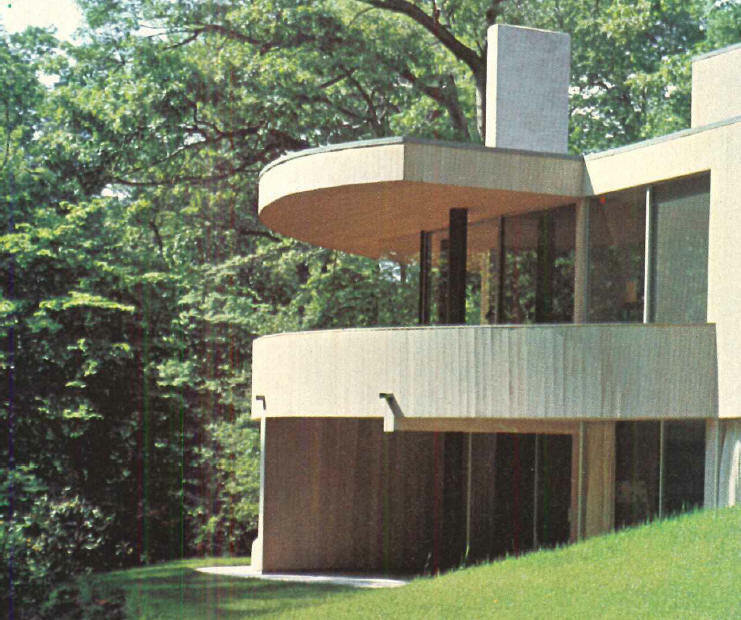 1973 - The Elia-Basch House, aka the Peter J. Basch House, 17 Wildwood, Califon NJ. 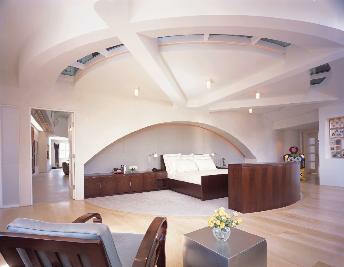 The project architect was Timothy Daniel Wood, who furnished the construction photo. Mr. Elia is standing by the house, which eventually included a pipe organ as Basch was a well-known organist. 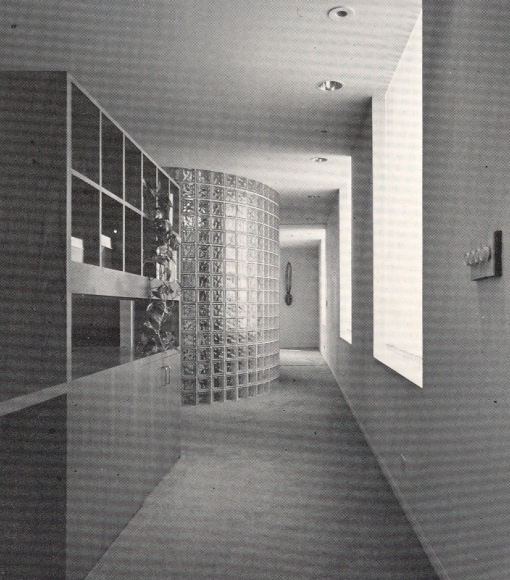 Featured in Architectural Record, July 1974. Sold in 1983 to Stas and Sharon M. Dec. 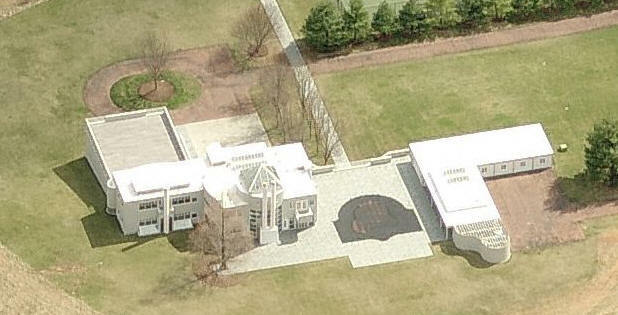 The house is almost unrecognizable as a Gwathmey creation due to several stylistically unfortunate modifications, color aerial photo. 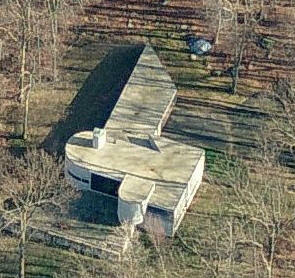 Transferred in 2013 to Sharon M. Cummings-Dec.
1973 - The Maurice and Marilyn Cohn Residence, 54 Sandpiper Lane, Amagansett NY. Commissioned 1972. 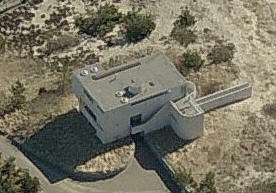 An oceanfront dune site with a steep slope to the cul-de-sac access road. 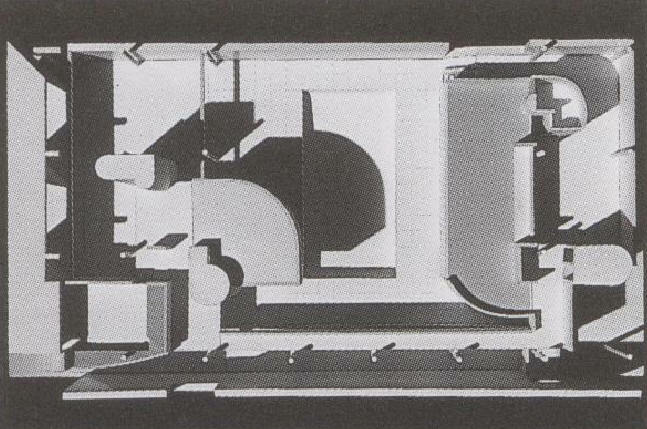 Won an AIANY Design Award in 1974. Bottom photo by David Franzen. Deeded to Marilyn Cohn. 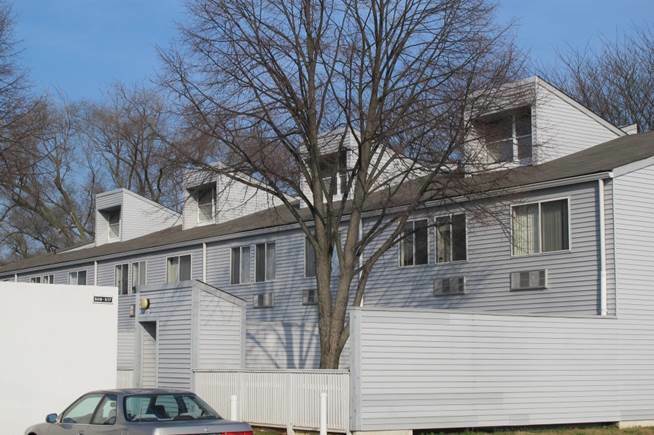 Sold in 2013 to 54 Sandpiper Lane LLC, controlled by Kensico Properties. 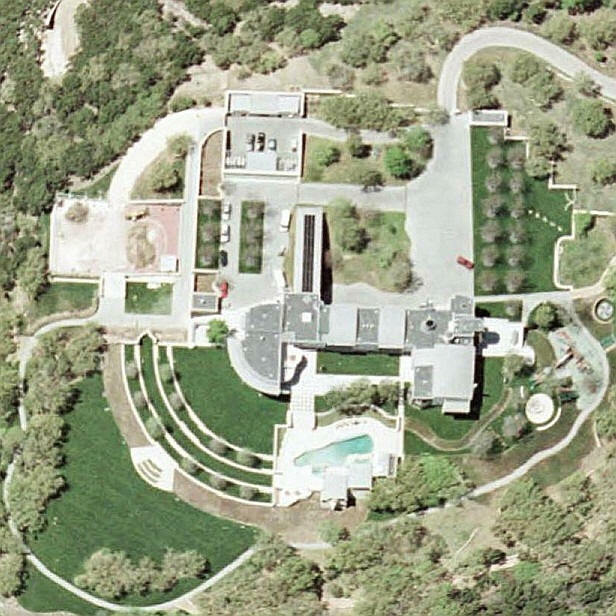 1973 - The David Geffen Residence, Malibu CA. 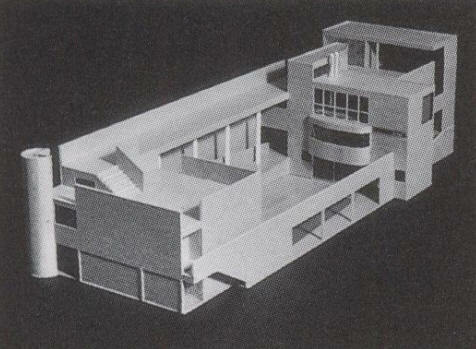 Unbuilt. 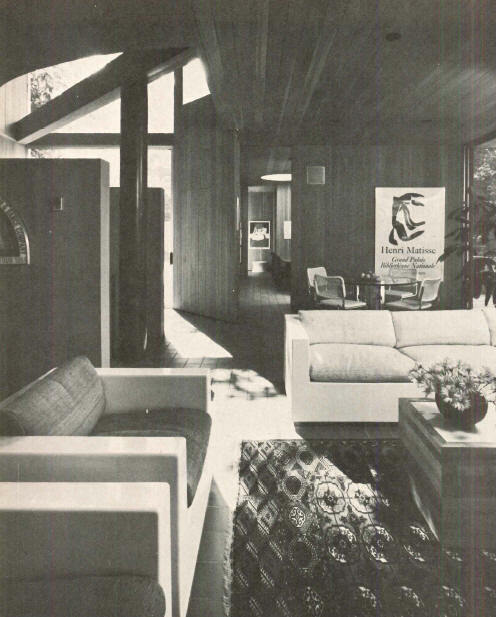 1975 - The Sangner House, Orange NJ. 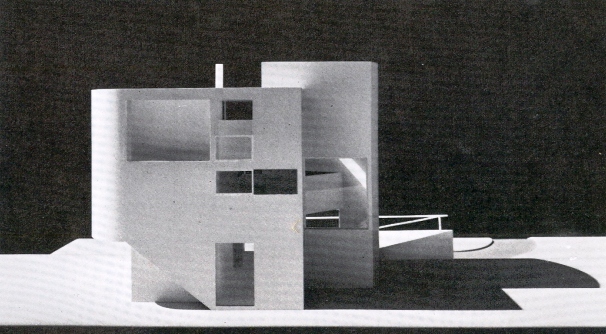 Unbuilt. Commissioned 1973. 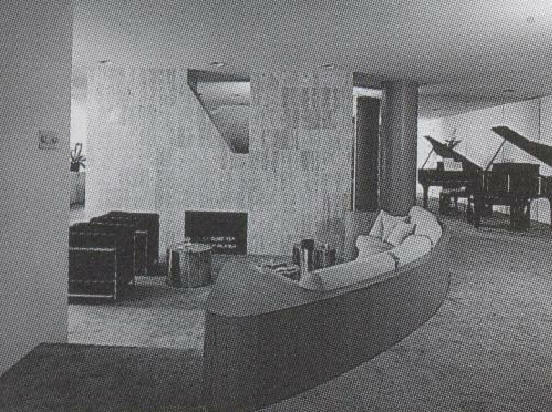 1975 - The Kay Unger Apartment, 136 East 36th Street, New York NY. 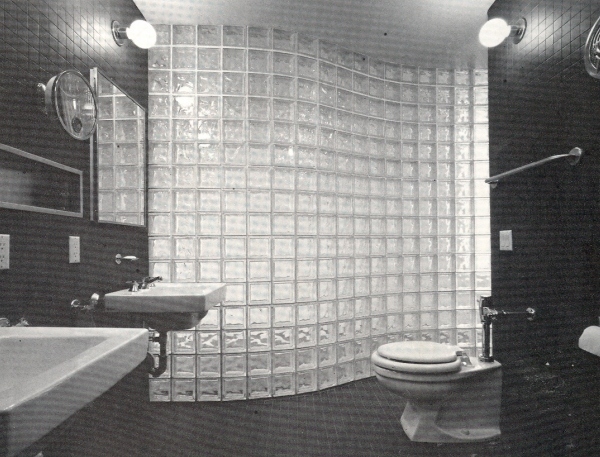 Featured in Architectural Record in 1976. 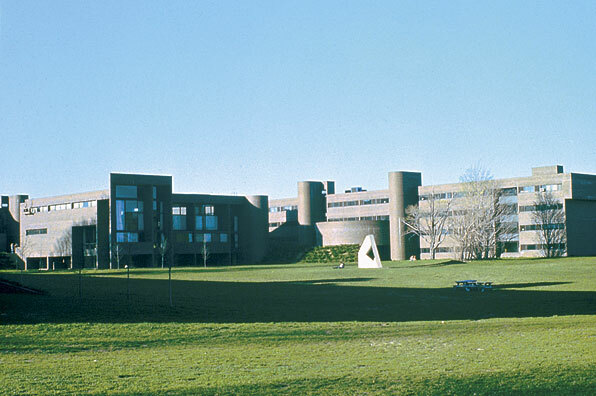 1975 - Student Housing, Dining, and Student Union at SUNY-Purchase, Lincoln Avenue, Purchase NY. Commissioned 1972. 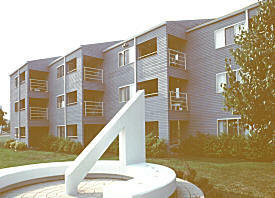 1975 - The Island Walk Cooperative Housing Project, 1701 Torrey Pine Court, Reston VA. Modified over the years with wood siding. 102 units. 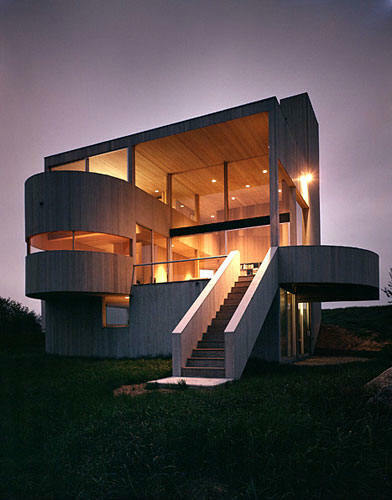 1976 - The Charof House, 15 Sycamore Lane, Montauk NY. Commissioned 1974. Sold several times. Sold to Bart Walker. Sold to Thomas E. (Ted) Owen around 2002. Color photo by James Wilkins. 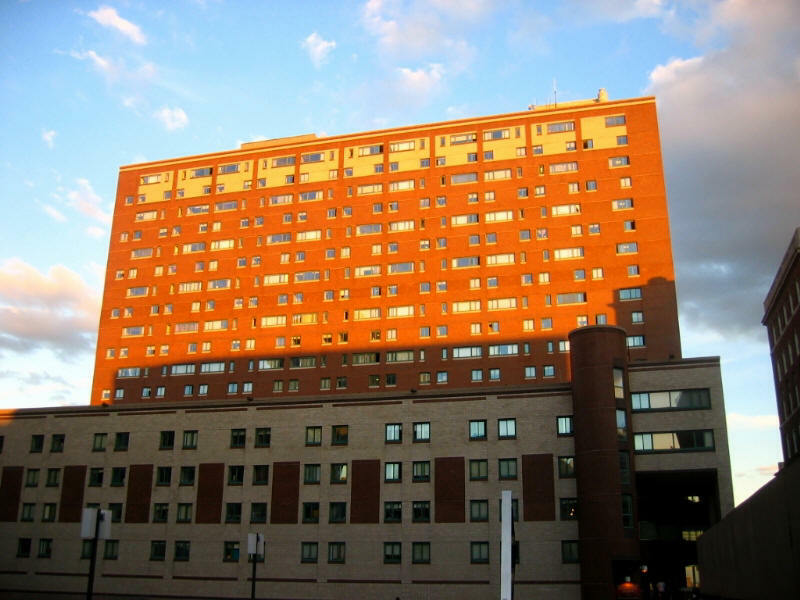 1976 - East Campus Student Housing at Columbia University, 70-74 Morningside Drive, New York NY. 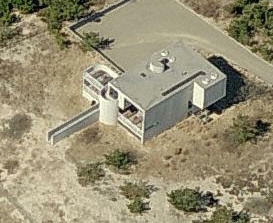 1976 - The Melville I. Haupt Residence, 43 Gilberts Path, Amagansett, East Hampton NY. Top right photo by Marvin McGrath. 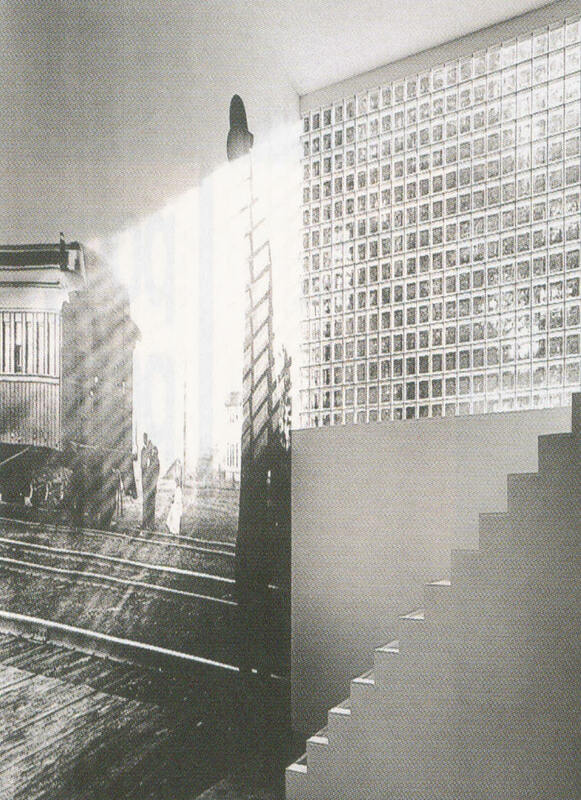 Featured in Architectural Record, May 1979. Sold to Gilberts Path LLC in 2014. 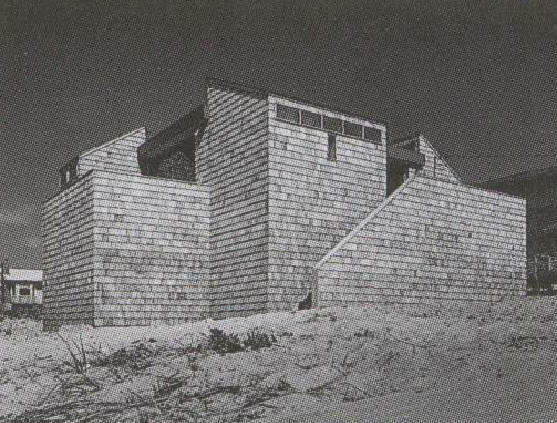 1976 - The Weitz House, 238 Dune Road, Quogue NY. 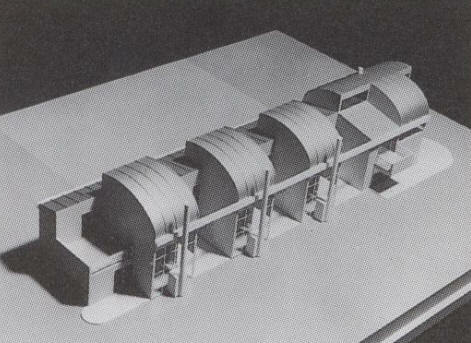 Featured in Architectural Record, September 1979. 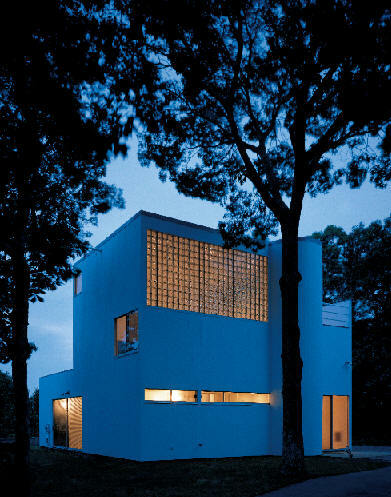 Featured in GA Houses 6. B/W photos by Norman McGrath. Built by Harold Reeve and Son. Mechanical engineer, Thomas Polise. Structural engineer, Geiger Berger. Sold to Franne and William Weinberg. Has been modified. 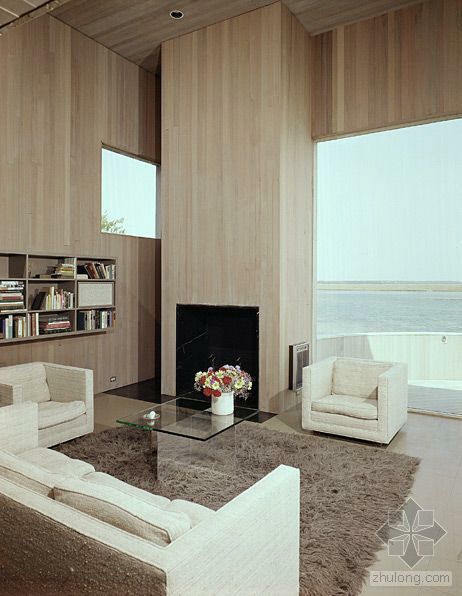 1977 - The Harry Kislevetz Renovation, 11 Lott Avenue, Westhampton NY. Left photo by Norman McGrath. Commissioned 1974. 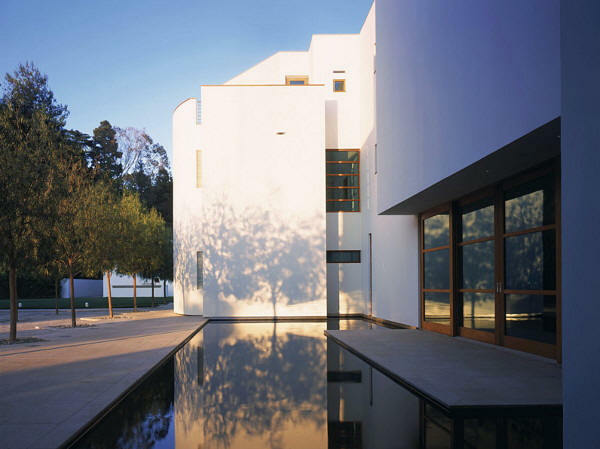 Built from the shell of a Spanish-style house. Sold to Harold K Ross. 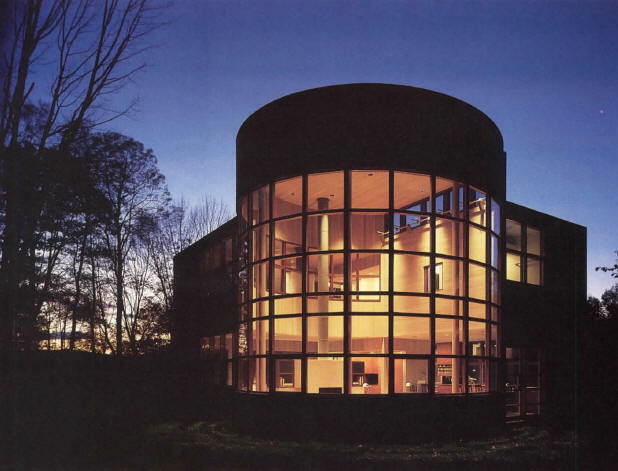 Sold to Jay and Erica Podolsky in 1998. Expansion around 2004. 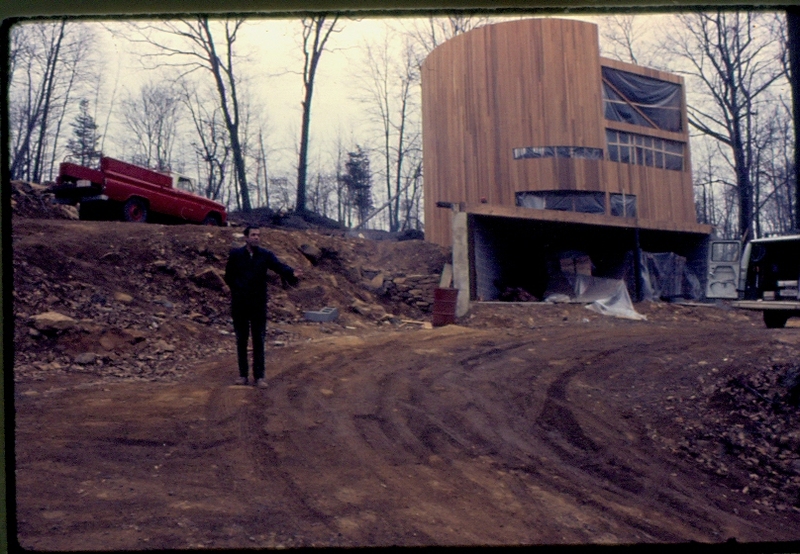 1977 - The Buettner Residence, 67 Johnsontown Road, aka Stony Brook Drive, Sloatsburg NY. Commissioned 1974. 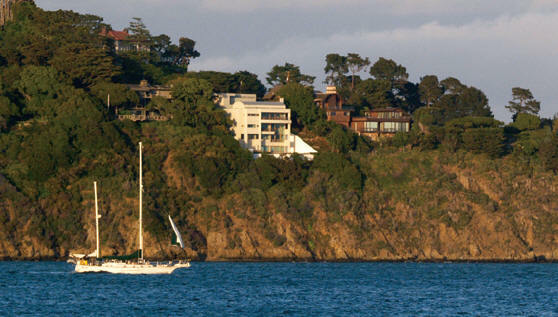 Was rented out for 20+ years; owned since 2001 by son Robert Buettner. 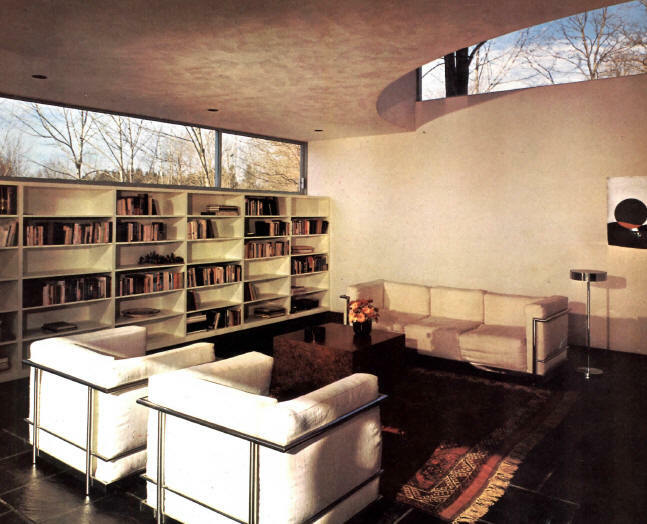 1977 - The Richard and Thea Benenson House, 95 Greenhaven Road, Rye NY. Commissioned 1976. 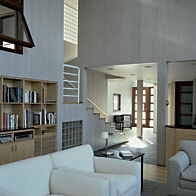 Won a AIANY Design Award. 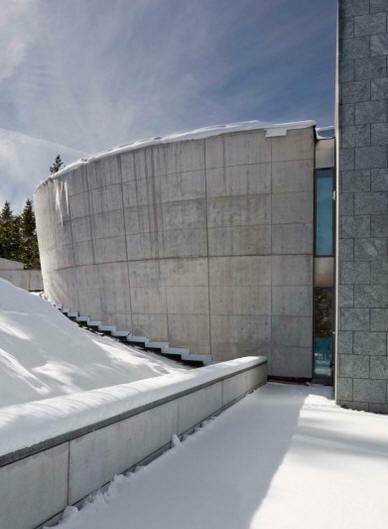 Was a 1980 Architectural Record house. 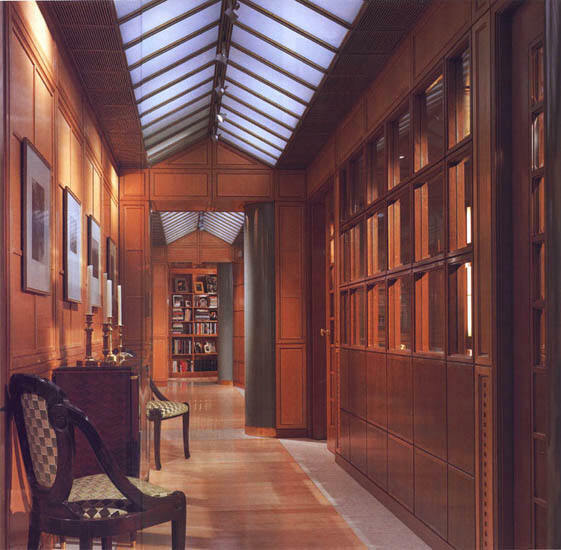 According to Richard Benenson, the house had no closets but had dressing rooms customized to the owners' clothes. Sold in early 1980's to Michael Silberkleit. Pool added later. There have been other renovations. Sold to Nina Larence and Don Remsky. 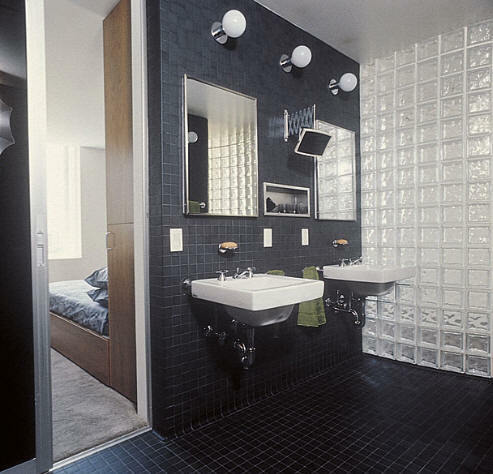 1977 - The Stephen and Nan Swid Apartment Renovation, aka Swid Apartment I, 635 Park Avenue, New York NY. 3400 sf. Color photo by Norman McGrath. 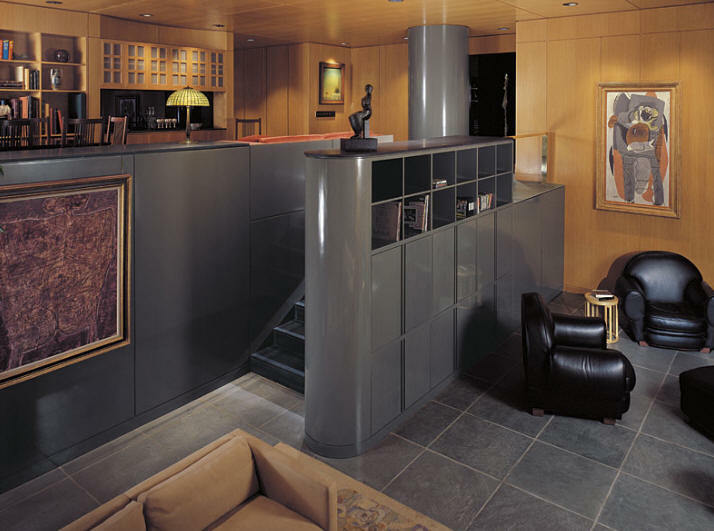 Renovated again by Gwathmey Siegel in 1983, aka Swid Apartment II, bottom photo by Paul Warchol. 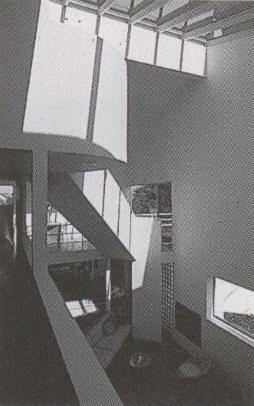 Featured in Progressive Architecture, June 1, 1985. 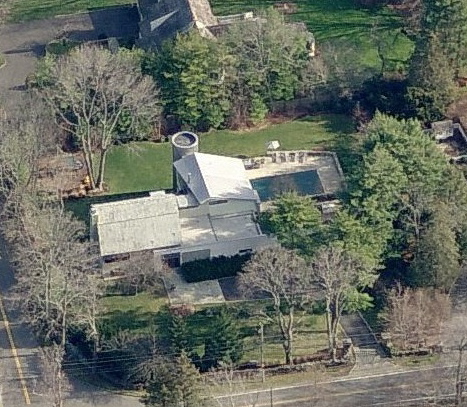 1978 - The John S. and Carol K. Crowley Residence, 627 Round Hill Road, Greenwich CT. Commissioned 1977. 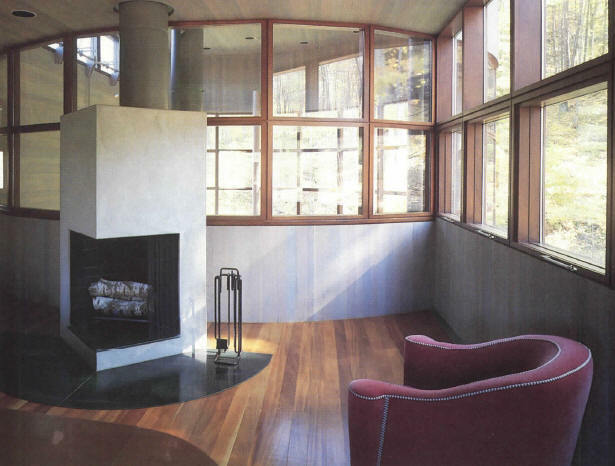 Sold in 1996 to Gerald Friedman. 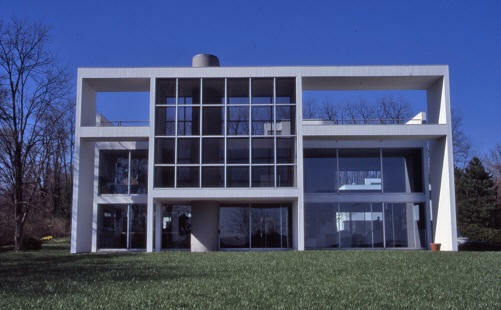 Sold later in 1996 to Robert H. and Natalie Shaffer. Deeded to the Natalie Shaffer Trust. Sold in 2013 to Jason and Anna Kaltz. 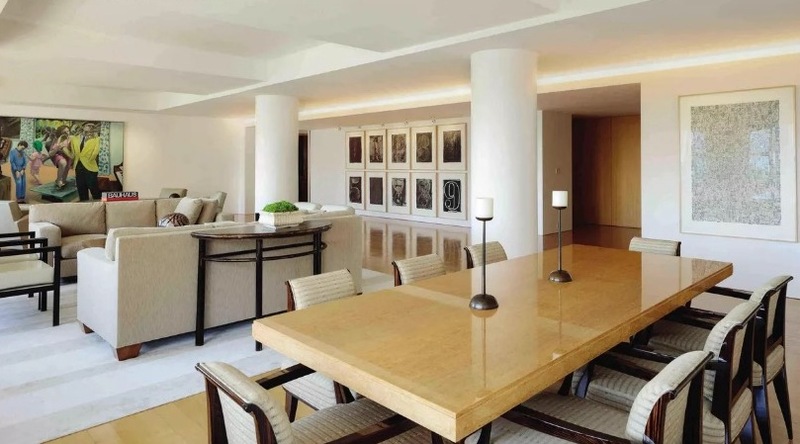 1979 - The David Geffen Apartment I, 783 5th Avenue (17th floor), New York NY. Commissioned 1977. Color photos by Norman McGrath. 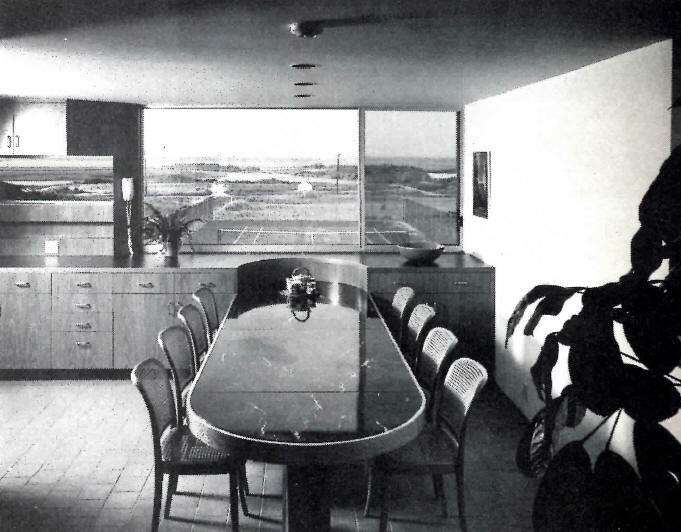 1979 - The Hines Residence, Martha's Vineyard MA. 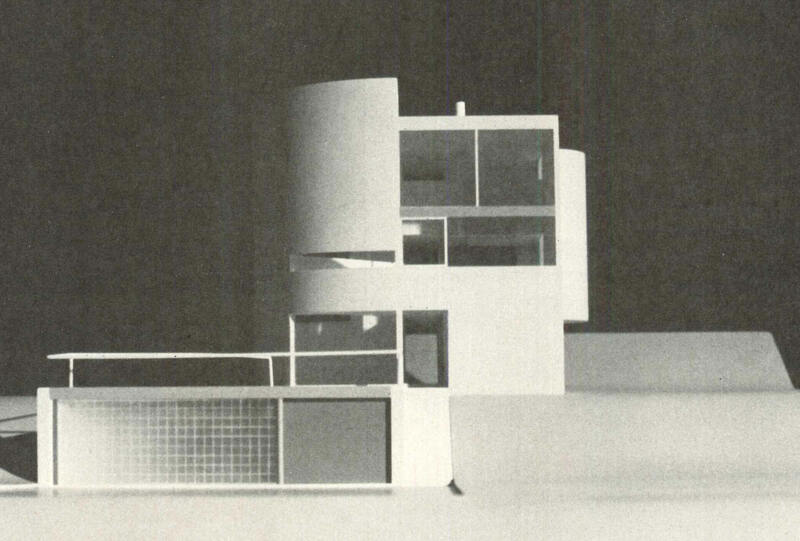 Unbuilt. 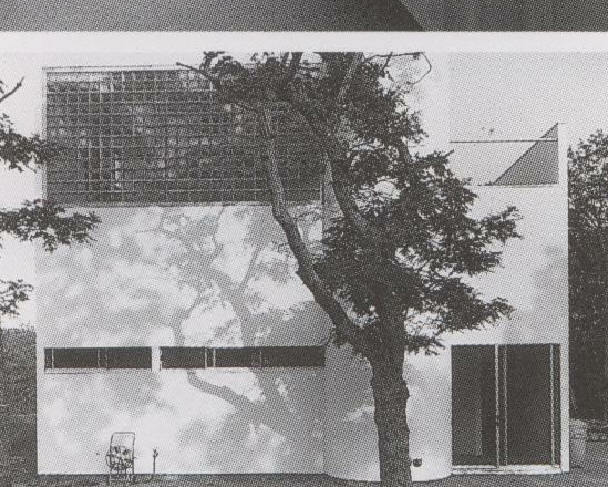 1979 - The François de Menil Renovation, 16 Crestwood Drive, Houston TX. 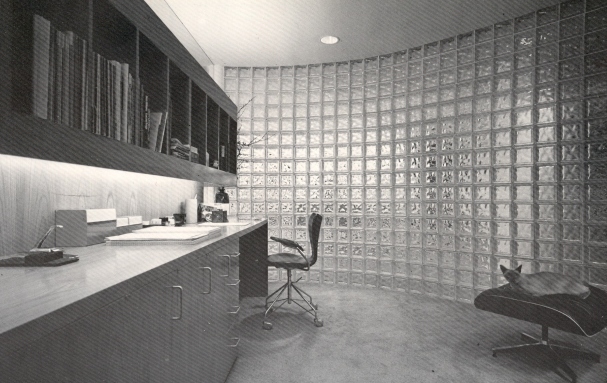 Bruce Nagel was the project architect. 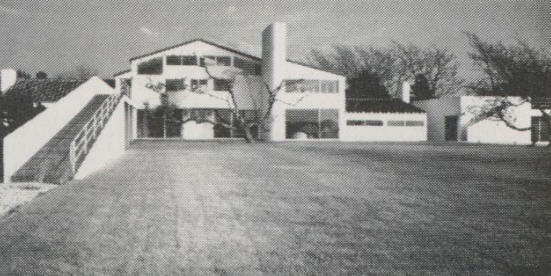 The original house was built in 1957, designed by George and Abel B. Pierce for the Zwerneman family. Sold to the Lundgrens. 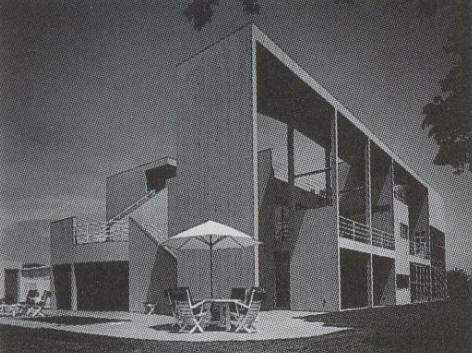 Additional building by Eugene Aubrey. 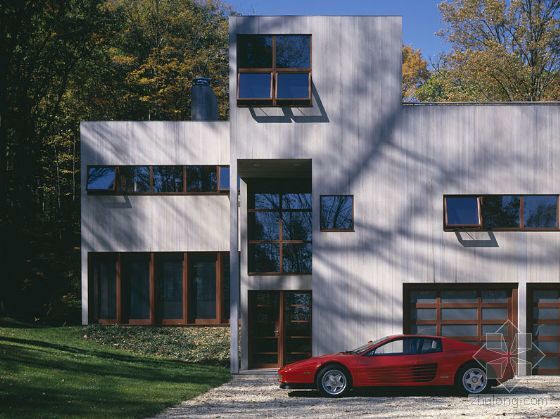 Sold to Francois de Menil and renovated by Gwathmey. Sold around 2001 to Lucky Chopra. Bottom photo circa 2011. Sold to Arnold and Tara Kurt in 2016. 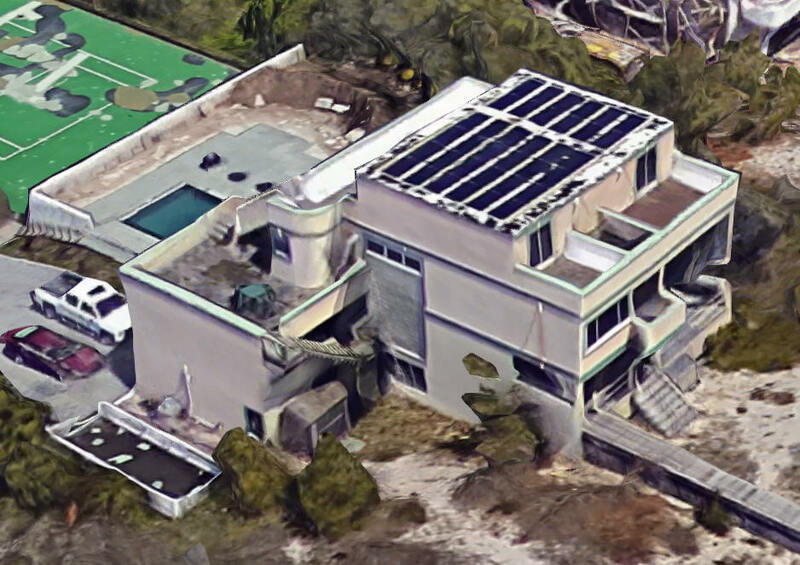 1979 - The Block Residence, Wilmington NC. 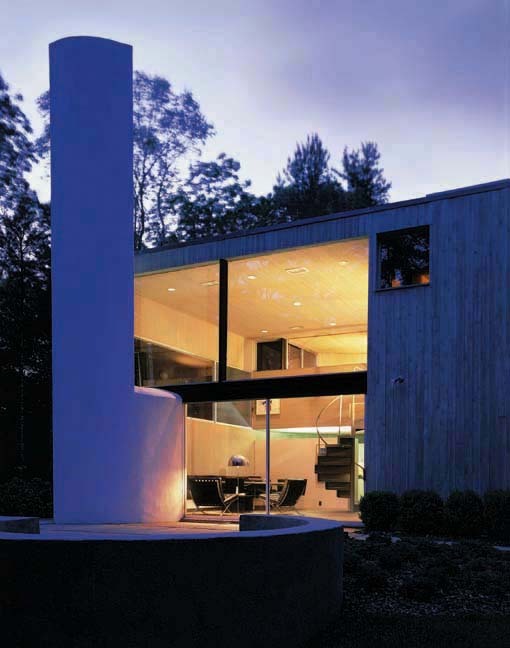 Dan Rowan and Bruce Nagel were the project architects. 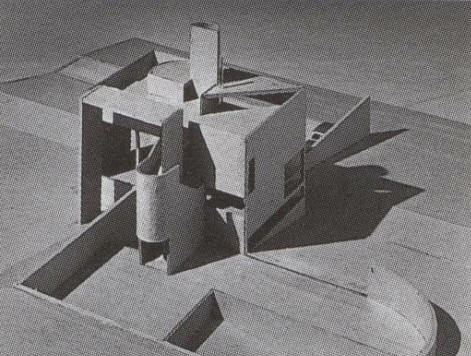 Unbuilt. 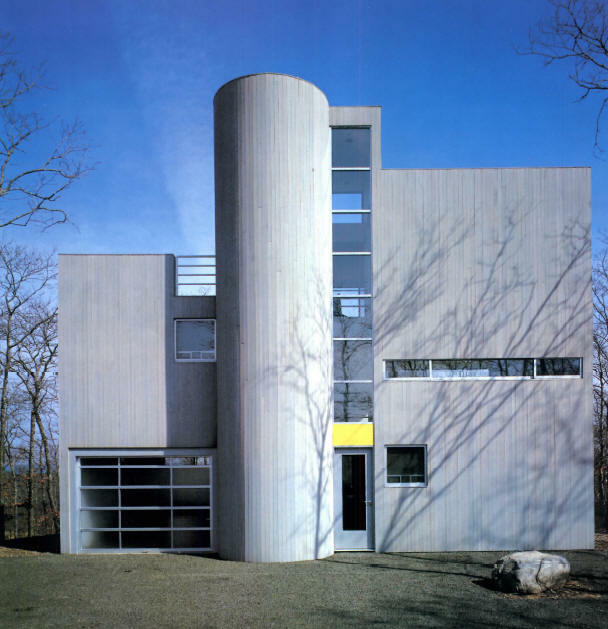 1979 - The Gabriele Viereck Residence, 144 Fresh Pond Road, Amagansett NY. 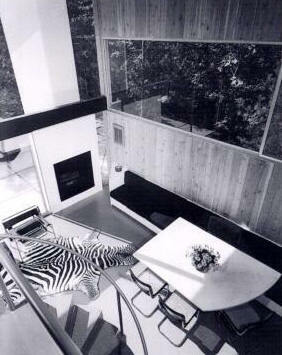 Dan Rowan and Bruce Nagel were the project architects. 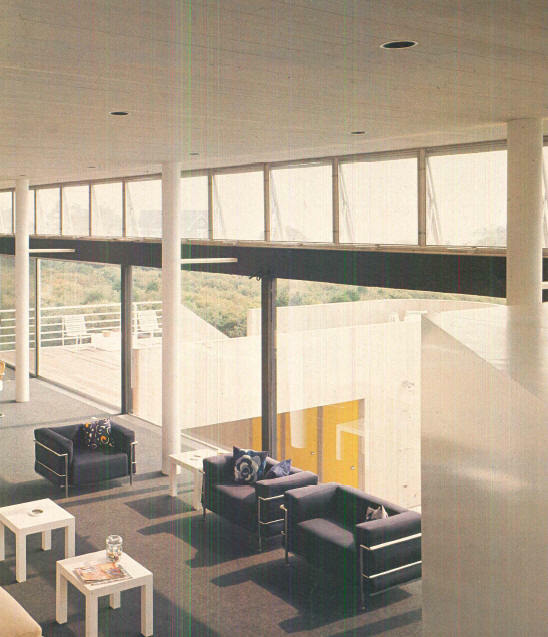 Featured in Architectural Record Houses of 1982. 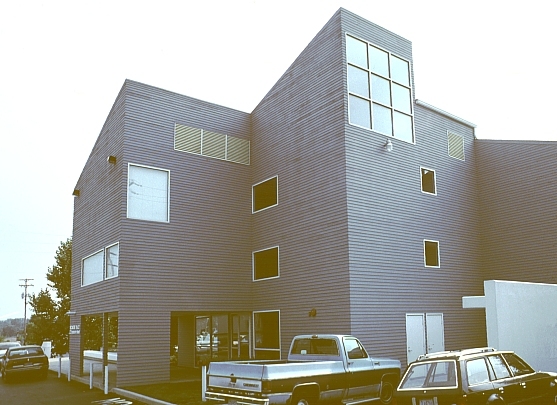 Bruce Nagel, who left the firm by then, did an addition and renovation in 1988. Still owned by Viereck as of 2018. 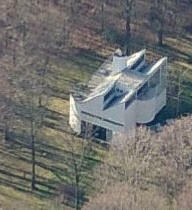 1980 - The Lloyd Taft House, 4320 Drake Road, Cincinnati OH. Commissioned 1978. 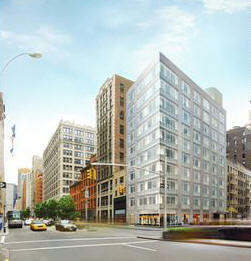 Senior Associate Gustav (Gus) Rosenlof was the project architect. 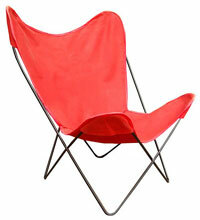 Sold to Robert W. and Carol Olson. 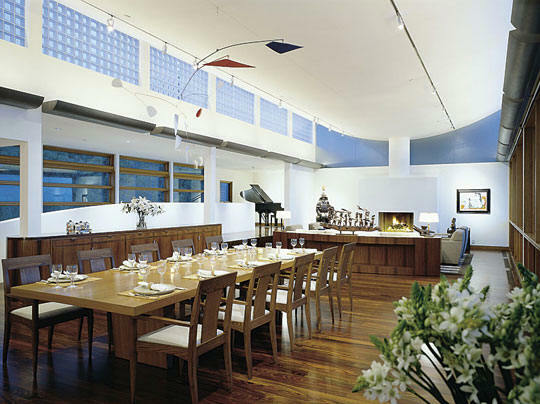 Minor alterations by Carl Strauss Associates around 1990 and by Stewart Maxwell, Jr. in 1994. 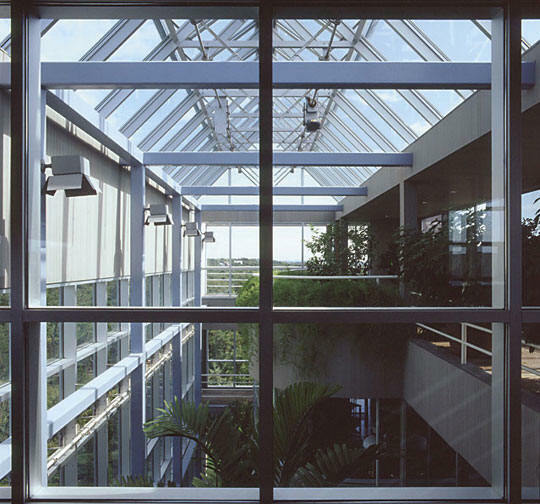 New outdoor patios in 2005. Sold in 2015 to John Meckstroth. Sold in 2015 to Christopher Frutkin and Jennifer Sizer. 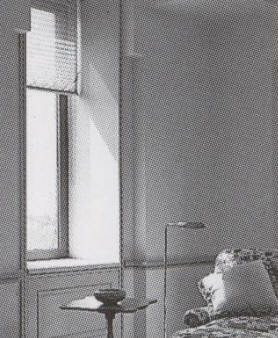 1981 - The Arango Apartment, New York NY. Photos by Norman McGrath. 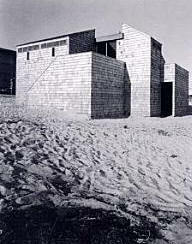 Project architects were Paul Afariat, Jose M. Coriano, and Frank Lupo. Do you know the address? 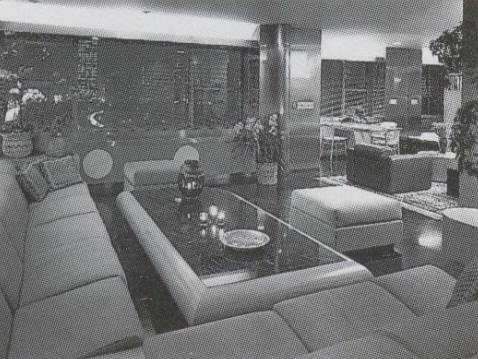 1982 - The Robert and Kathy Steinberg Apartment, 944 5th Avenue, 9th floor, New York NY. Commissioned 1981. 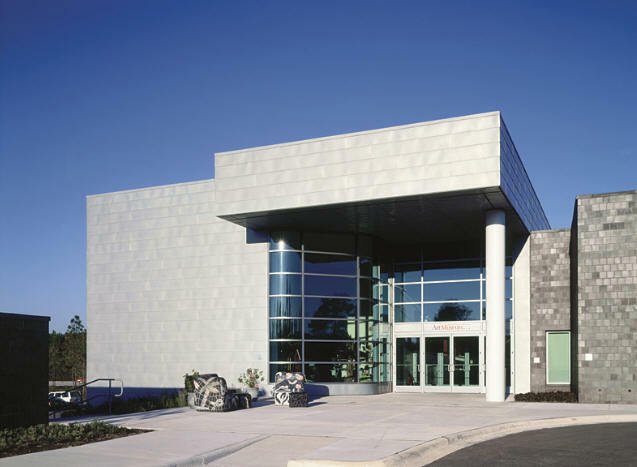 Dan Rowan and Bruce Nagel were the project architects. 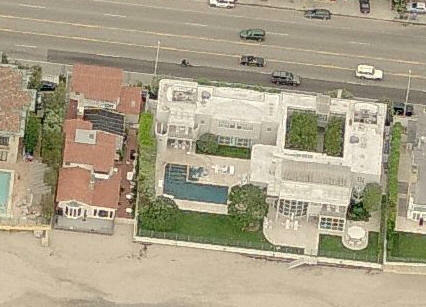 Sold to producer Howard Peter Guber. 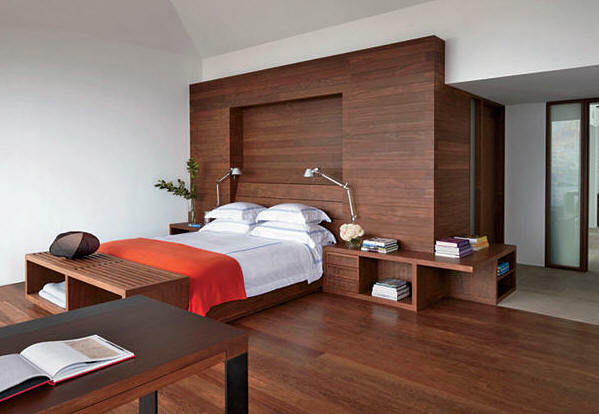 Renovations by architect Stephen Yablon. Sold to a partner in Goldman Sachs in 1999. 1982 - The Sycamore Place Elderly Housing, 222 Sycamore Place, Columbus IN. 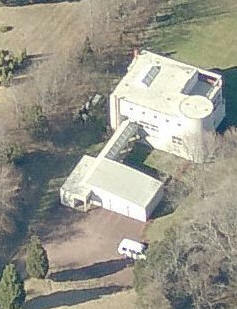 1983 - The Francois deMenil Residence, aka Toad Hall, 428 Further Lane, East Hampton NY. Commissioned in 1979. 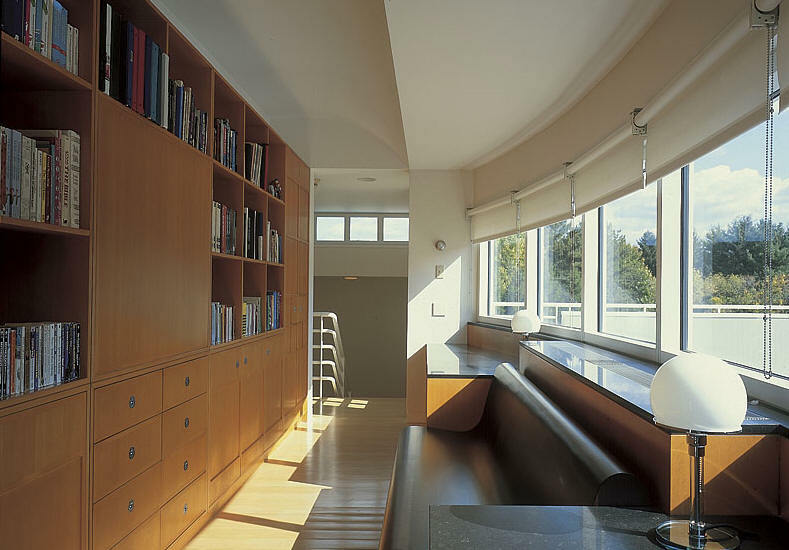 Paul Afariat, Dan Rowan, and Bruce Nagel were the project architects. 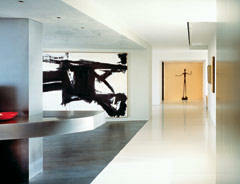 Sold around 1988 to Edgar Bronfman Jr. Sold in 1991 to Larry Gagosian. 11,000 square feet. 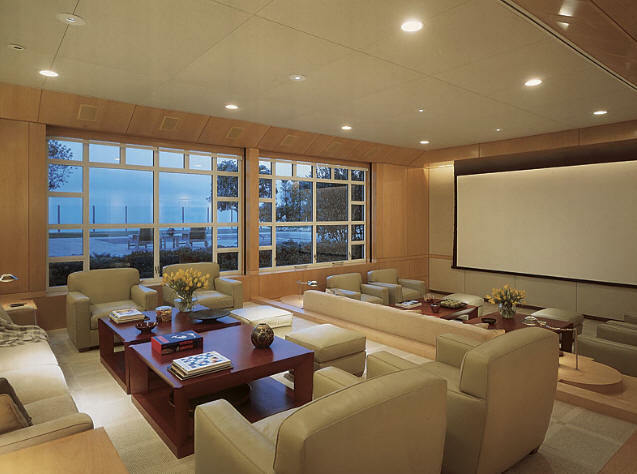 Bruce Nagel, who had left the firm by then, designed a garage compound in 2008. There was a small fire in the house in 2011. Nagel designed the restoration, which was mostly fixing smoke damage. There was a fire in the guest house in 2014. 1984 - The Pence Place Apartments, 521-531 Pence Street, Columbus IN. Design Associate: Jacob Alspector. Design Team: Margaret Fitzpatrick, Lynn Bensel, Jose Coriano, William Garbus, Dirk Kramer, Dean Marchetto, Joseph Ruocco, Irene Torroella. 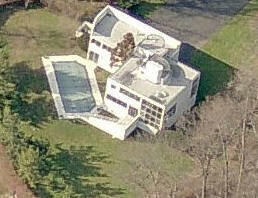 1984 - The Sagner Residence, Essex Fells NJ. Unbuilt. 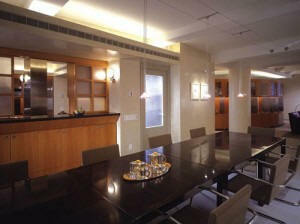 1985 - The Steven Spielberg Apartment, 52nd floor of the Trump Tower, 721 Fifth Avenue, New York NY. Commissioned 1983. 2500 square feet. 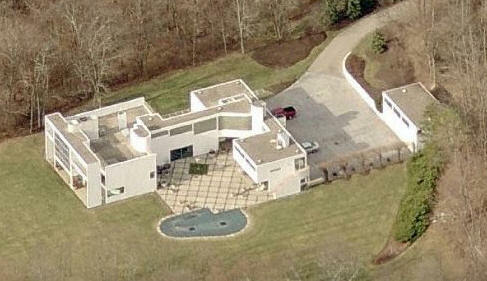 1986 - The Barry and Patricia Gimelstob Residence, 75 Sand Spring Road, Harding Township, New Vernon NJ. Commissioned 1982. 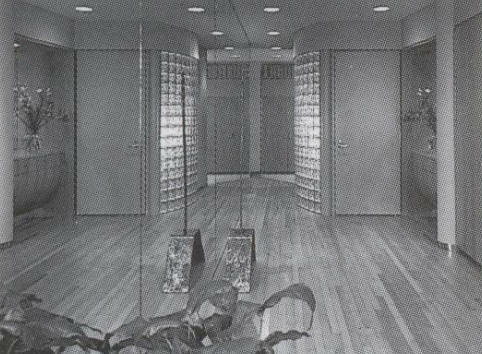 Dan Rowan and Bruce Nagel were the project architects. There were several iterations of the design. 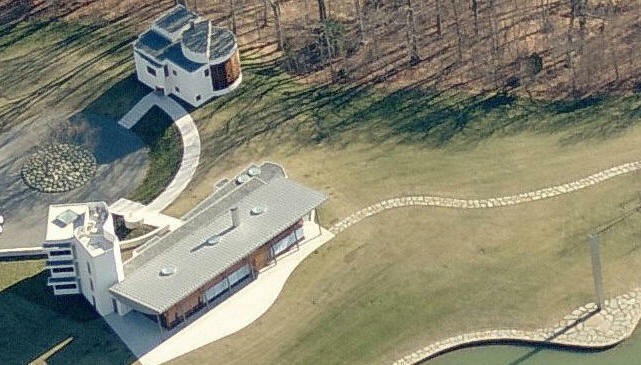 Tennis pro Justin Gimelstob grew up there. Bottom two photos by Norman McGrath. 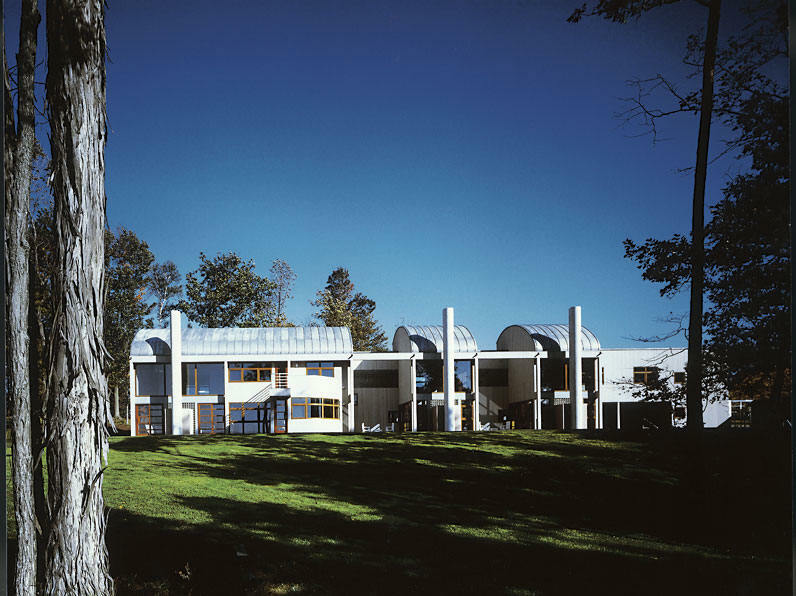 1987 - The John R. and Julia Opel Residence, 297 Adirondack Drive, Shelburne VT. Commissioned 1985. 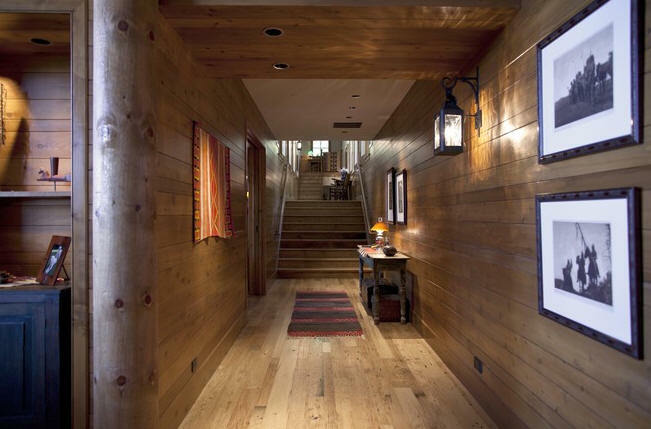 7000 square feet on 12 acres. Project architects Paul Aferiat and Renny Logan. Most photos by Richard Bryant/Arcaid. 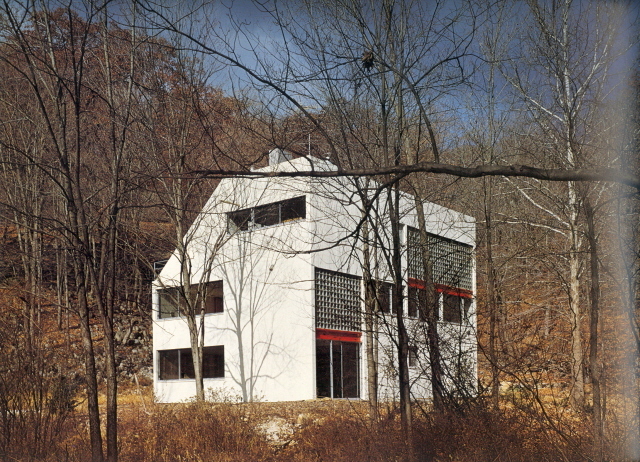 Featured as an Architectural Record House in 1988. Bottom two photos by Peter Close. The Opels sold it in 2007 to Adirondack Drive LLC, Jeffrey Robbins. 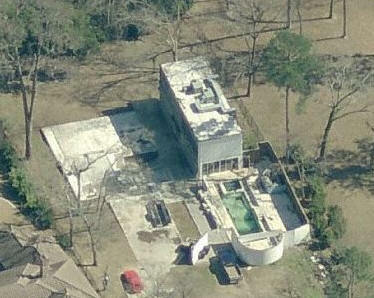 Robbins destroyed the house in 2010 except for the pool. As of 2017, the pool appears to be gone, too. 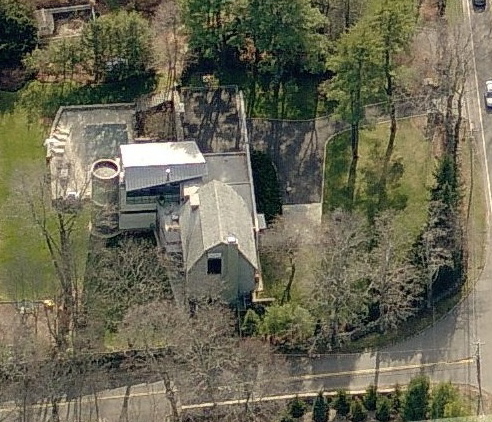 1988 - The Garey House, 23 Mauwee Brook Way, Kent CT. About 4500 square feet on nine acres. Ambrosino DePinto & Schmieder were the mechanical engineers. 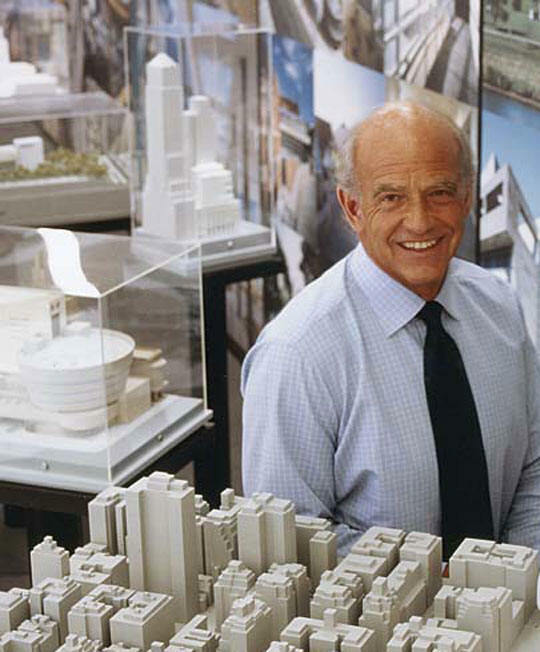 Structural engineer, Robert Silman. Commissioned 1983. 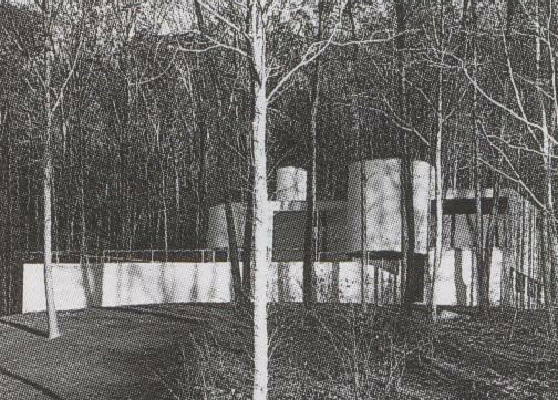 Featured as an Architectural Record House in 1988. Sold to Donna and Benjamin Rosen. 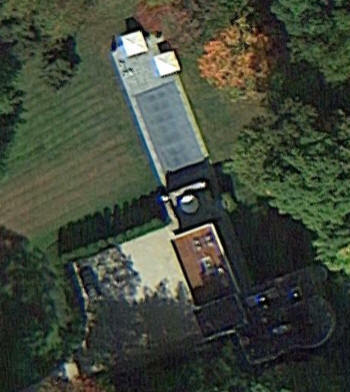 1988 - The Steven Spielberg and Kate Capshaw Residence, aka Quelle Farm, 110 Apaquogue Road, Georgica Pond, East Hampton NY. 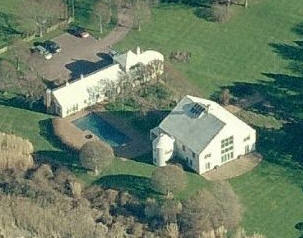 5000 square feet on six acres. Second photo by Richard Bryant. Commissioned 1985. 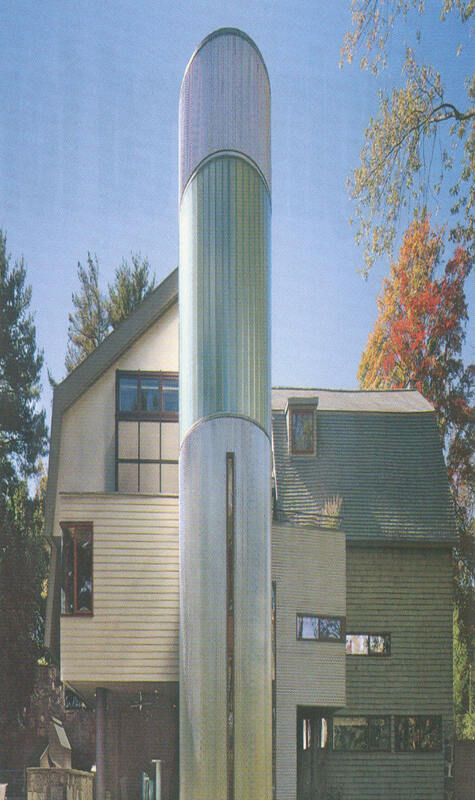 Featured as an Architectural Record House in 1988. 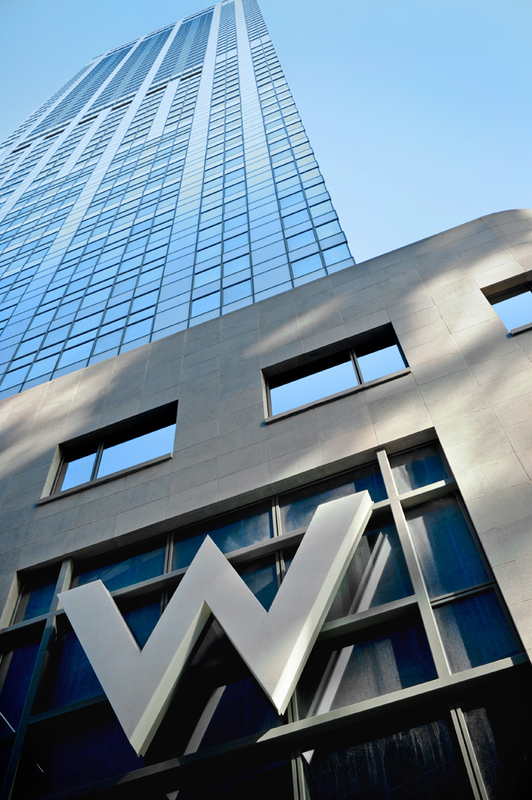 President Clinton stayed there for a week in 1998 and in 1999. 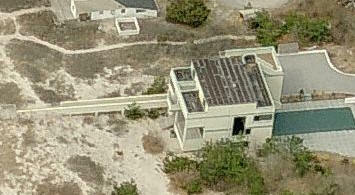 There are four buildings by Gwathmey besides the main residence, bottom photos: two guest houses and a caretaker house. 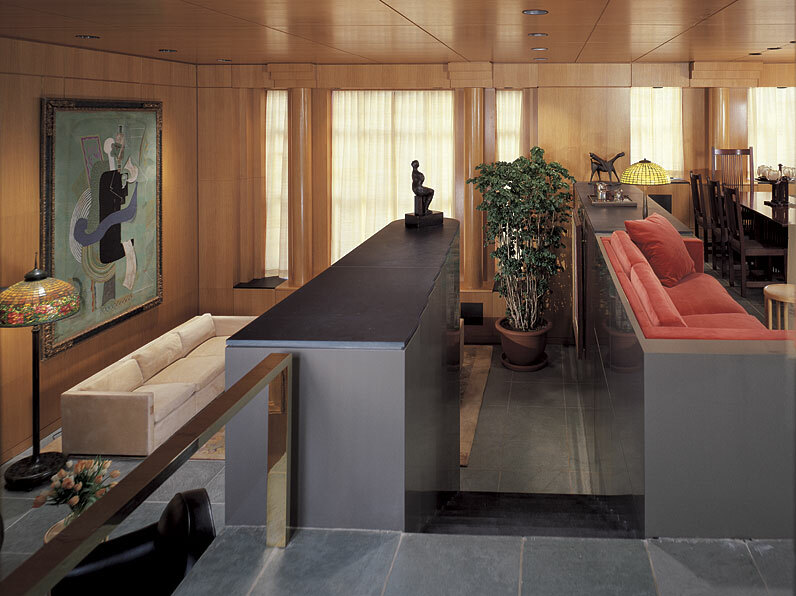 1988 - The Charles Gwathmey Apartment, 1115 5th Avenue, 10A, New York NY. 2500 sf. Photo by Paul Warchol. 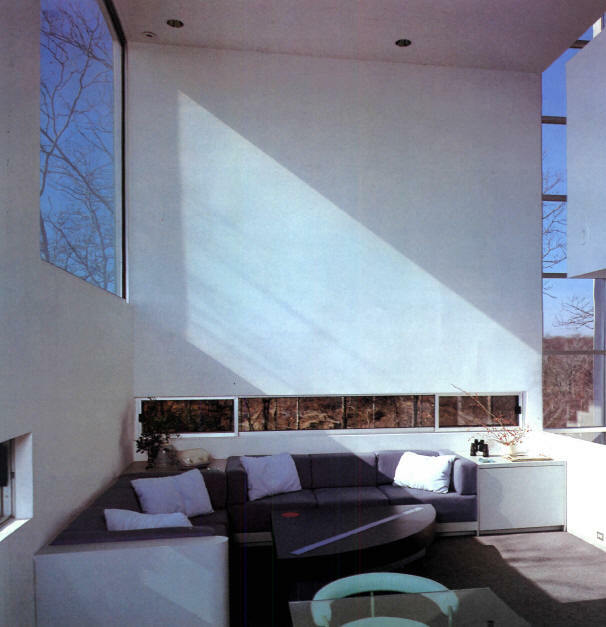 1989 - The Robert Steinberg Residence, 14 Gracie Lane, Apaquogue, East Hampton NY. Bottom photo by Steven Brooke. Commissioned 1986. 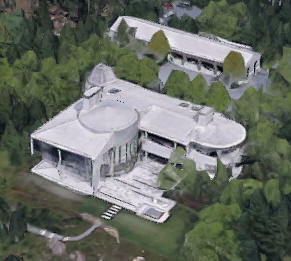 8500 square feet on four acres. 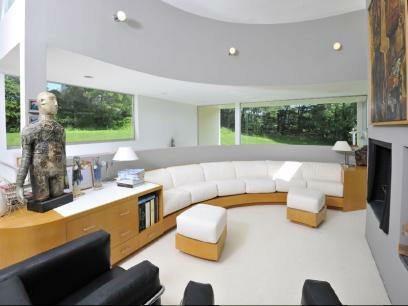 Sold in 1995 to Howard D. and Sheri Schultz. 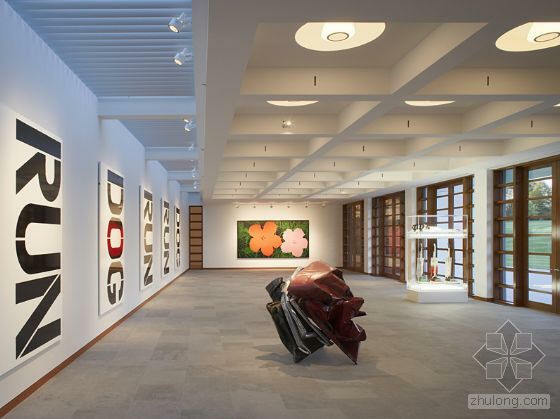 Renovated by Kang Chang, a former Gwathmey Siegel associate who started his own firm in 2010. 1989 - The Oprah Winfrey Apartment, Chicago. 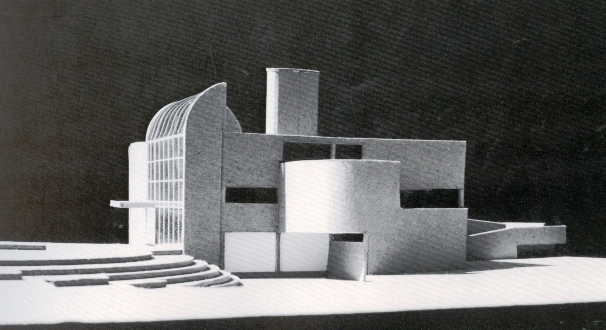 Unbuilt. 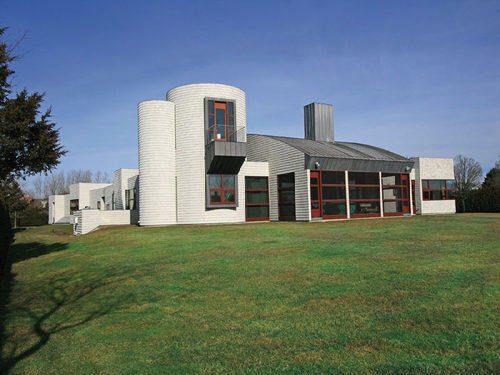 1989 - Inaccurately cited as a Gwathmey design (primarily by Sean (Puffy) Combs) is the Henry Shyer House, 40 Hedges Banks Drive, East Hampton NY. Commissioned 1987. 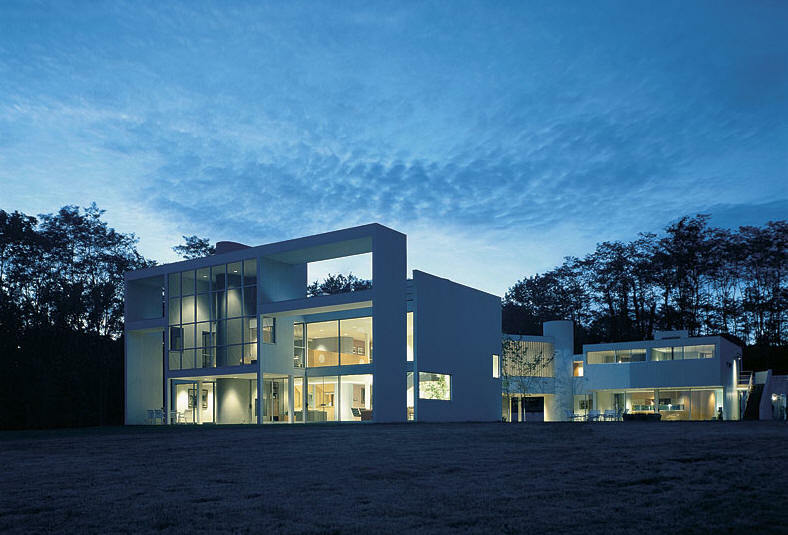 It was designed entirely by Bruce Nagel, who worked for both Gwathmey and Richard Meier before going on his own. Sold to Minoru and Yoshiko Mori. Sold to Combs in 1998. 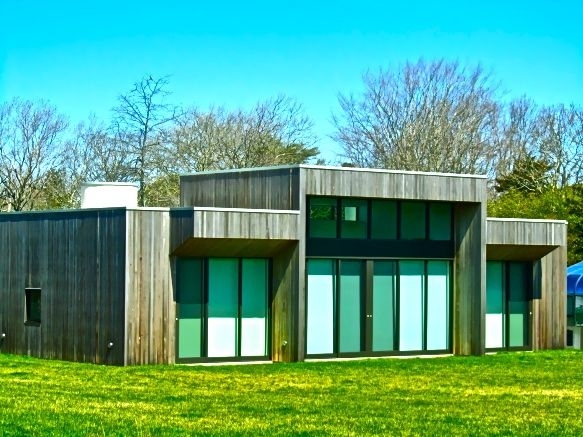 Following a particularly rowdy Fourth of July party in 1999, Combs was fined $2,000 by the town of East Hampton for hosting 500 guests above the legal limit. 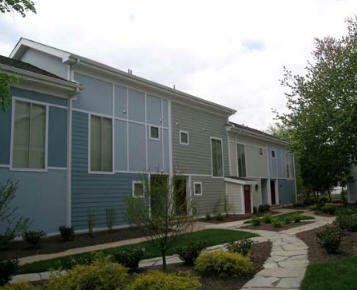 Sold in 2001 to 40 Hedges Realty Inc., a company controlled by Combs. 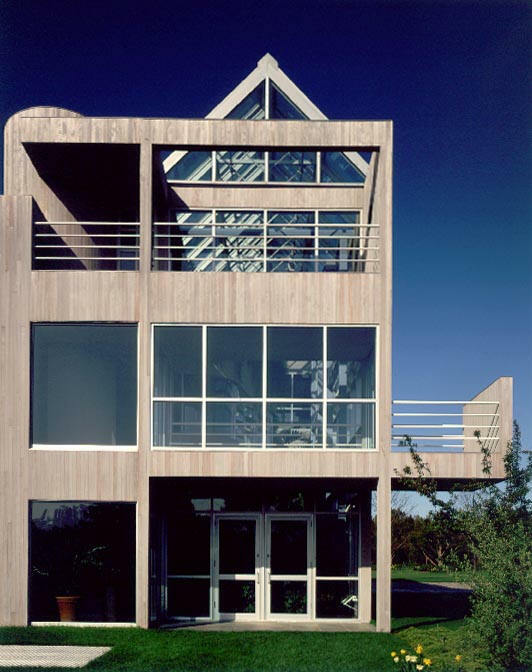 1990 - The Cary F. Staller Residence, aka the Old Field House, 45 Crane Neck, East Setauket NY. 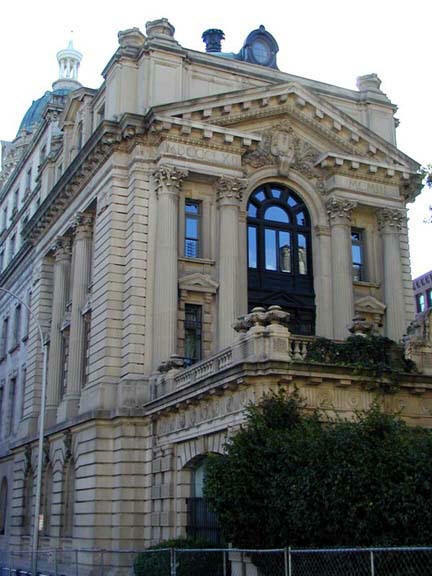 1990 - The Jack and Phyllis Rosen Townhouses, 16 and 18 East 85th Street, New York NY. Commissioned 1988. 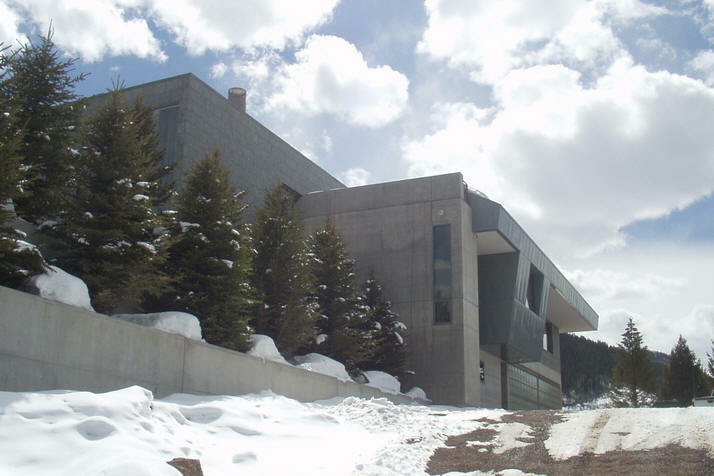 1992 - The Jeffrey and Marilyn Katzenberg House, 7996 Roamer Court, Park City UT. 14,000 square feet. Designed with Rick Otto. 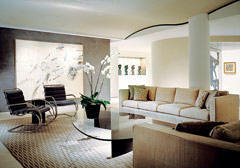 Interior decoration by Naomi Leff. Built by New Star General Contractors. President Clinton stayed here in 1998. In 2007, Goodyear was ordered to pay Katzenberg $2.17 million to replace faulty heating hoses. It was Goodyear's largest settlement to an individual homeowner at the time, as the house was finished with rare and expensive materials which were destroyed in the restoration process. 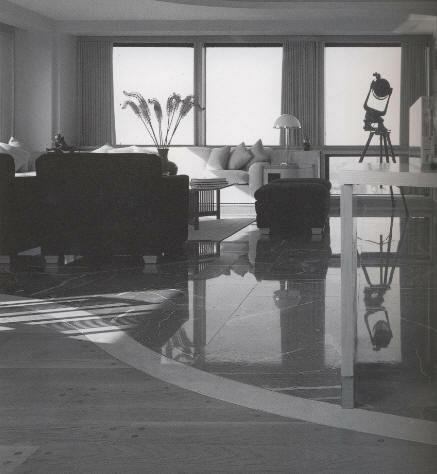 1992 - The Charles and Brenda (Bunny) Koppelman Penthouse Apartment Renovation, aka the Sobel Apartment, located in the Verona Building, 32 East 64th Street #10W, New York NY. 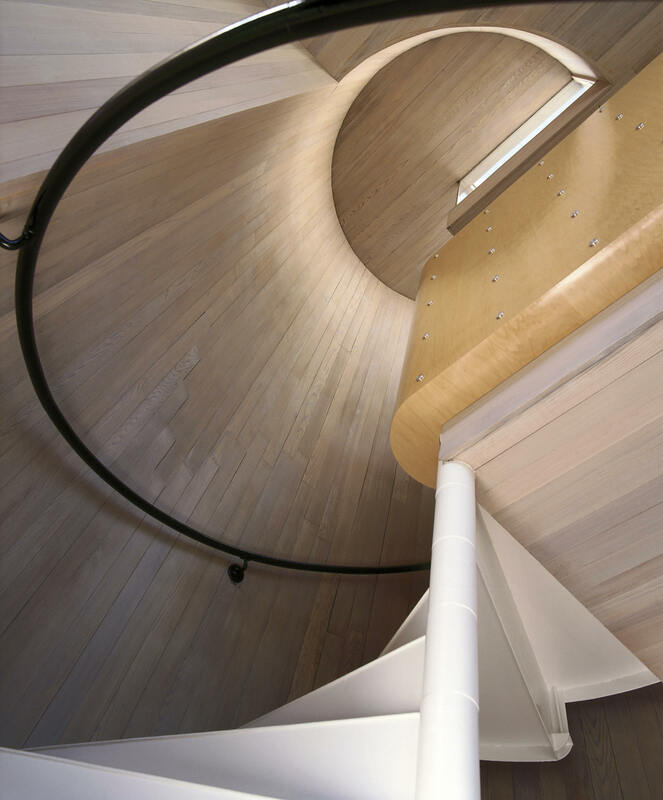 Gwathmey took it down to the studs for a complete makeover. 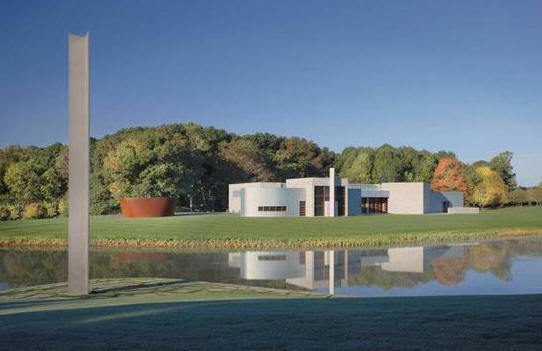 Sold in 2002 to Jonathan S. Sobel and Marcia Dunn, who commissioned Gwathmey for a smaller renovation. Photos by Durston Saylor. 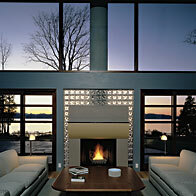 Bottom photo by Chester Higgins Jr. Sold in 2012 to Stephen J. Meringoff. 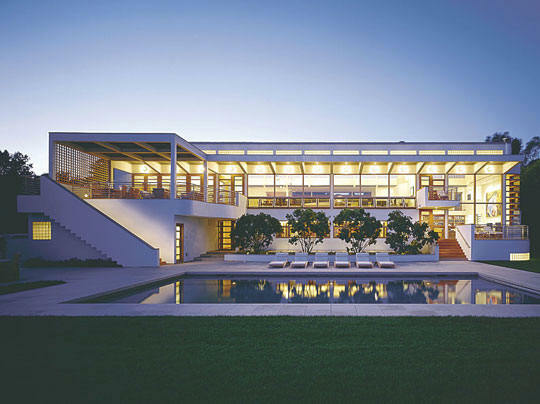 1993 - The Jeffrey and Marilyn Katzenberg Residence, aka the Oceanfront Residence, 22350 Pacific Coast Highway, Malibu CA. Top photo is the view from the Pacific Coast Highway, next photo from the beach. Commissioned 1988. 11000 square feet. Sold to the Gerald D. and L. Breslauer Trust. Bottom photo by Farshid Assassi. 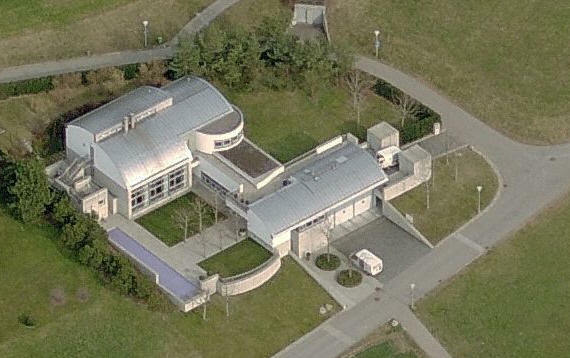 1994 - The Thomas and Christina Bechtler Residence, aka the Zumikon Residence, Rigistrasse and Rigiweg Roads, Zumikon, Switzerland. 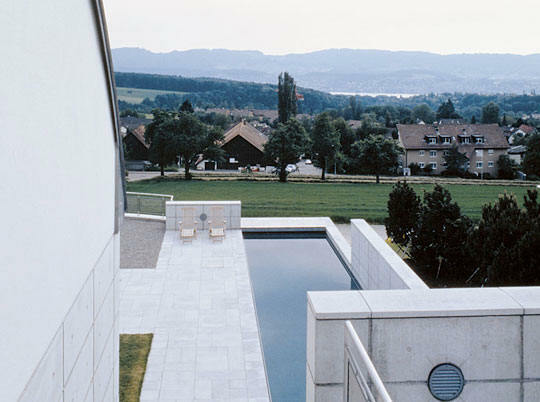 Overlooks Lake Zurich. Commissioned 1990. 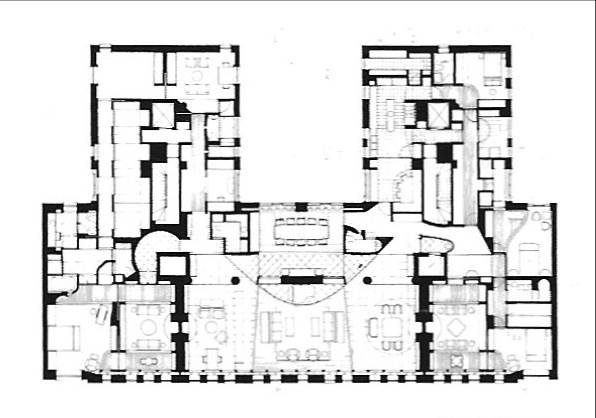 10225 square feet. 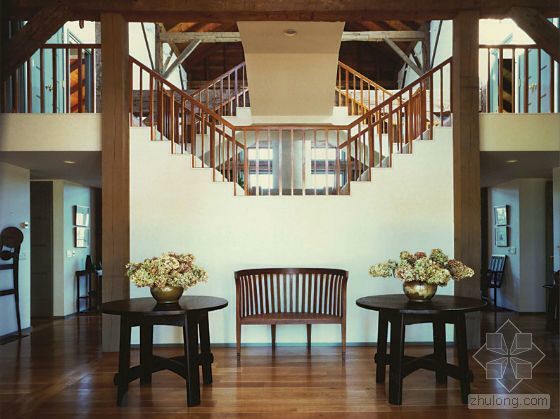 1994 - The Chen Residence, Taipei Taiwan. Commissioned 1990. 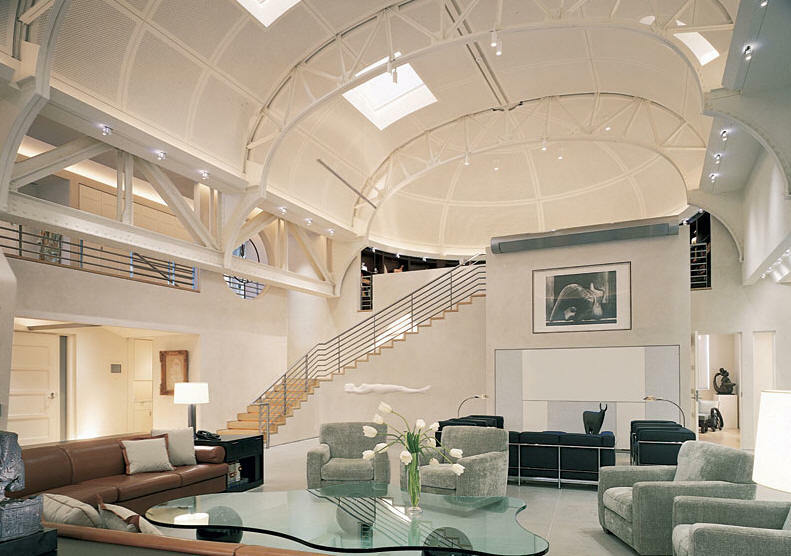 A massive 40,000 square feet. 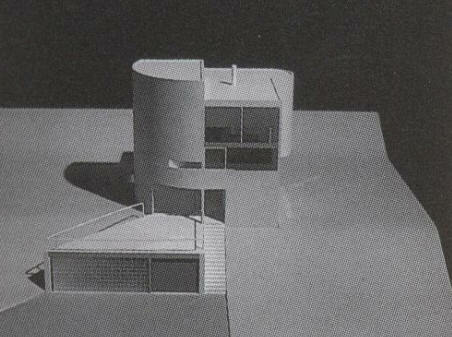 Unbuilt. 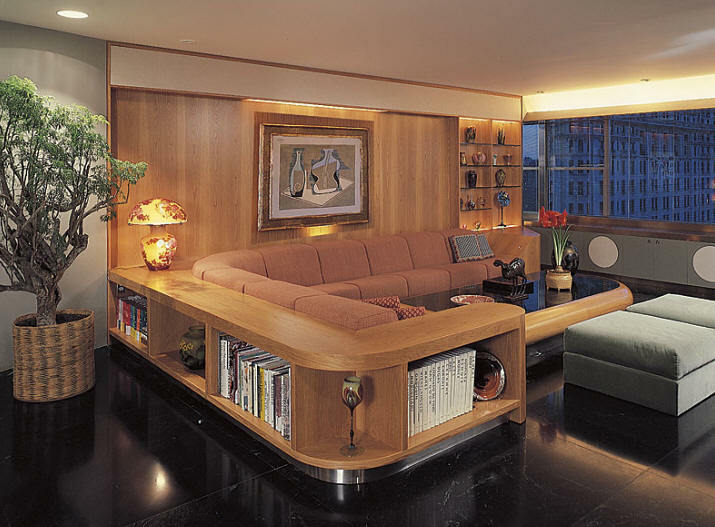 1995 - The Alan and Carol Pomerantz Apartment, aka Park Avenue Apartment, 1185 Park Avenue 5C, New York NY. Gutted down to the studs for its two-year renovation. Commissioned 1994. 2300 sf. Top photo by Hiroko Matsuike. Photos by Paul Warchol. Sold to Herbert and Judith Freeman. 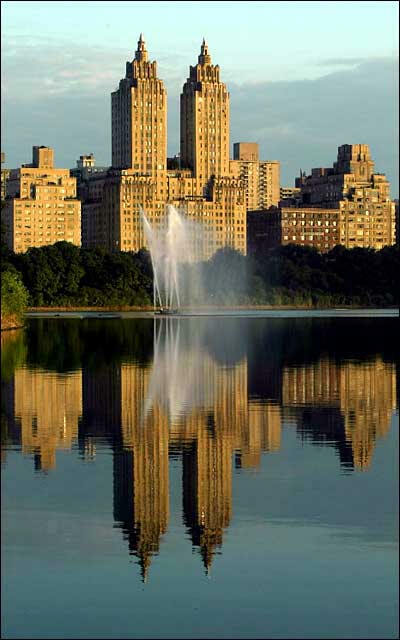 1995 - The Steven Spielberg Apartment II, 145 / 146 Central Park West 13th Floor, San Remo Building, New York NY. 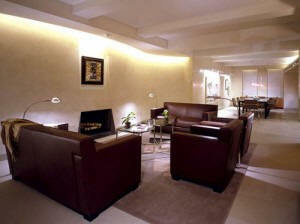 Combination of Apartments 16 D and E into one. 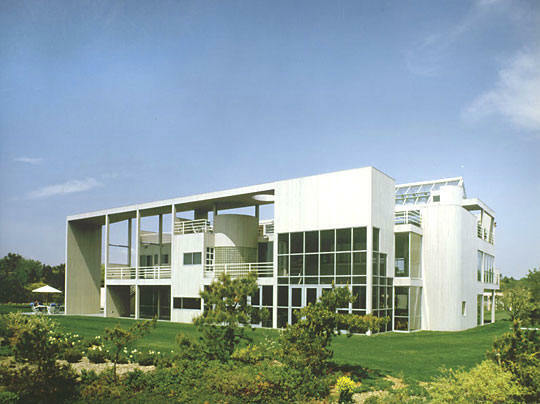 1997 - The Jerry and Ilene Kosberg Residence, aka the San Onofre Residence, 1600 San Onofre Drive, Pacific Palisades area of Los Angeles CA. Consulting Electrical Engineers: Athans Enterprises. Commissioned 1993. 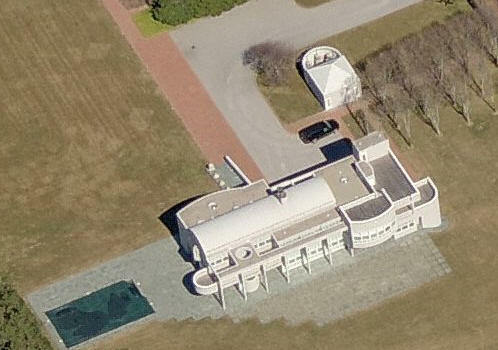 18000 square feet on 1.5 acres. 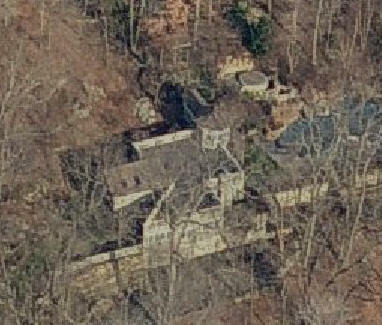 Jerry Kosberg also owned 1571 Casale down the hill next door. 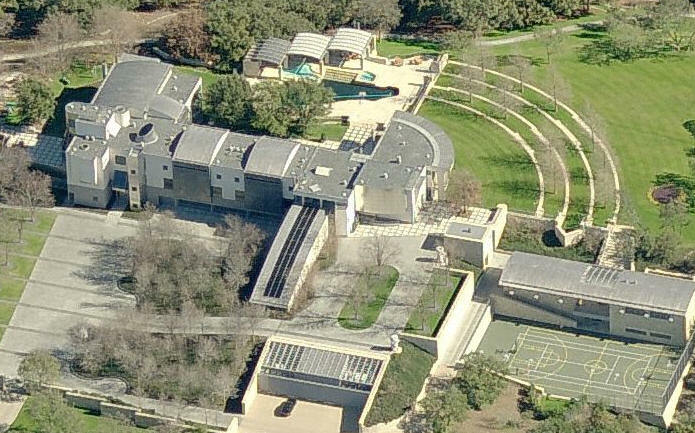 1997 - The Michael Dell Residence, aka Villa Austin, aka the Hilltop House, aka Hilltop Residence, 3400 Toro Canyon Road, Austin TX. 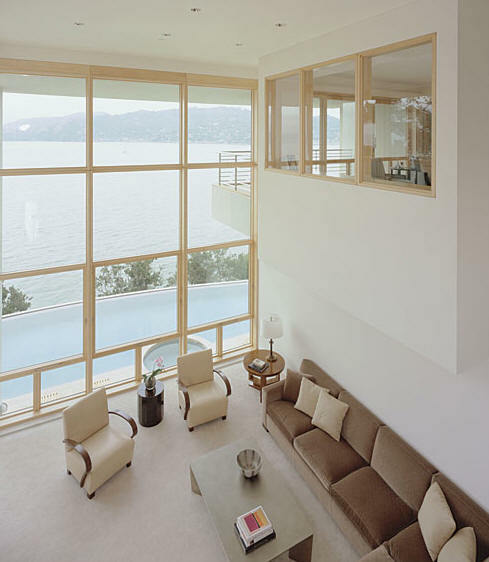 Overlooks Lake Austin. 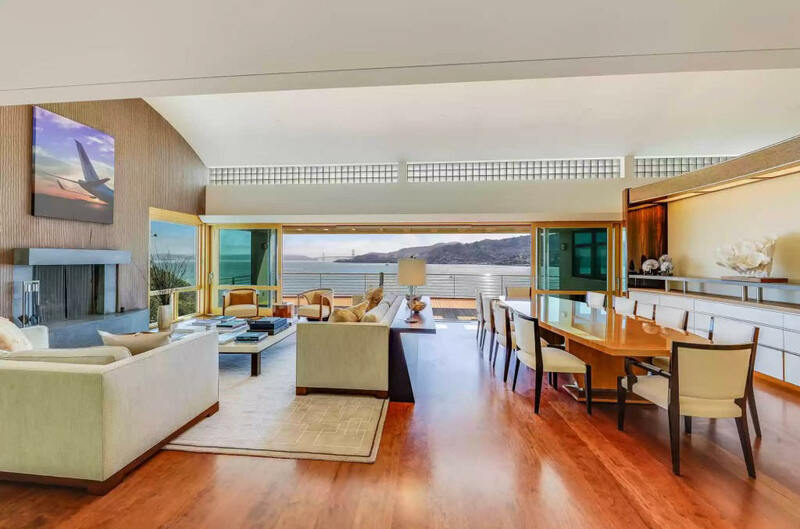 The complex is 33,000 square feet, has 8 bedrooms and bathrooms, 13 half baths, a conference room, a restaurant quality kitchen, an exercise room, an indoor pool, an outdoor pool, cabanas, and a five-level terraced lawn on 85 acres. Commissioned 1993. 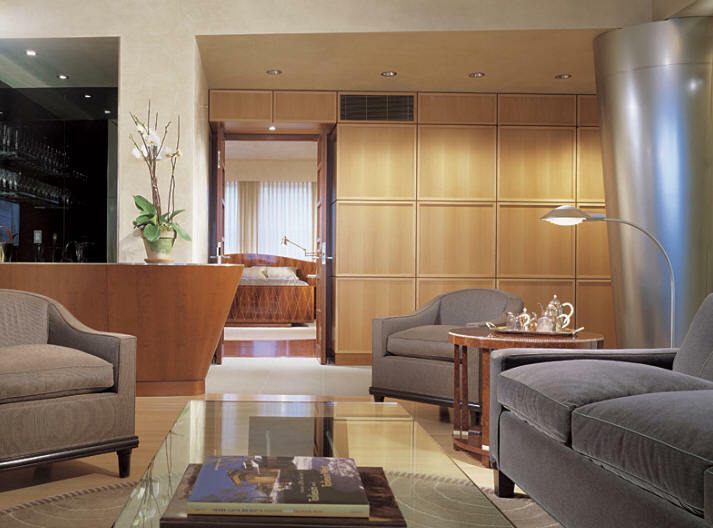 1999 - The Gary Winnick Apartment, aka Fifth Avenue Apartment, located in the Sherry-Netherland Hotel, 781 5th Avenue, New York NY. 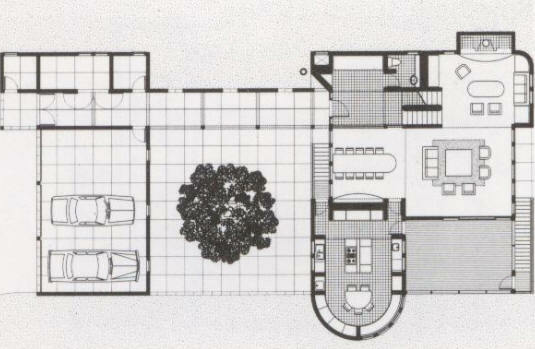 2000 sf. Photos by Paul Warchol. 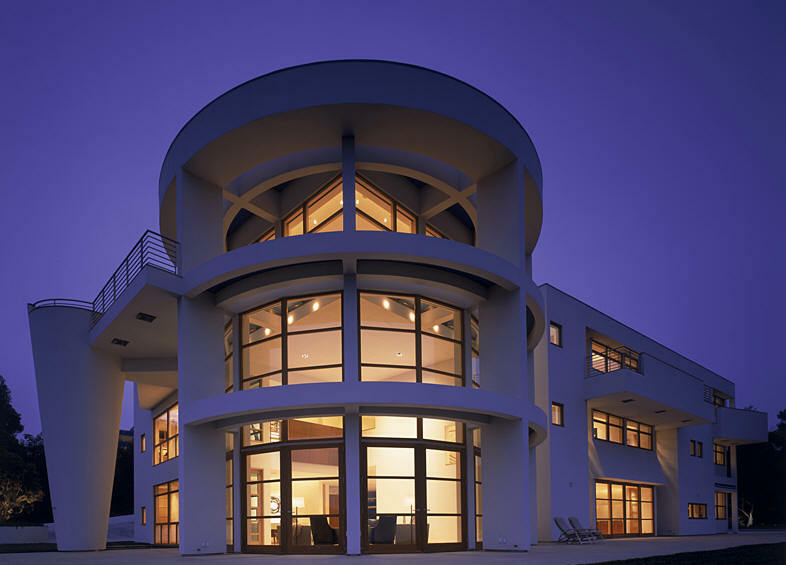 Built by Bernsohn and Fetner. 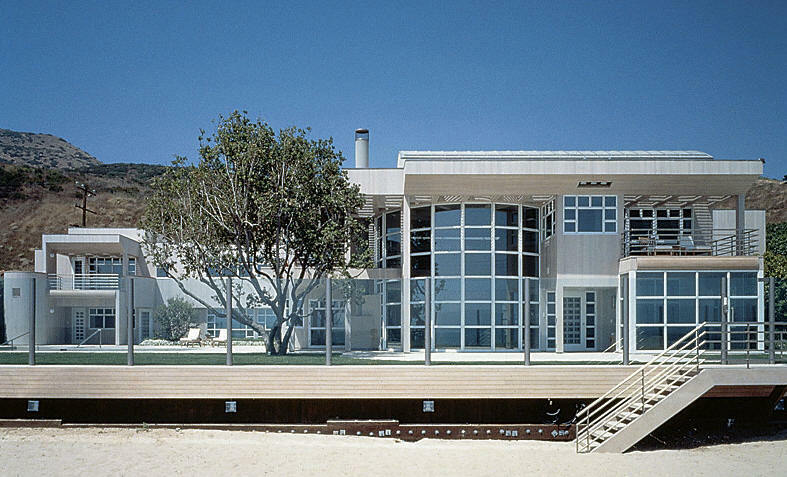 2000 - The Ronald (Ron) Meyer Residence, aka the Malibu Residence, 27600 Pacific Coast Highway, Malibu CA. Commissioned 1993. The top photo was an early 1990's design that was scaled back for a second, smaller version actually built. For sale 2018-2019. 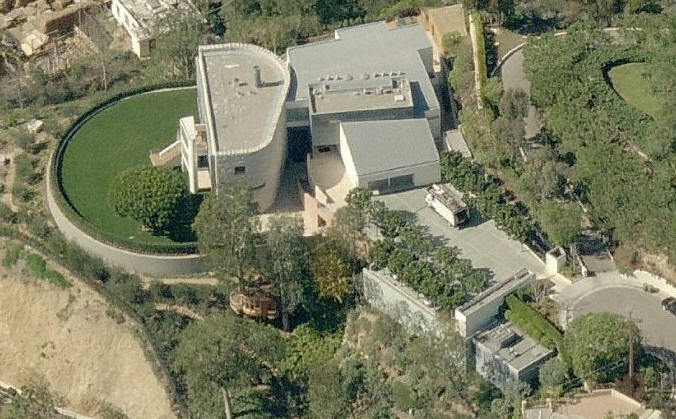 2001 - The Arie and Rebecka Belldegrun Residence, aka Casa Vecchia, aka the Bel Air Residence, 811 Strada Vecchia Road, Los Angeles CA. 15,000 square feet. Deeded to Stuart P. Ross and the Belldegrun Descendants Trust. Top and bottom photos by Scott Frances/Esto. 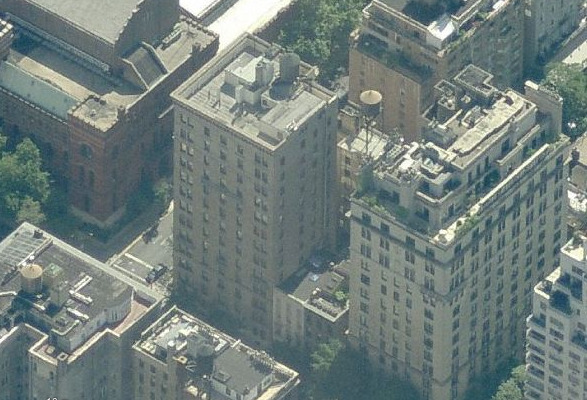 Around 2001 - The Jerry Seinfeld Apartment, aka the Central Park West Apartment, Beresford Hotel, 19th and 20th floors, 211 Central Park West, New York NY. 3800 sf. Photos by Christopher Wild. Planning began in 1998, construction began in 1999. The project architect was Kang Chang. 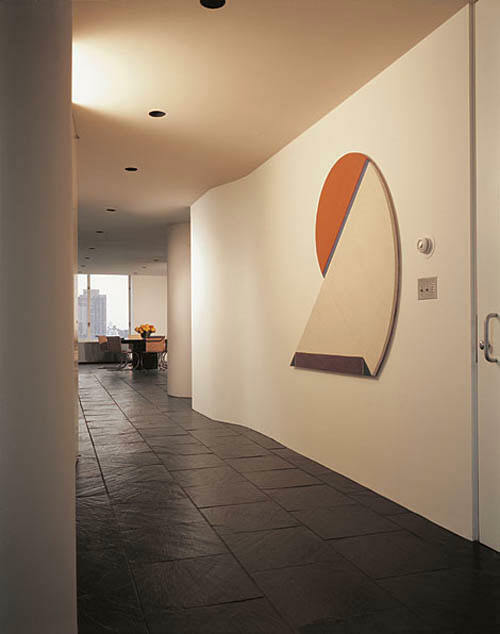 Around 2001 - The David Geffen Apartment II, 783 5th Avenue, New York NY. Another unit in the same building as Geffen I. 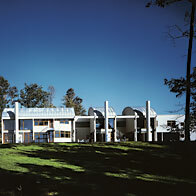 Commissioned 1996. Project architect was Kang Chang. Photos by Paul Warchol. 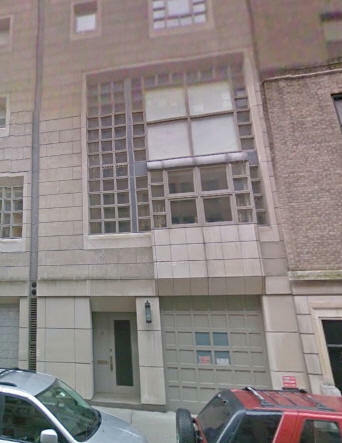 2002 - The Alvin and Joan Einbender Apartment, aka the Gymnasium Apartment, 240 Centre Street 5H, aka the Police Building, New York NY. Located in the 1909 building's former gymnasium. The NY Police Dept. 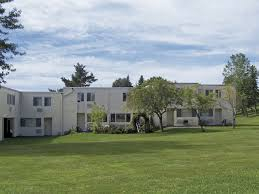 moved out in 1973 and the building was converted to luxury condominiums in 1987. There are 55 apartments on six floors. 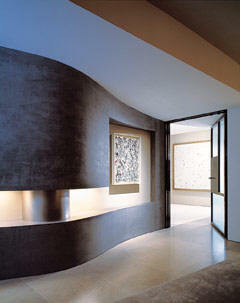 This unit took four years to complete and was the only apartment Gwathmey designed from the ground up. 6600 square feet. On the market since 2008. Photos by Paul Warchol. 2002 - The Ron and Ann Pizzuti Apartment, aka the Miranova Apartment, aka House on the Roof, 1 Miranova Place, Columbus OH. Commissioned 1996. 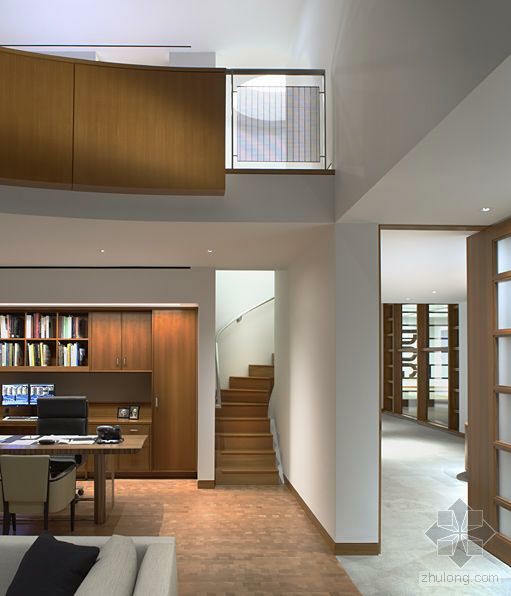 A 12,000 sf two-story penthouse. Photos by Scott Frances. 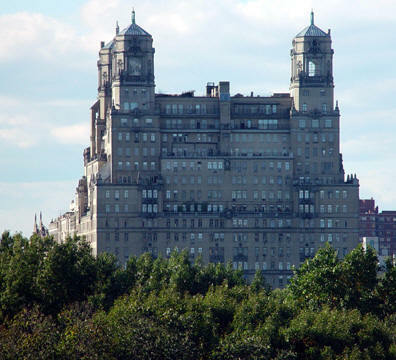 The owners are the developers of the building. 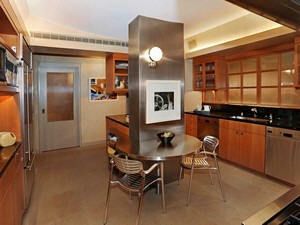 The kitchen, in the center, includes a stainless-steel domed ceiling and a wine cellar. 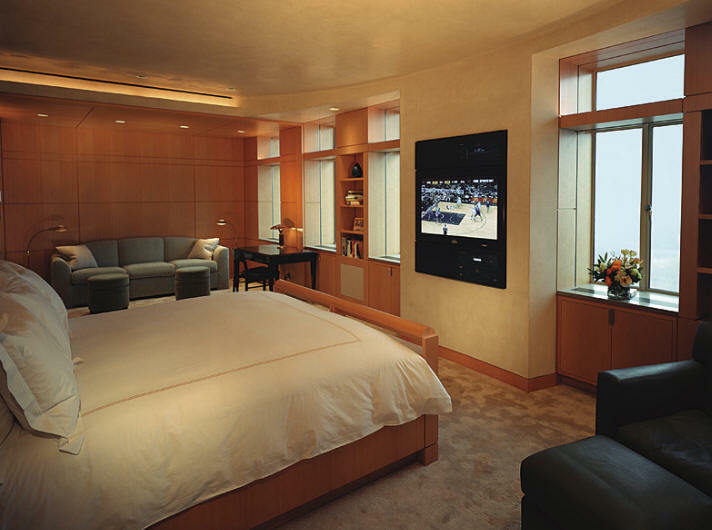 The residence also has a fitness center, book-lined library and guest apartment. 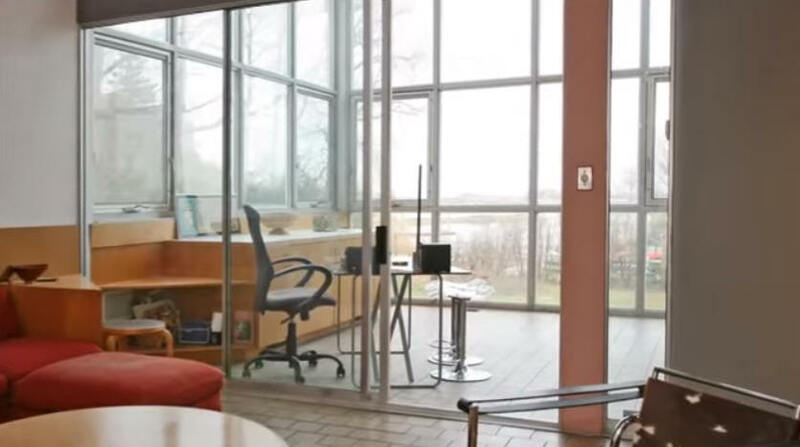 Floor-to-ceiling windows stretch across part of the north side and open to a terrace overlooking the Scioto River and much of the Downtown skyline. 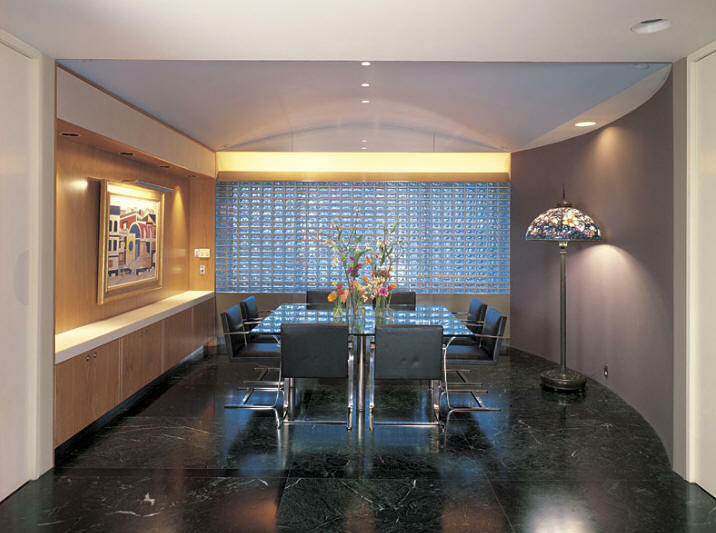 Gwathmey also designed Suite 2600 in the building. 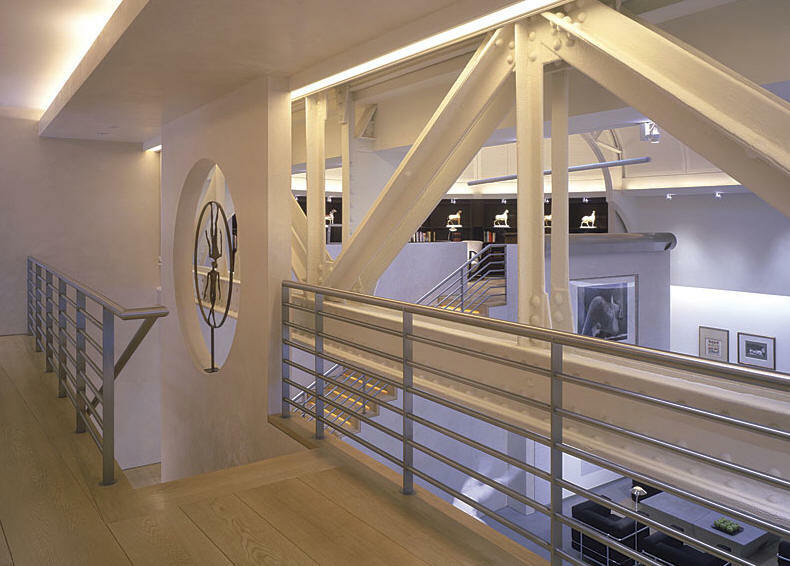 2002 - The Eric Steel Loft, 227 West 17th Street, New York NY. 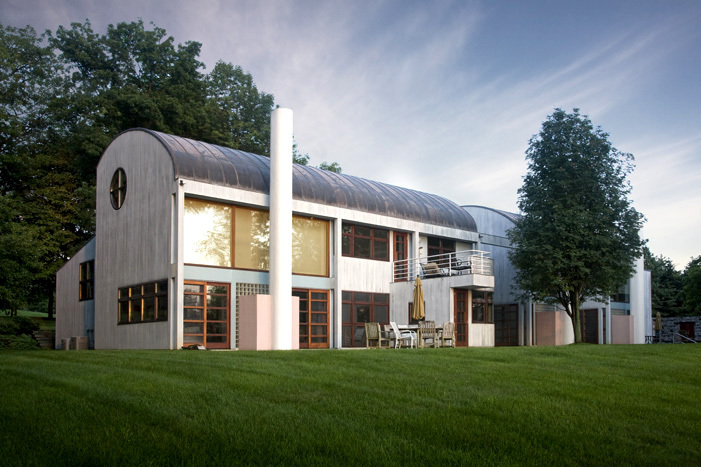 Steel was Gwathmey's stepson. Photos by Paul Warchol. 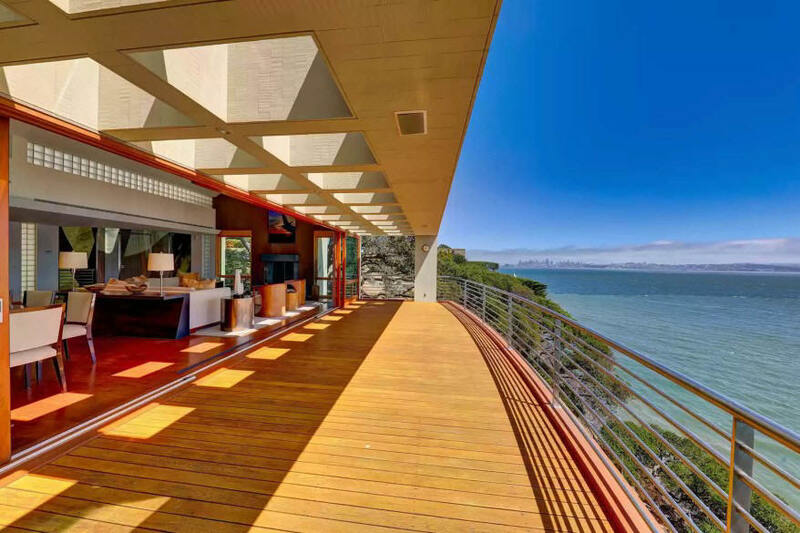 2003 - The Reza Abbaszadeh Residence, aka the Belvedere Residence, aka At The Water's Edge, 445 Belvedere Avenue, Belvedere Tiburon, CA. Photos by Mark Schwartz. 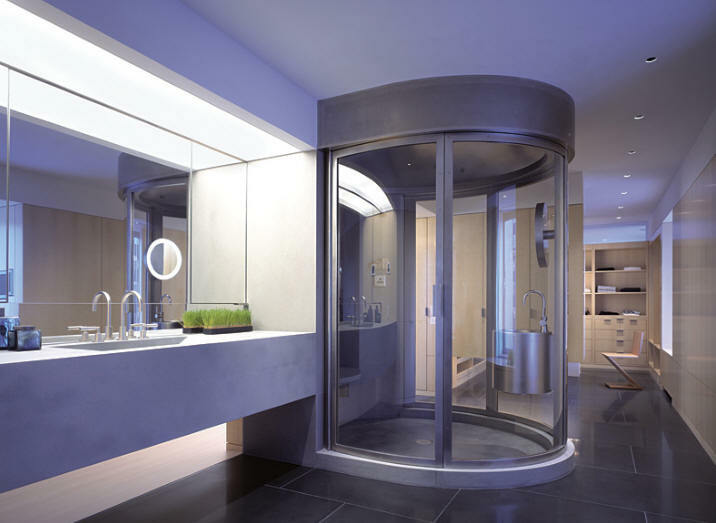 Four bedrooms, six bathrooms, over 8000 sf, and an elevator. 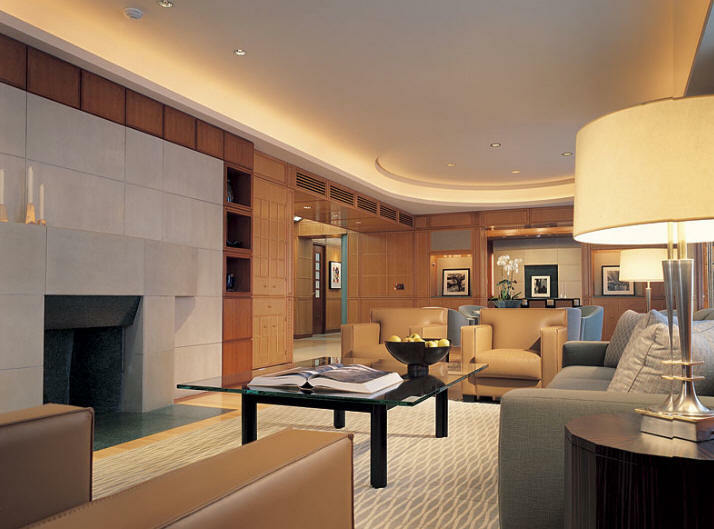 Sold in 2007 to Settling, Ltd.
2004 - The Mitchell Rales Apartment, aka the Central Park South Apartment, one floor of the Ritz Carlton Hotel, 50 Central Park South, Apartment 25, New York NY. 8,000 sf. Commissioned 2001. Project architect was Celeste Umpierre. Photos by Scott Frances/Esto. 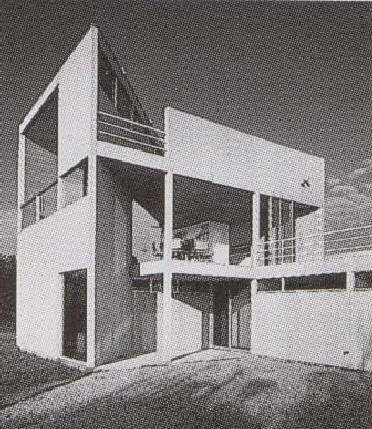 Built by Bernsohn and Fetner. 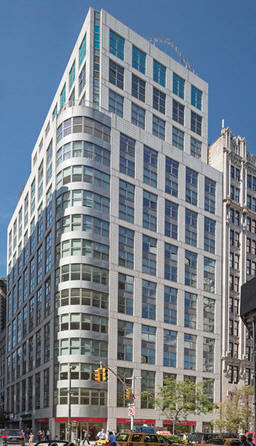 Around 2004 - 100 West 58th Street PH-2, New York NY. 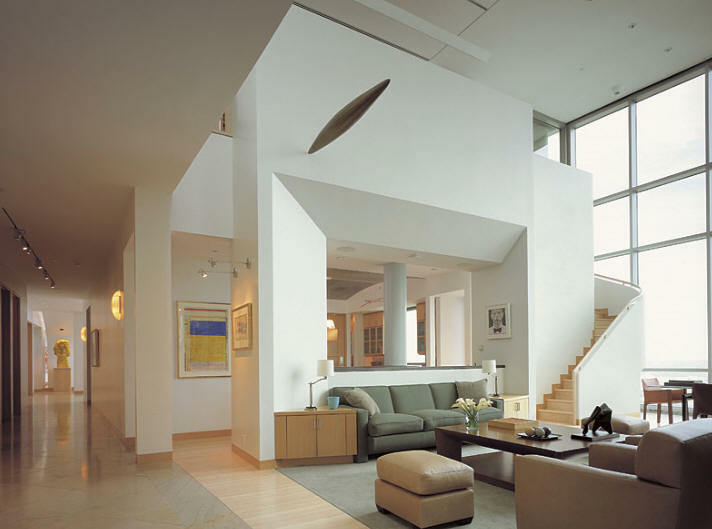 One of two penthouse apartments Gwathmey renovated in this building. 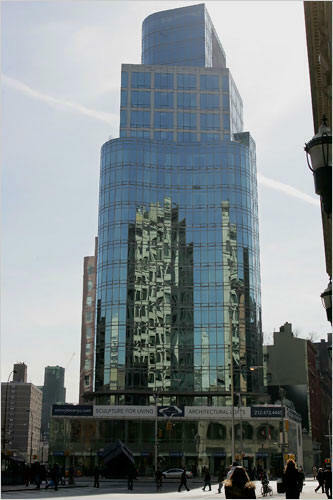 2005 - The Astor Place Tower at 445 Lafayette Street, New York NY. 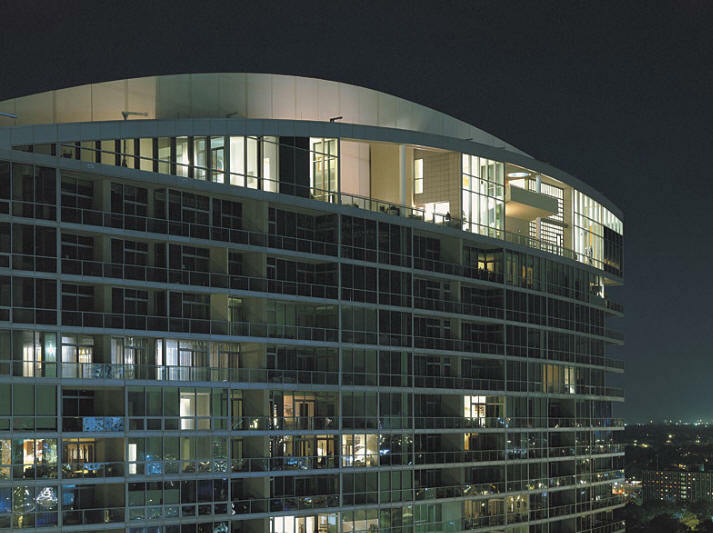 The 270-foot, 21-story asymmetrical tower features of 39 loft residences, with interiors designed by Gwathmey Siegel along with Ismael Leyva Architects. 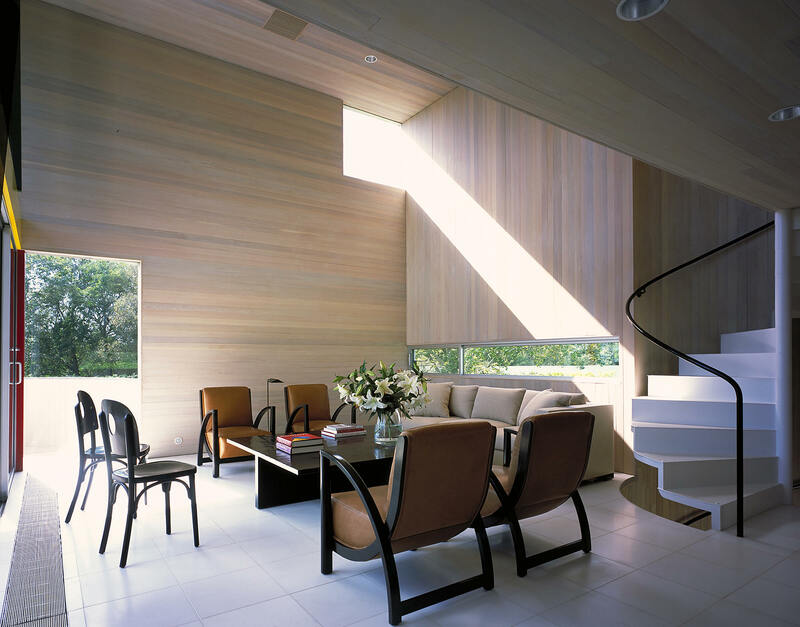 2003 - The Jonathan Sobel and Marsha Dunn Residence, 733 Daniels Lane, Sagaponack NY. Commissioned 2000. 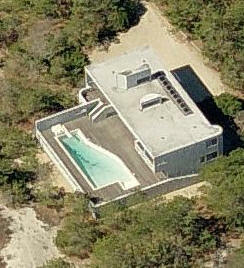 Includes deeded ocean access, 8000 sf. 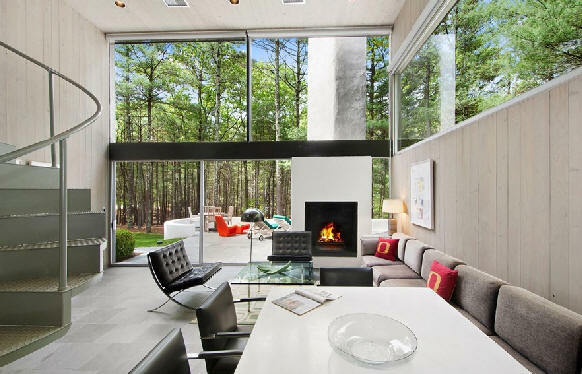 Landscape design by Ed Hollander on 2.5 acres. 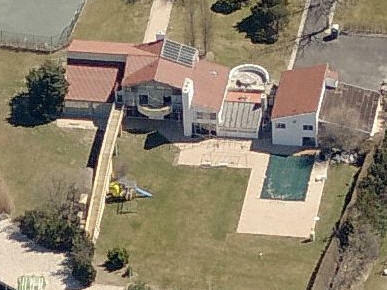 7 bedrooms and 11.5 bathrooms. Deeded to their LLC, Sagg Holding. Sold in 2014 to Daniels Lane Sch LLC. 2006 - The Villa Jumeira at Dubai. 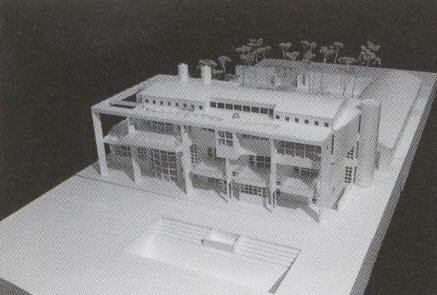 Unbuilt. 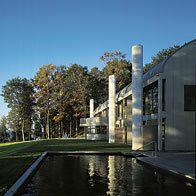 2006 - The Mitchell Rales Residence and Museum, aka Glenstone, 12002 Glen Road, Potomac MD. Closed to the public except by special arrangement. 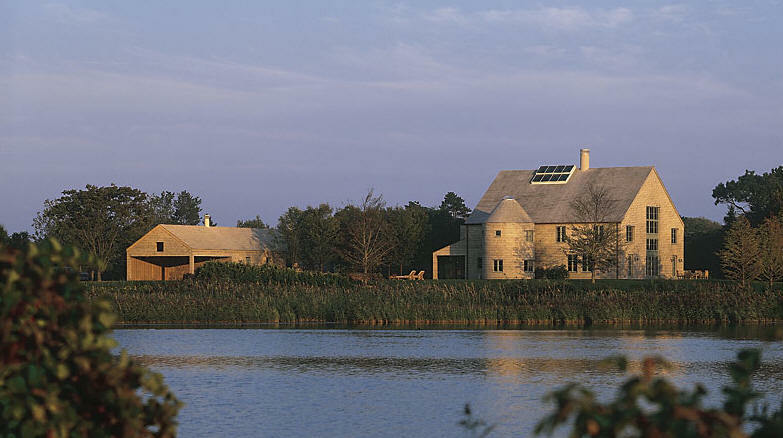 The 200+ acre site, top photo, includes the Rales House and Guest house (second ahd third photos), and across the lake is his private art museum (last exterior photo by Scott Francis/Esto). 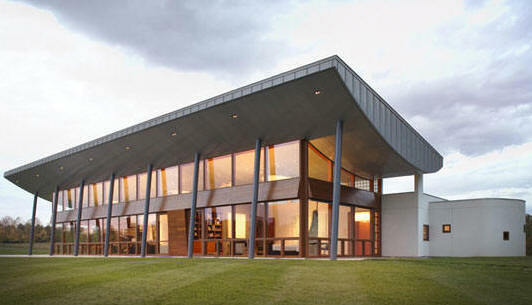 Structural engineering by Severud Associates. 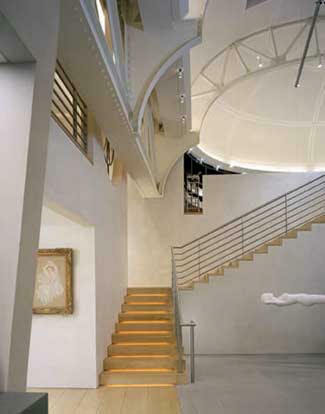 Built by Harold Gray of Lifecraft, Inc. Civil Engineering by A. Morton Thomas and Associates, Inc. Bottom interior photos of the museum by Zhulong.com. 2007 - The Michael and Susan Dell House, aka the 6D Ranch Lake House, aka the 6D Home, Commons Ford Ranch Park Road on Lake Austin, in Bee Cave TX, northwest of Austin TX. 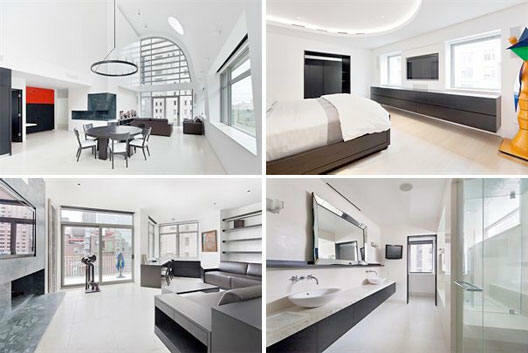 6380 square feet. 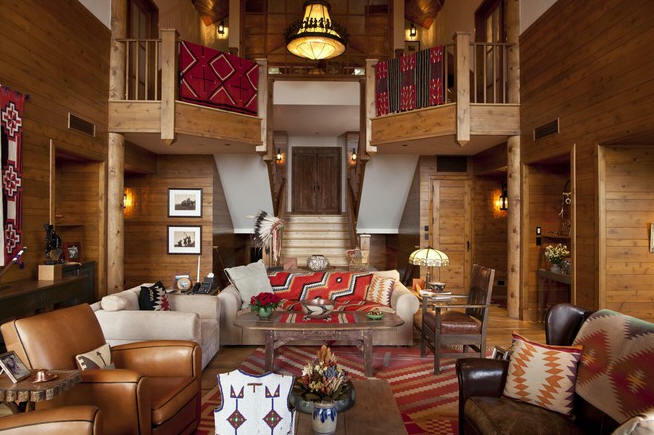 Owned by 6D Ranch LTD, controlled by DFI Resources LLC, belonging to Michael and Susan Dell. 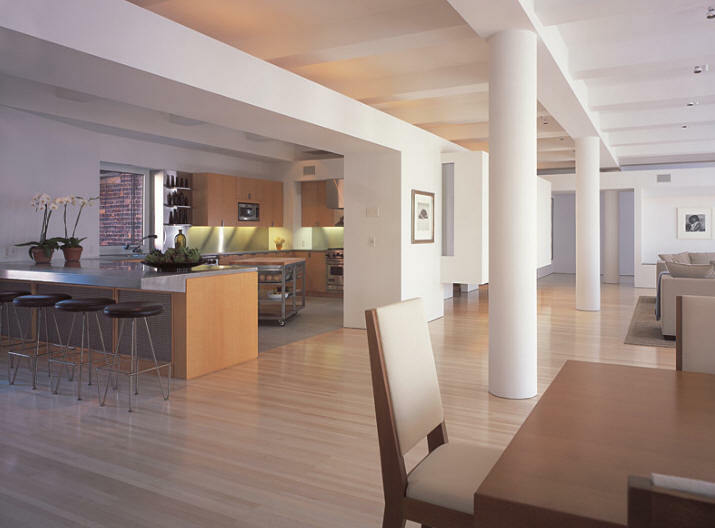 2007 - 311 West Broadway, Townhouse TH-2, New York NY. Private entrance off Wooster Street. Sold July 2010. Sold September 2010. 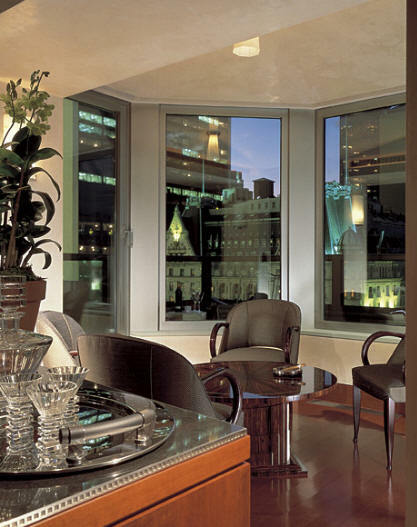 2007 - The John Michael Evans Apartment, aka Apartment 40/41, 15 West 63th Street #40, in the Park Laurel building, New York NY. 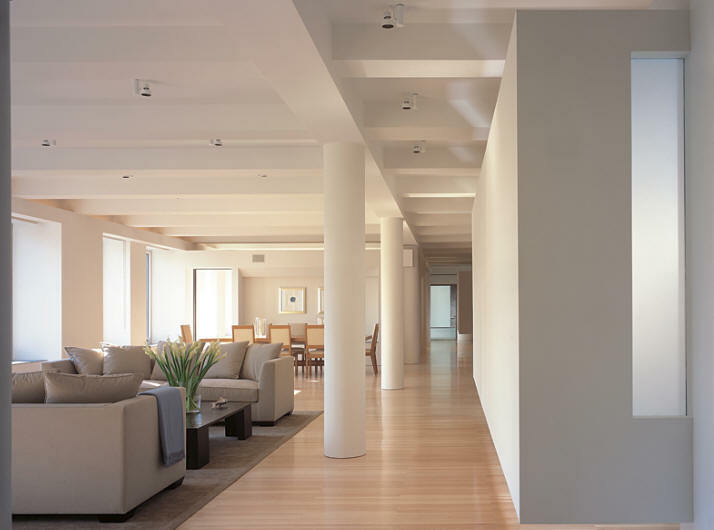 Horizontal merger of two penthouse apartments into a 5000 sf space for a family of 7. Top photo by Paul Warchol. 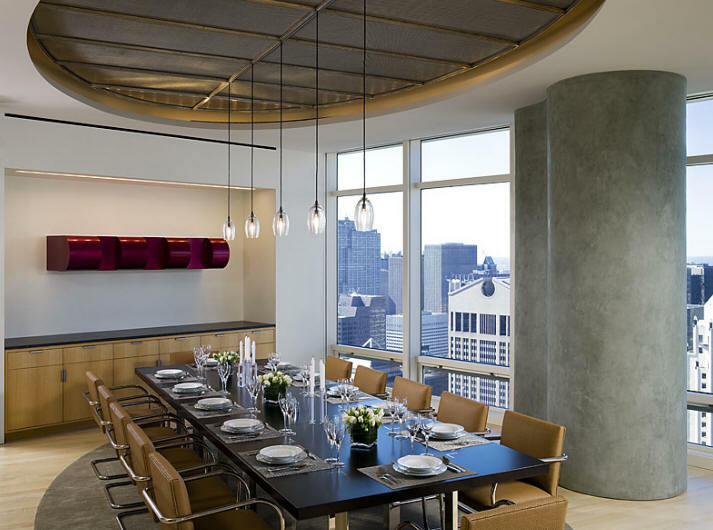 2008 - The Steve Cohen Penthouse Apartment Renovation, aka Apartment 51/52 West, the 51st and 52nd floor of the Bloomberg Building, 731 Lexington Avenue, aka One Beacon Court, aka 151 East 58th Street, New York NY. About 8400 sf. Merger of two apartments vertically into one, requiring floor removal. Photos by Paul Warchol. 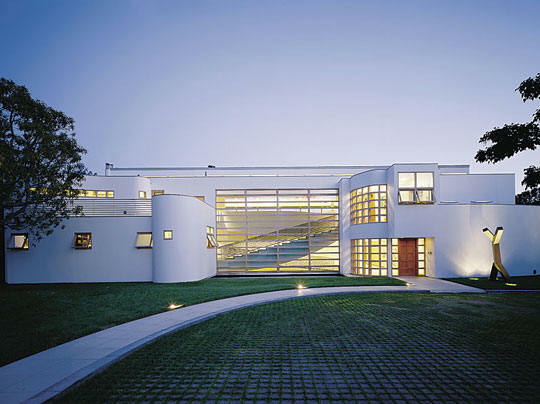 Built by Bernsohn and Fetner. For sale 2013-2014. 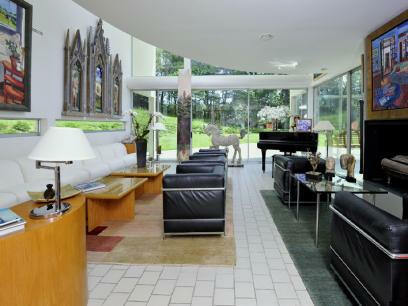 2008 - The Terry Semel Guest House, 408 Further Lane, East Hampton NY. About 1600 sf. The addition of a kitchen violated zoning ordinances and started a war of litigation with neighbor Jonathan Sobel. 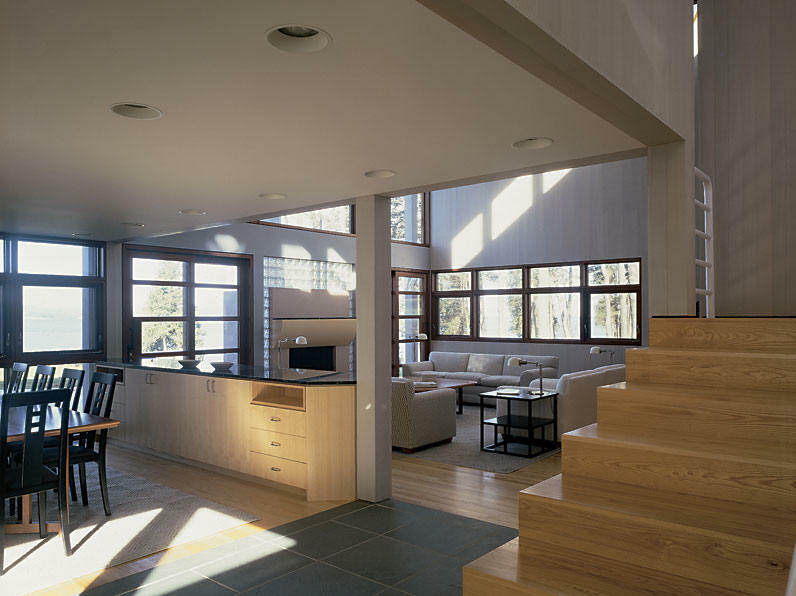 Built by Bulgin and Associates. 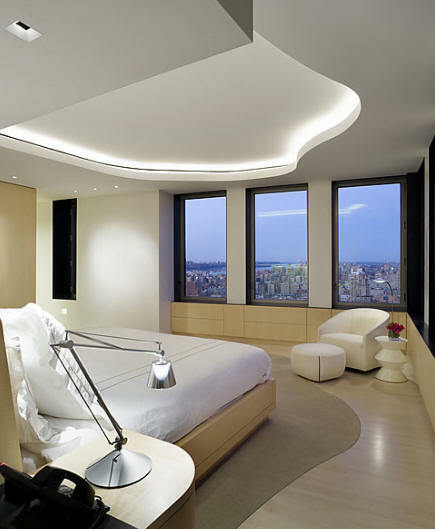 2008 - The Setai Hotel and Residential Tower, 400 5th Avenue, New York NY. Commissioned 2006. 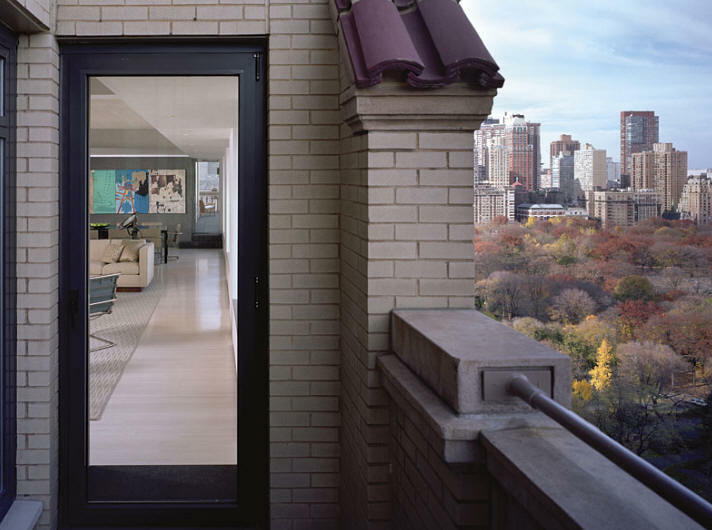 2009 - The Marlo Thomas and Phil Donahue Penthouse Renovation, 875 5th Avenue, New York NY. 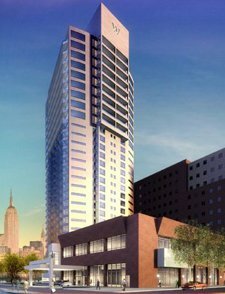 It's at the top of a 12 story building overlooking Central Park, Engineering by Silber. 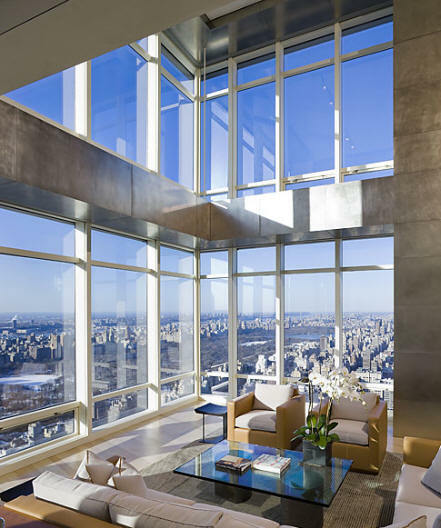 2010 - aka the Fifth Avenue Penthouse, aka 956 Fifth Avenue Duplex, aka the Upper East Side Residence, 956 Fifth Avenue, New York NY. Commissioned 2007. Located on the top two floors. Built by Bernsohn and Fetner. Photographs by Paul Warchol. 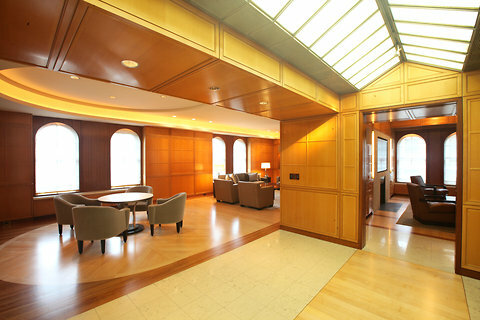 2009 - 240 Park Avenue South, New York NY. Commissioned 2004. 54 luxury residential units with office and retail below. Photo by Paul Warchol. 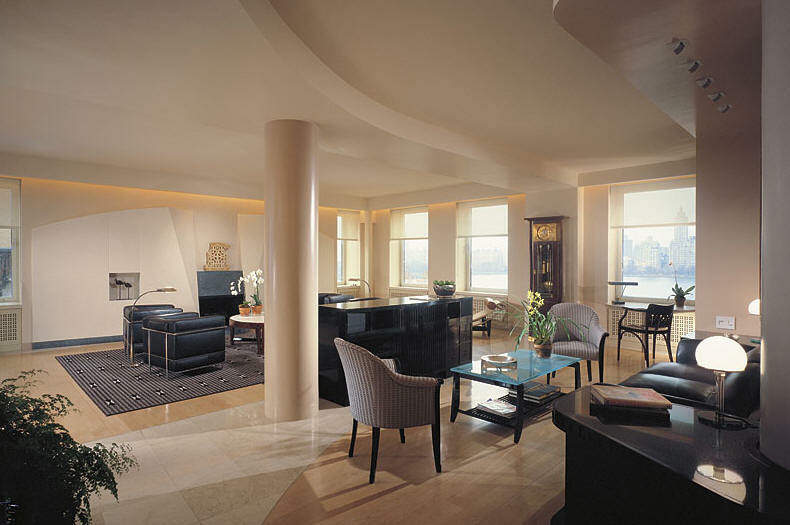 2009 - The Harry and Linda Macklowe Apartment, aka the M-1 Apartment, 7th floor of the Plaza Hotel, New York NY. 17,000 sf. 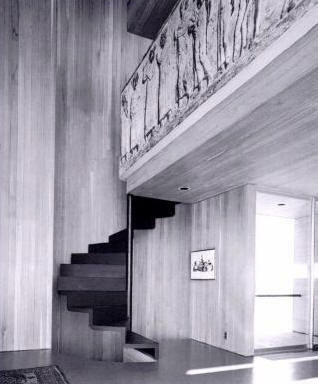 Project architect was James Ballard. Commissioned 2007. The couple divorced. 2009 - Apartment 1805, The W Hoboken Hotel and Residences, 225 River Street, Hoboken NJ, one of 40 residences in a hotel tower. 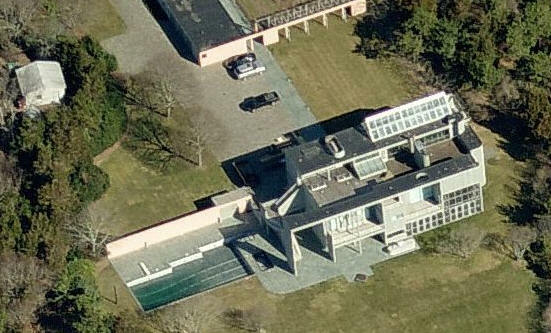 2009 - The Blair and Cheryl Effron House, aka Wayward Point, aka Sag Harbor Residence, 34 Long Point Road, Sag Harbor NY. 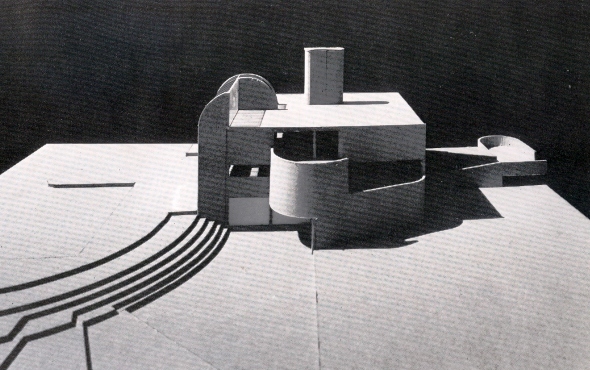 Unbuilt. 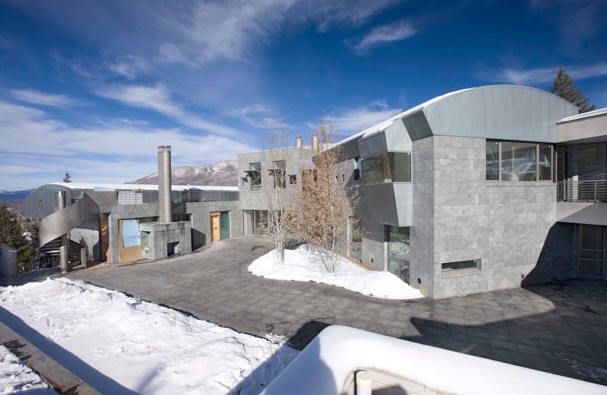 2010 - aka the Aspen Residence, aka the Three Trees Residence, 1 Toby Lane, Aspen CO. Commissioned 2006. Owned by Three Trees LLC, a holding company run by Warren Kanders. 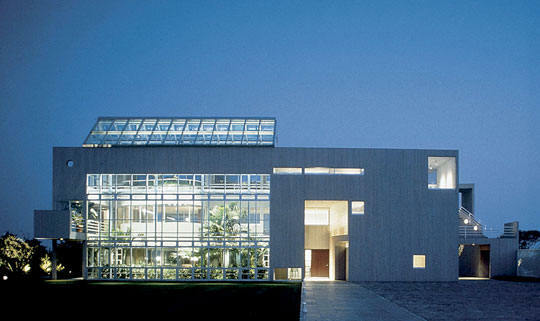 Project architect Dirk Kramer. On the side of Shadow Mountain. 15000sf. 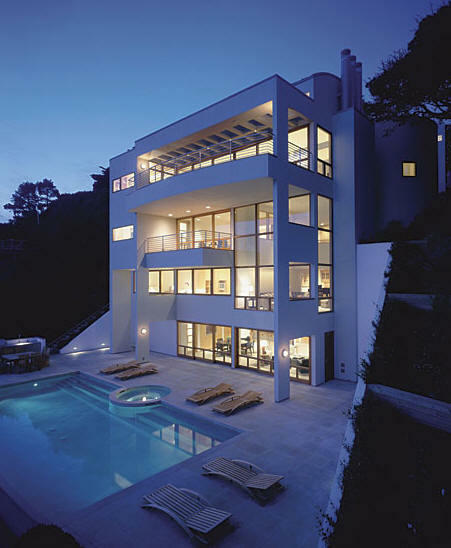 Built by Harriman Construction. Structural Engineers, KL&A, Inc. 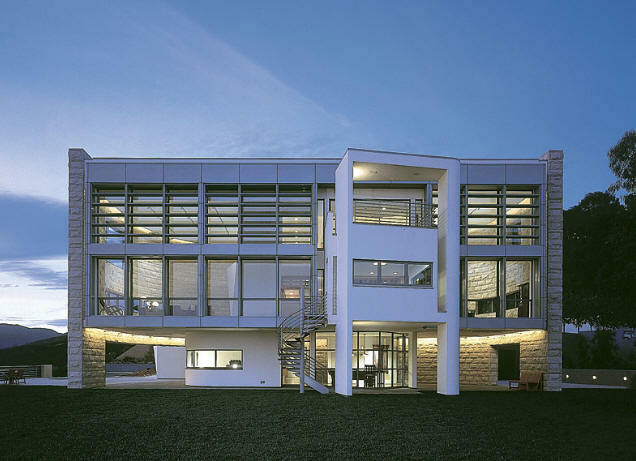 Mechanical by Beaudin Ganze Consulting Engineers. Lighting by HDLC Architectural Lighting Design. 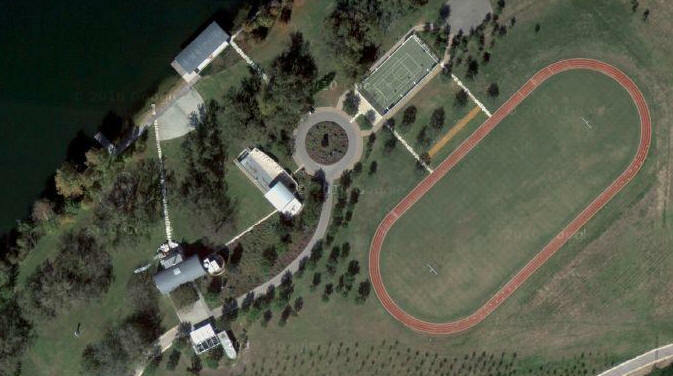 9.4 acres. 2010 - The W Hotel New York hotel and residential tower, 123 Washington Street, New York, NY. Commissioned 2005. 2010 - Apartment 15, New York NY. Almost nothing is known about it. Do you know where it is? 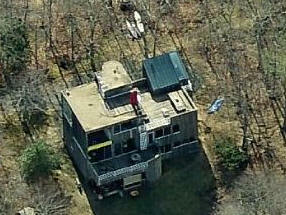 2011 - The Mitchell Rales House, aka Ruthy's Way, 137 Peabody Drive, Northeast Harbor, Mount Desert Island ME. 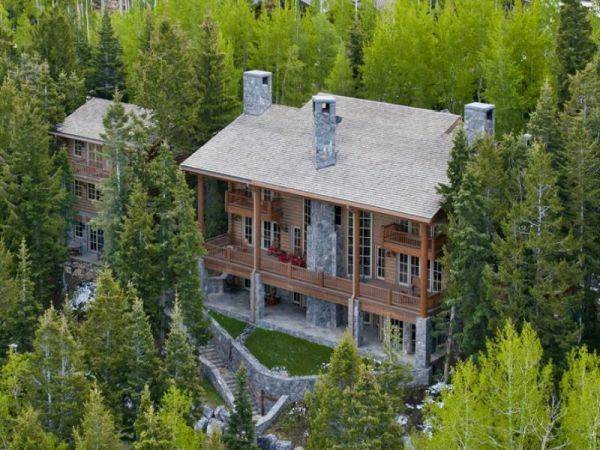 2011 - aka the MS4610 Cabin, Aspen CO. Owned by the same people as Three Trees, above, under MS4610 Holding Company LLC. Unsure if built. 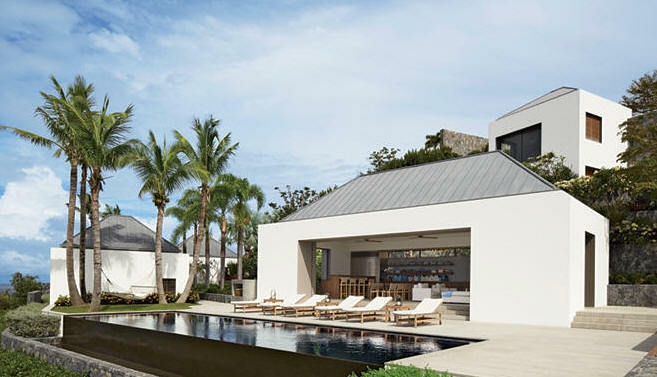 2010 - The Larry Gagosian Villas, Saint Barthélemy (aka St. Barth's), Colombier, French West Indies. Commissioned 2009. 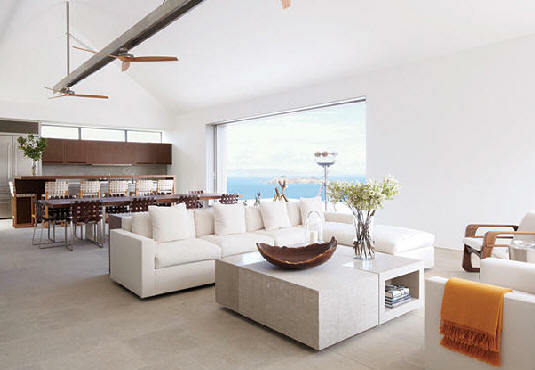 Has a stunning view of St. Maarten just a few miles away. 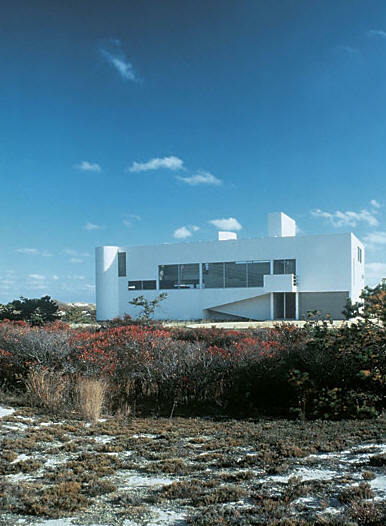 The project architect was Kang Chang who finished it after Gwathmey's death. The plan consists of two levels: On the lower is six guest villas, one of which holds a living room, kitchen, dining area, and gym. On the more private upper level is a master bedroom villa, plus another containing a living room, dining room, and kitchen. 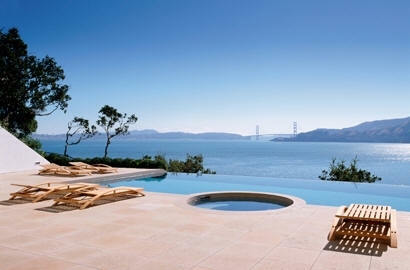 Each level has its own pool and terrace. 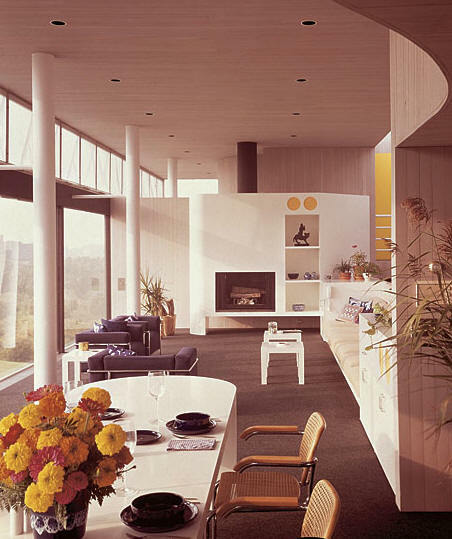 Photos by William Abranowicz/Architectural Digest. 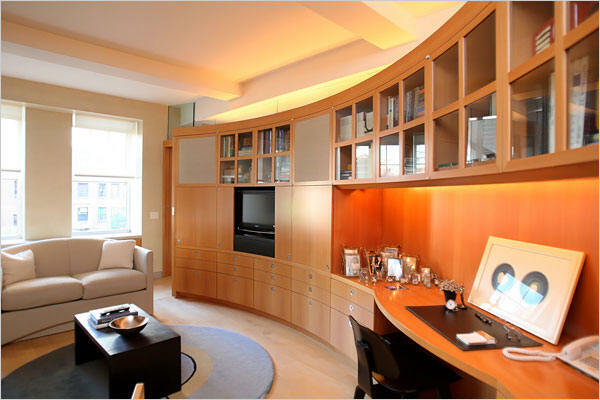 2012 - Gwathmey's last residential design, 323 Park Avenue South Condos, New York NY. 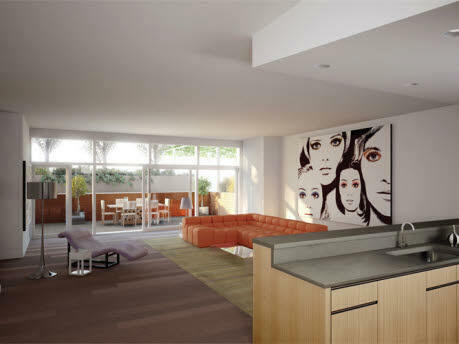 16 half–floor residences, 1350 square feet each. 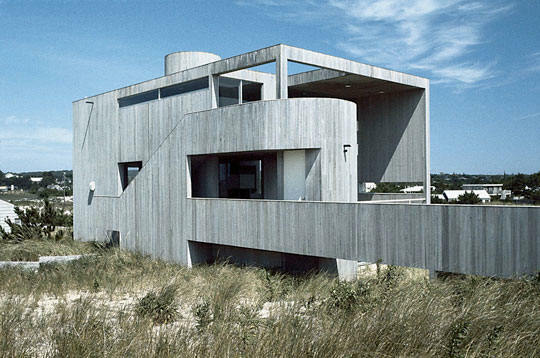 Sources include: The New York Times, Mario Roy, Virtual Globetrotting, AIANY, Gwathmey Siegel, Conde Nast Traveler, Blockshopper Long Island, In Search of Clarity: The Architecture of Gwathmey Siegel & Associates Architects.